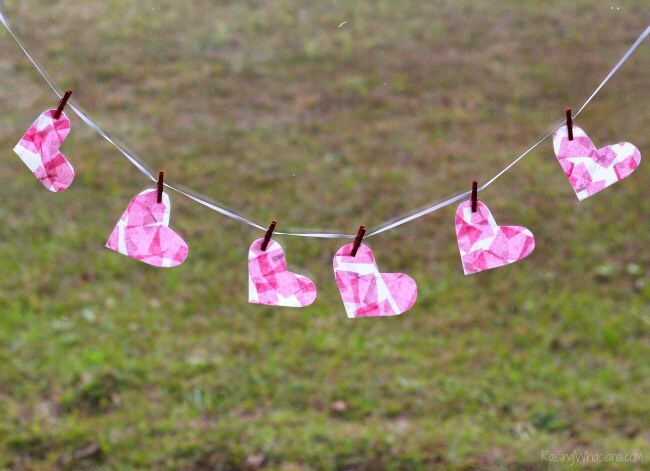 20 Valentine’s Day arts and crafts ideas: Create valentine heart pockets, sun catchers, and more special projects for February with a few basic supplies. 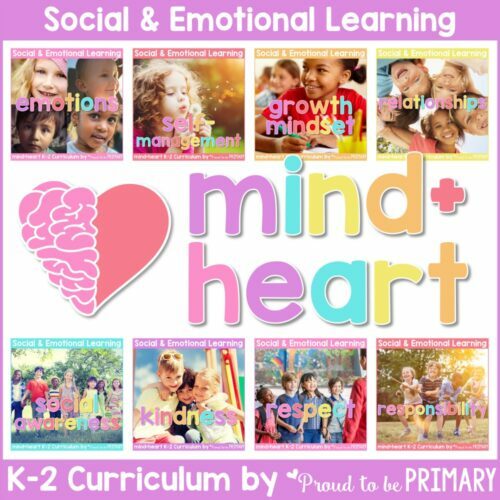 Valentines is a great time to teach kids about friendship and caring for each other and what better to symbolize that, than hearts. 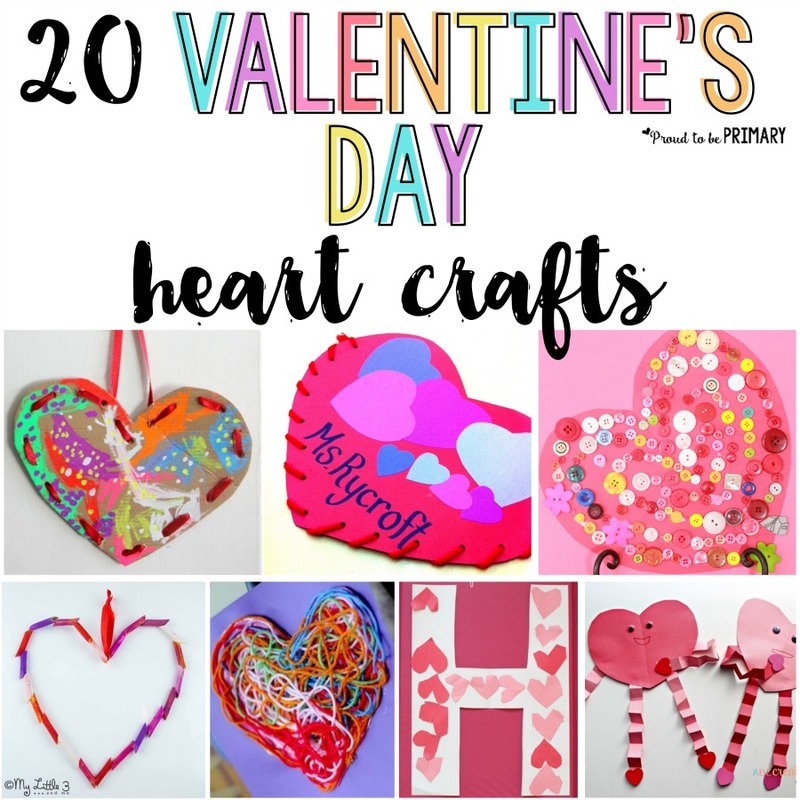 There are so many fun hands-on craft projects that your classroom will be bursting at the seams with all this love! Heart themed projects are a great way to celebrate Valentine’s Day with your students. Some of my students’ favorites I’ve done in the past are the heart pocket and heart butterflies. I’m sure they’ll be a hit with your class as well! The Valentine’s Day heart pockets are one of my favorite projects to do with the class. You need paper, scissors, a hole puncher, and yarn for this project. An easy and fun project that will get little fingers working. Makes the perfect place for holding valentine cards! 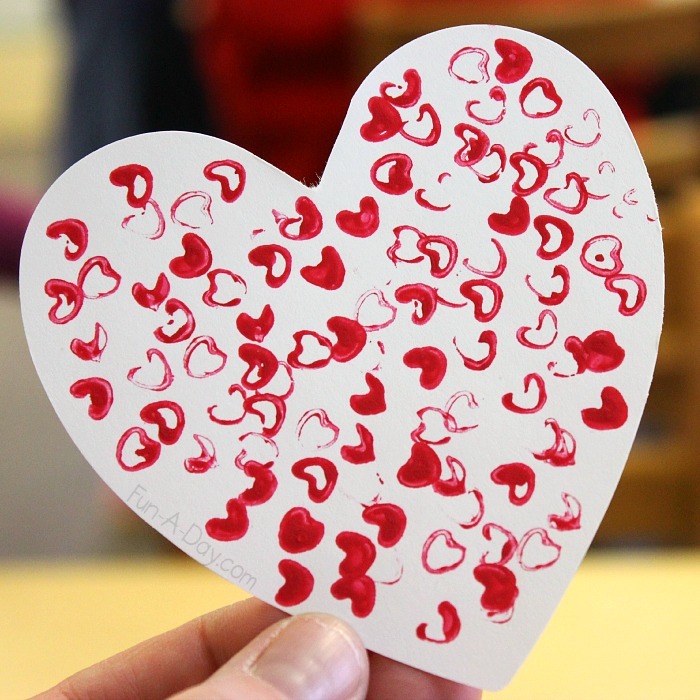 Making bead and pasta hearts is a great opportunity for your students to work with patterns and threading. Also, kids love having something neat and personalized that’s just for them. 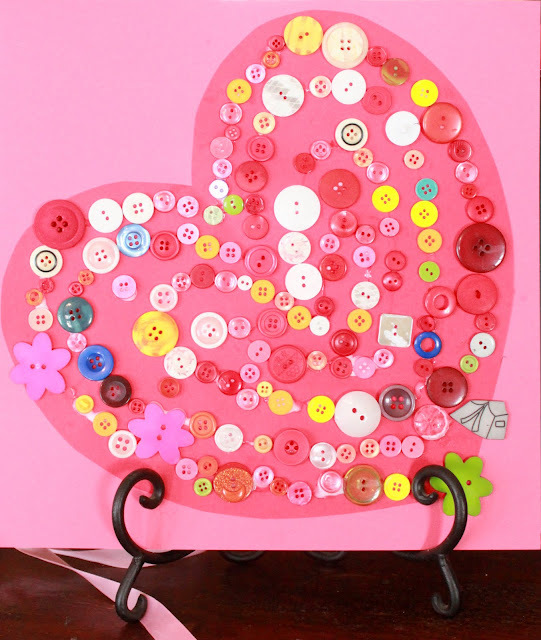 To make a heart button project, you will need scrapbook or construction paper, glue, and colorful buttons. By using a variety of buttons, students can start the project by separating the buttons into piles of the same type. They can also work on making patterns when they decorate their hearts. 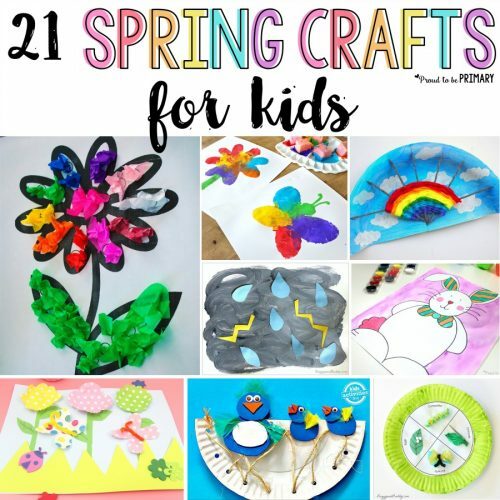 Kids love being crafty – that’s no secret. 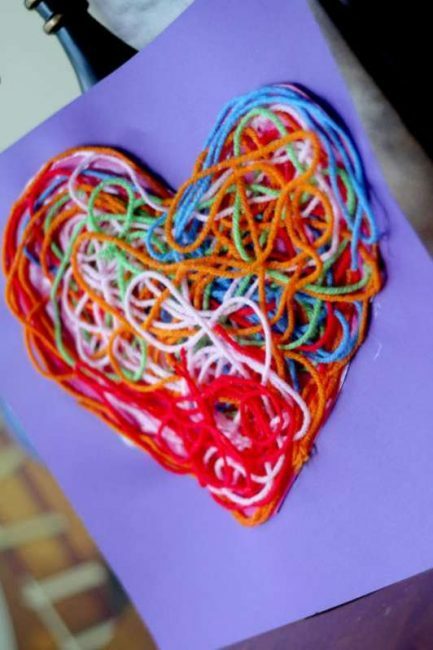 Break out the yarn and glue and watch your students’ eyes light up as they create beautiful and colorful textured yarn hearts. 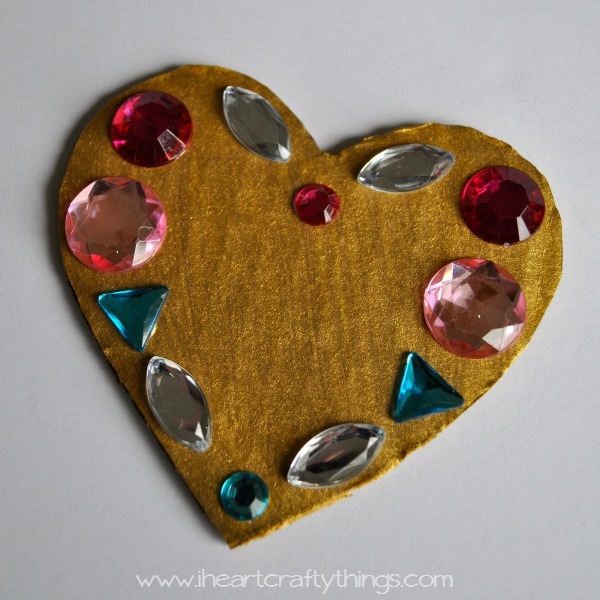 Making a jeweled heart teaches students about symmetry and patterns. 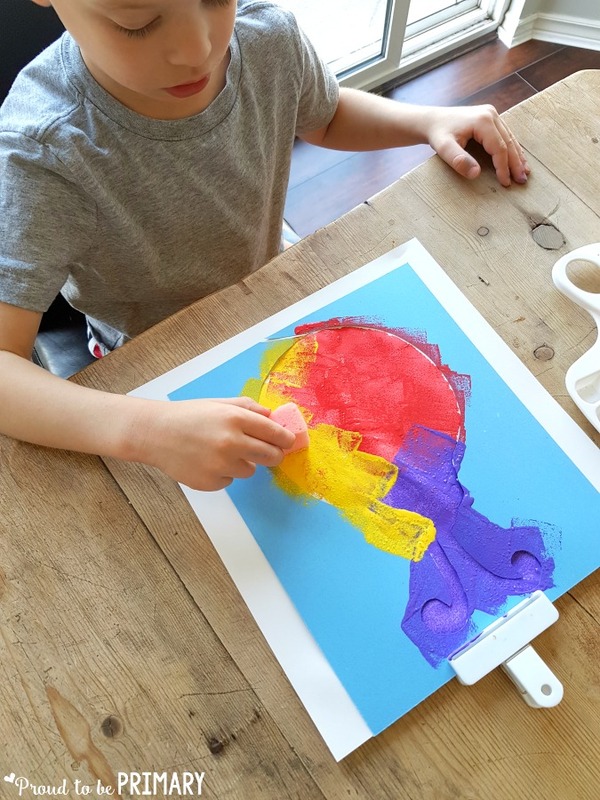 And in the process of learning those, they create gorgeous pieces of art you can either display in the classroom or send home for their parents to hang up. The LOVE U hand print craft is a special activity. Students love making these because they get to put their hands in paint and parents love it because they have a precious keepsake. 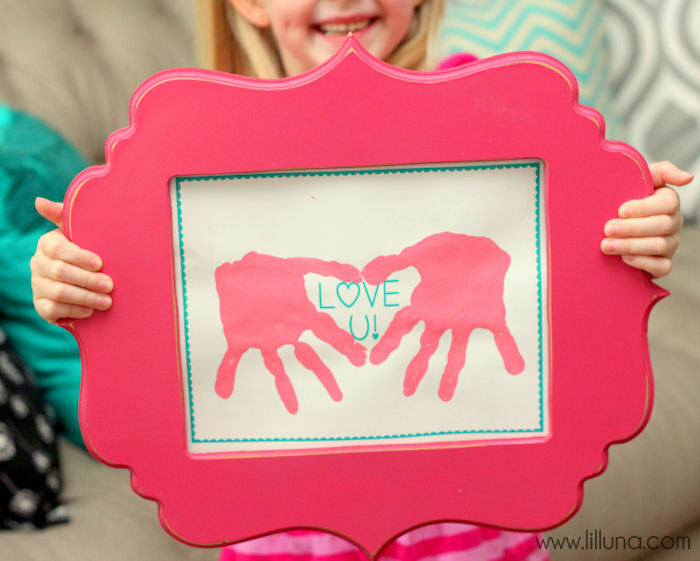 Skip the wood frame and have the kid create frames out of construction paper. 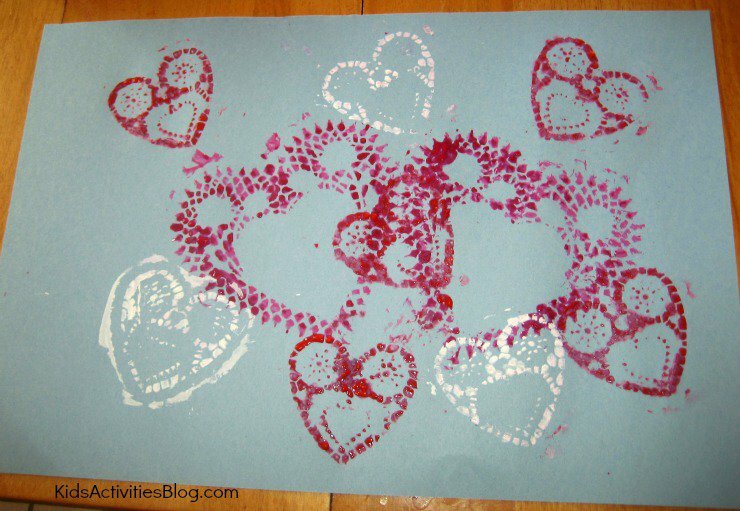 Printmaking with doilies requires at least two sizes of heart shaped doilies – students can compare the differences in the doilies once they had made their prints. 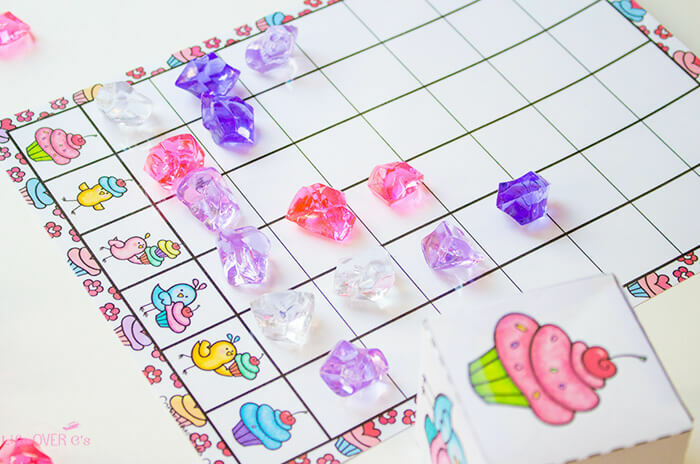 This activity improves students’ fine motor skills while they have a ton of fun! 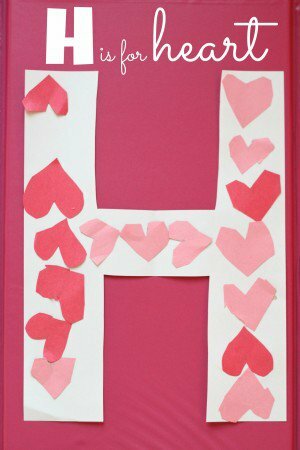 The ‘H is for Heart’ craft, is great for letter recognition and working on scissor skills. Imagine hanging up all of the H’s your students create – you’ll have a well loved displayed board! 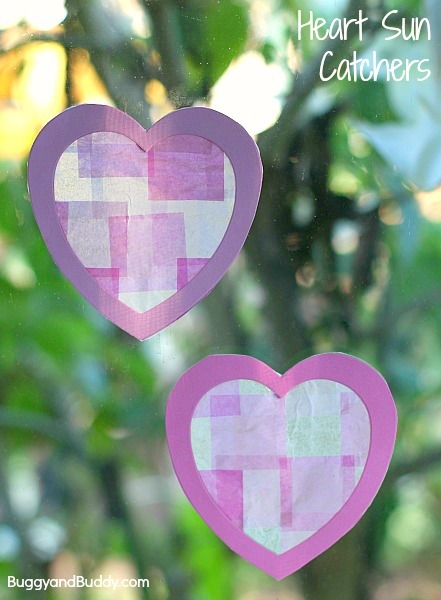 Sun catcher hearts look beautiful – put them on your windows for all of your students to enjoy. Children take pride in their work with it being displayed. A well-done job deserves to be on display! Color matching has never been more fun. 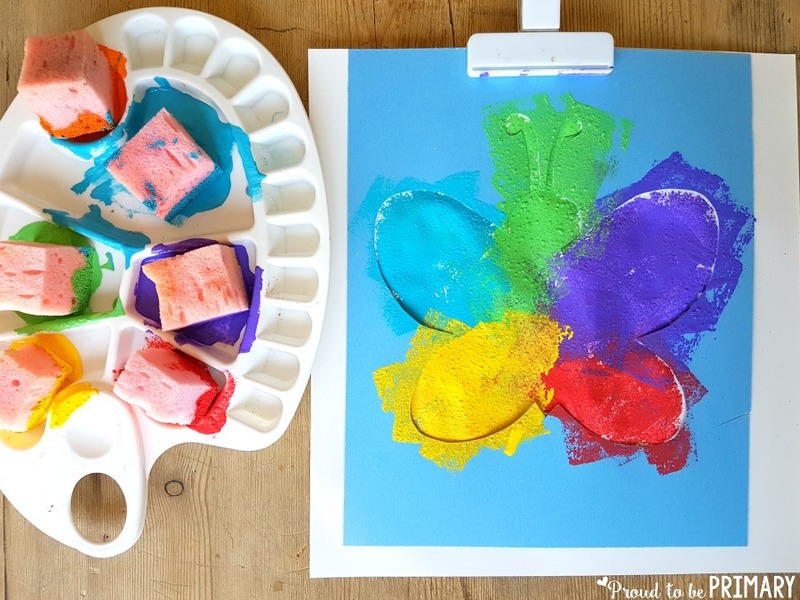 This fun take on ‘color by number’ will have your students honing their fine motor skills as they place tissue paper pieces in the matching numbered areas. 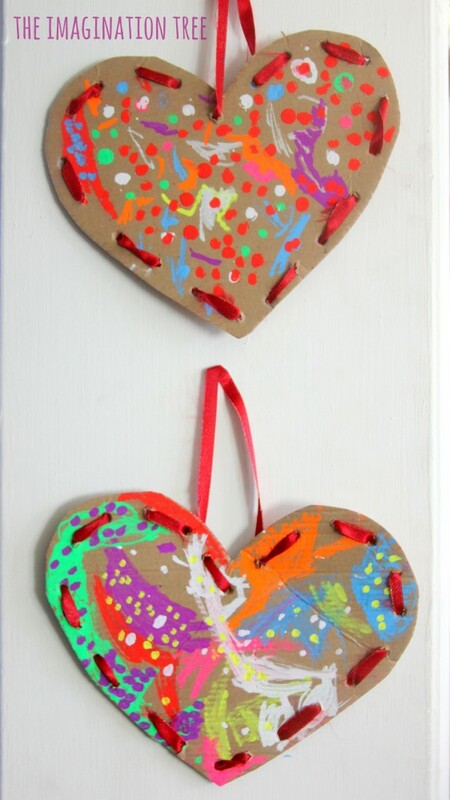 Upcycle pieces of cardboard by having your students make these cute laced hearts. 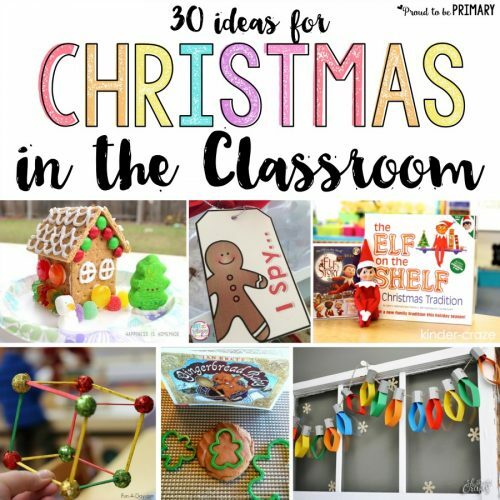 They would make great festive decorations for the classroom. 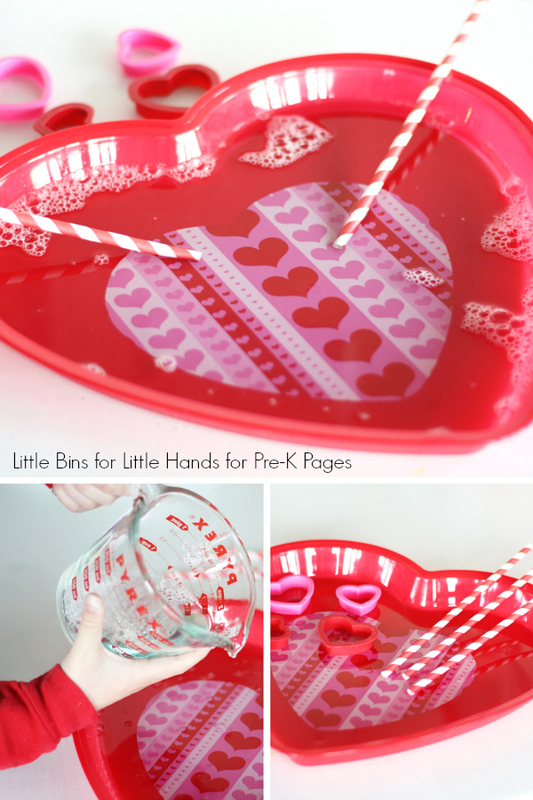 Valentines Heart Shakers are loaded with fine motor use as well as sensory play. This craft is loved by students because not only do they get to paint, but they can have a blast playing with their shaker once it dries. 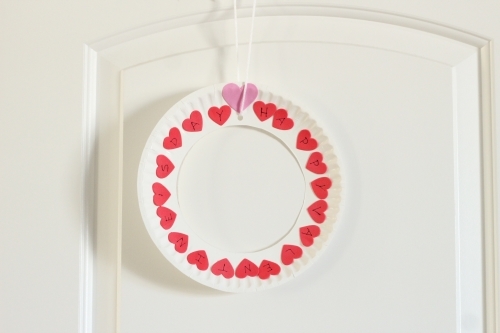 The Valentine alphabet wreath makes for a cute decoration. 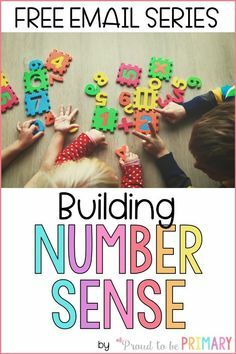 It will help with your students’ fine motor skills, as well as helping them work on identifying letters and letter sounds. 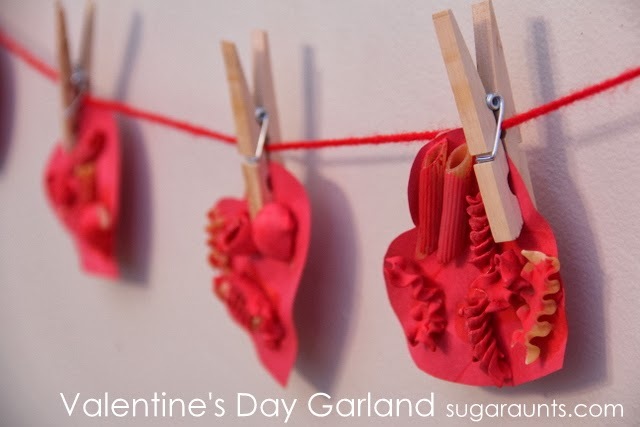 To make Valentine heart garland you’ll need a bunch of pipe cleaners and pony beads. 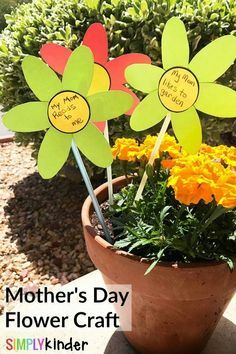 While the craft in it’s format on the blog is for one child to make all on their own, it is easily adaptable for the classroom. 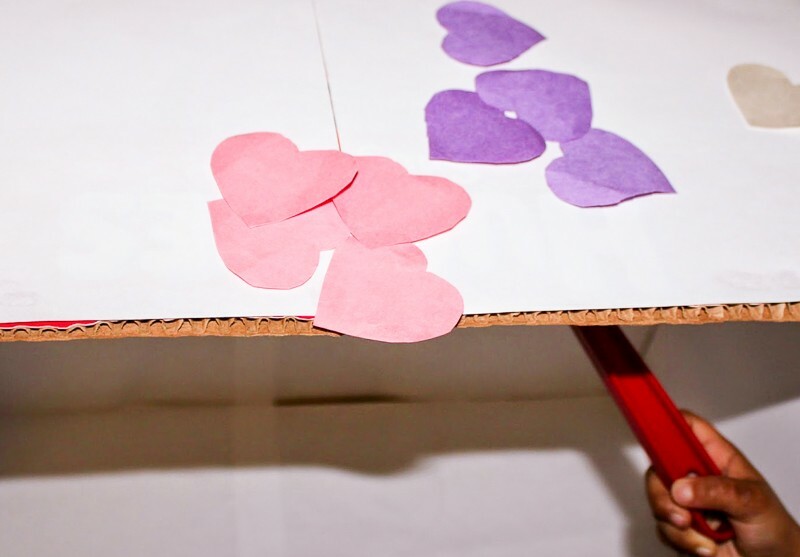 Get your students to work together, building teamwork, so the class-made garland consists of at least one heart made by each student. Students will have a blast making Valentine crowns. They will be practicing making things symmetrical as well as having fun! You’ll have a class full of little princes and princess’. 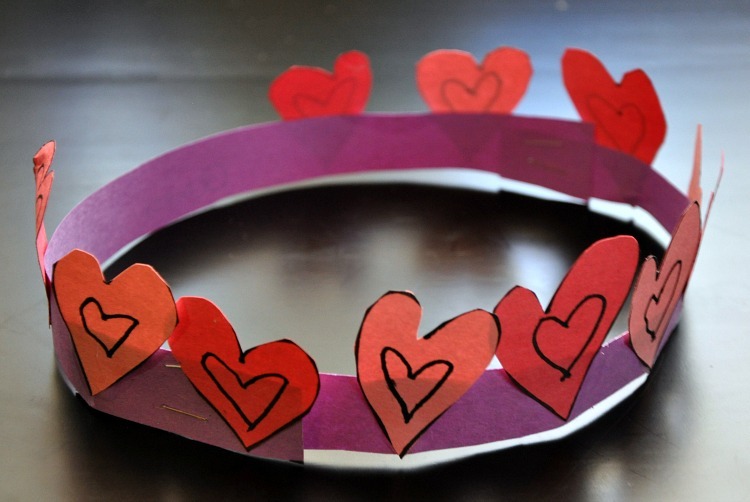 This is a fun craft to make on Valentine’s Day – let the kids wear the crowns while the work the rest of the day. 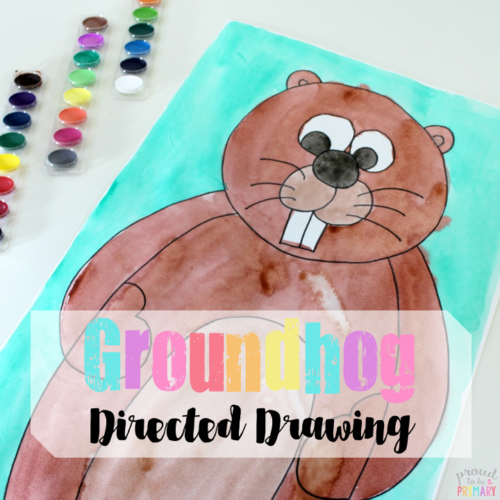 Break out the smocks – have an art session with the kiddos. 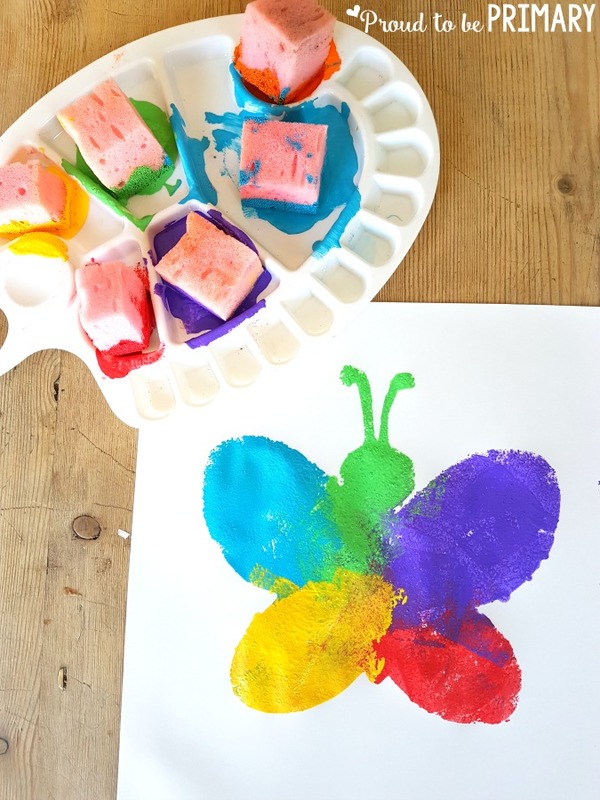 This activity starts with painting and then once dry, kids can decorate their canvas. 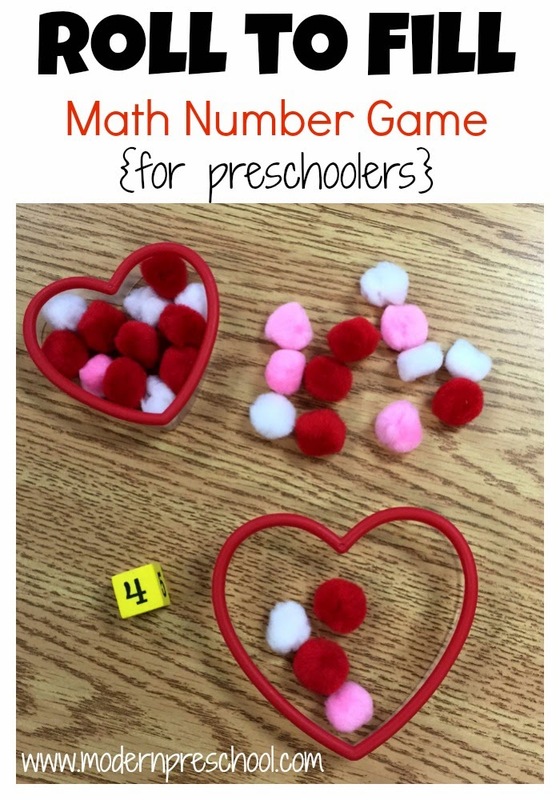 Students will improve their fine motor skills when they carefully lay the buttons in the shape of a heart and glue them in place. Another fun project for the entire class is making a mosaic heart banner. Everyone gets to create their own hearts made from tissue paper, but then all of the hearts are hung on a piece of yarn. Now you have a garland of love that represents everyone in class! Are you planning on having snacks on Valentine’s Day? 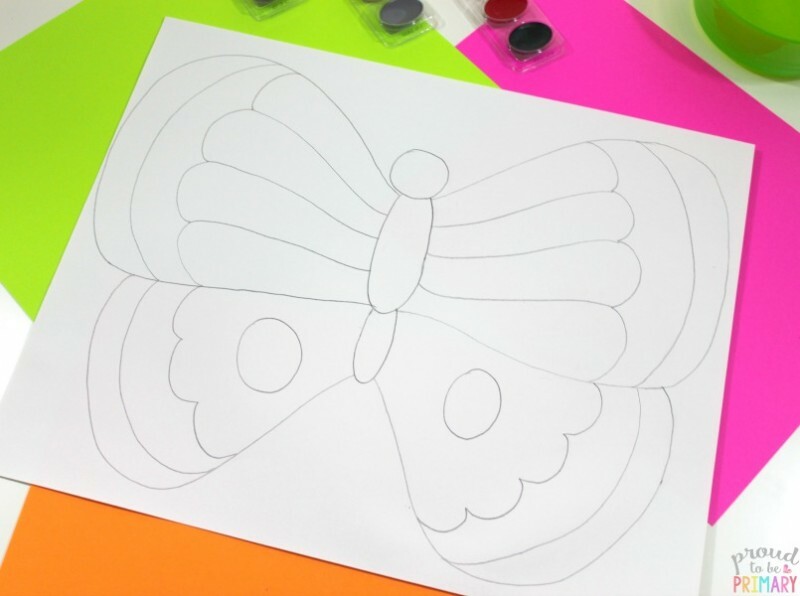 This fun and easy placemat craft gives your students a place to put their snacks once they’ve finished the writing activity and coloring. Students will get a kick out of their heart creatures moving and being silly. Between the googly eyes and accordion paper limbs – these critters wiggle around as the kids shake them. 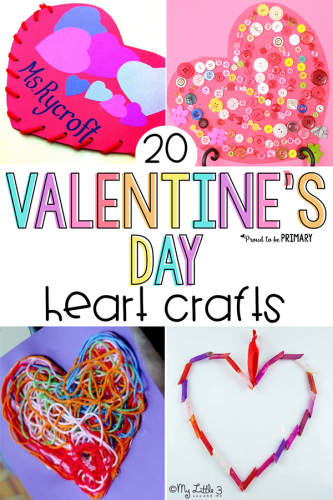 What’s your favorite Valentine’s Day Arts and Crafts ideas for kids? 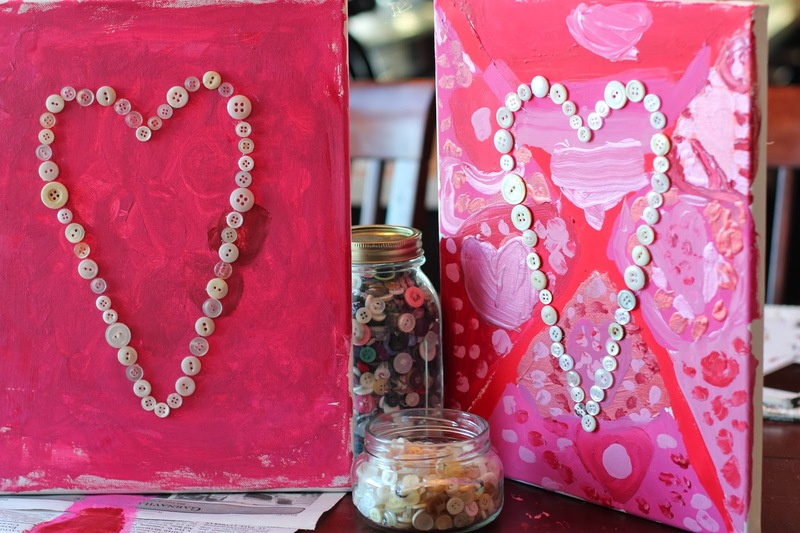 Valentine’s Day Arts and Crafts Galore! 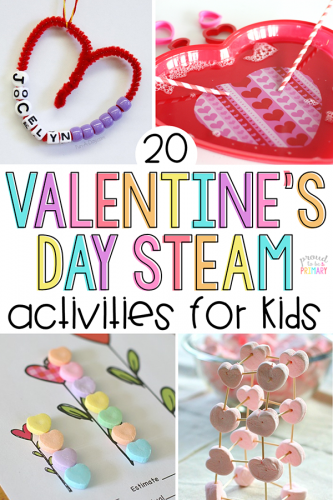 20 Valentine’s Day Activities for Kids – Make it a STEAM holiday! 20 Valentine’s Day activities for kids, including STEAM arts & crafts, candy heart activities, hands-on math, and science experiments for February. 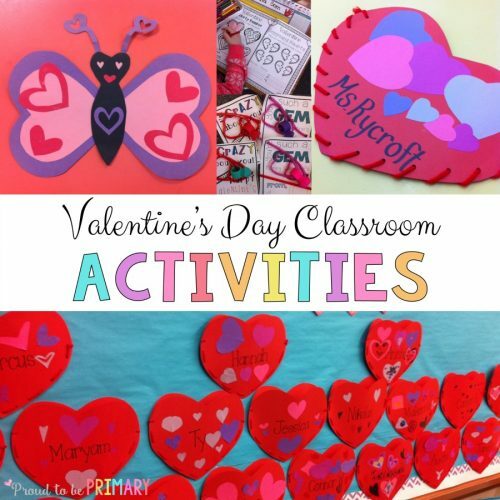 There are many ways to incorporate fun Valentine’s Day theme into hands-on activities. 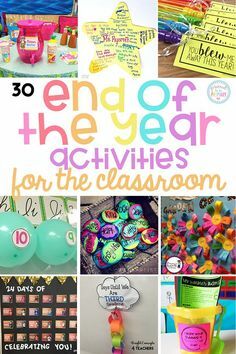 In the activities below, you’ll find fun art projects, critical thinking activities, as well as science, math, and even spelling ideas. I’ve written about activities for Valentine’s Day before and you should definitely check it out. 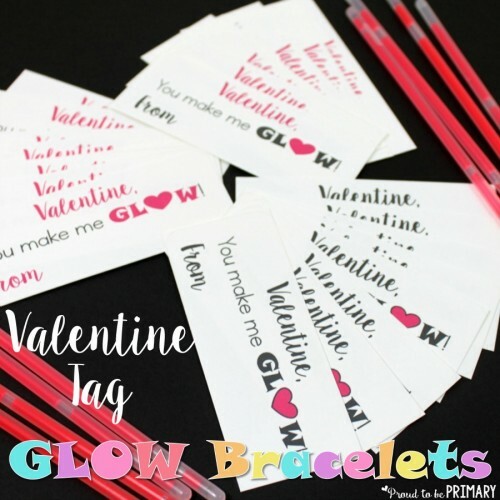 I include games I like to play with my class, crafts we make, and even examples of printable valentines that are great for student gifts. Which leads me to Heart Pockets. 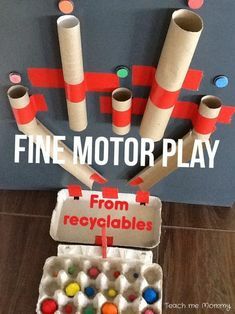 This is a fun craft that gets students to really work on their fine motor skills. 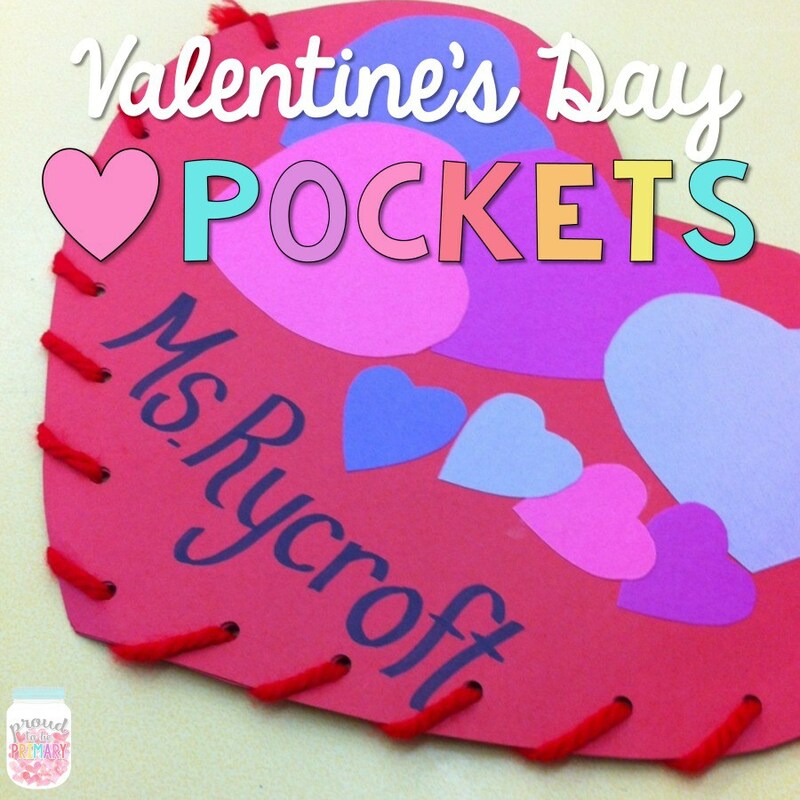 Once the pockets are made, we hang them on a bulletin board – making them visible and accessible for when it’s time for students to pass out valentines. 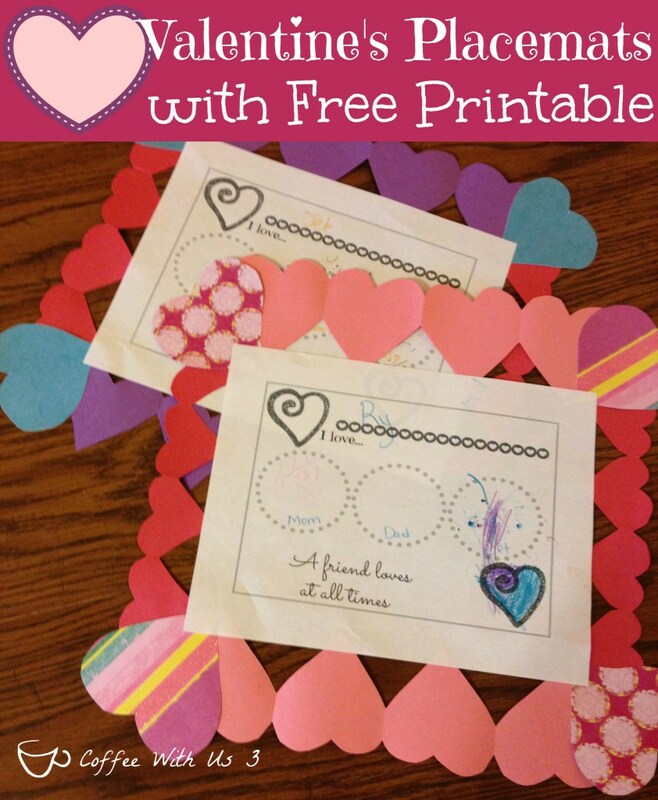 A great activity for students to do at their desk is Valentine’s Day cupcake graphing. Each student collects data based on what they roll with their paper die. This activity makes for great questions and critical thinking. This is another take on collecting information. 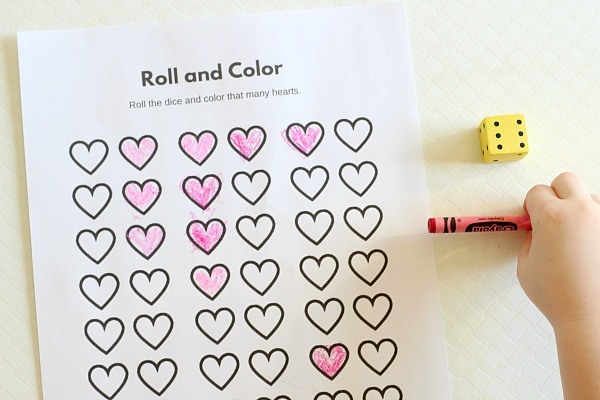 By rolling dice, children will color in the number or hearts that comes up on their die. 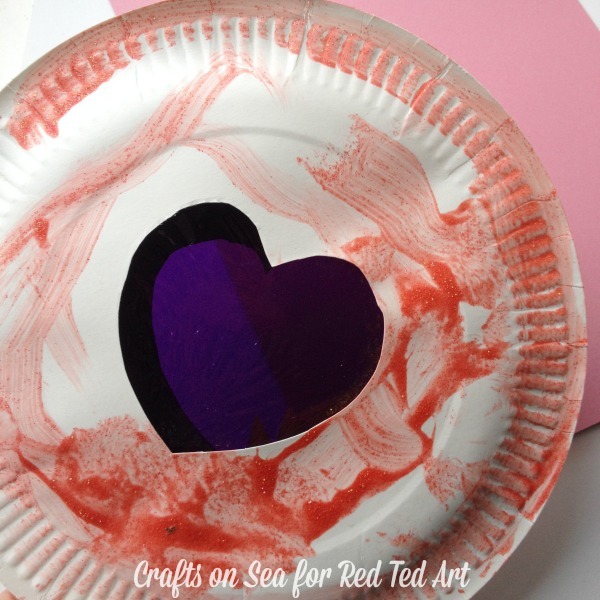 Using pink and red crayons will give this activity a nice Valentine’s Day touch. 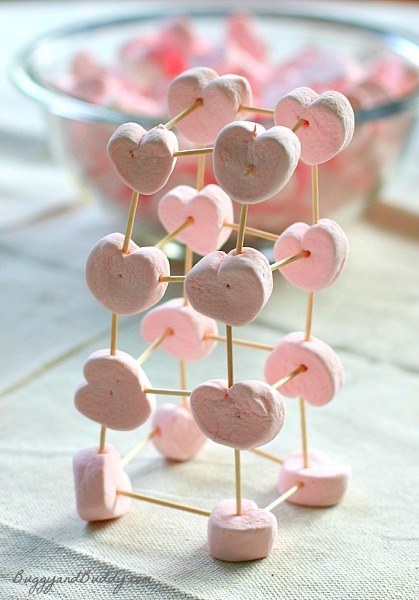 Creating marshmallow structures uses two supplies – heart shaped marshmallows and toothpicks. Not only with the students have fun while being creative and building, but they’ll also be working on problem-solving. Snacking on a few marshmallows is an added bonus. 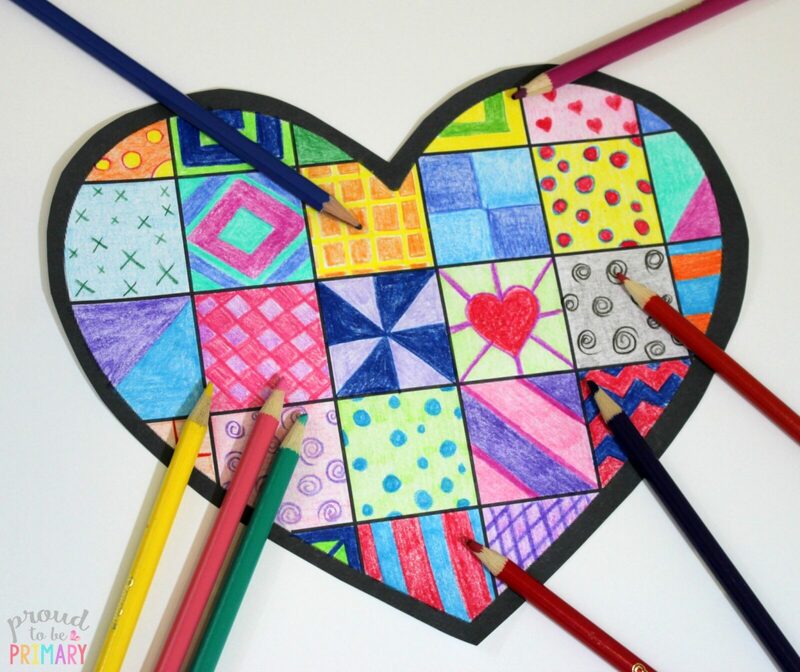 Bring a little magic to the classroom with this fun heart art project. 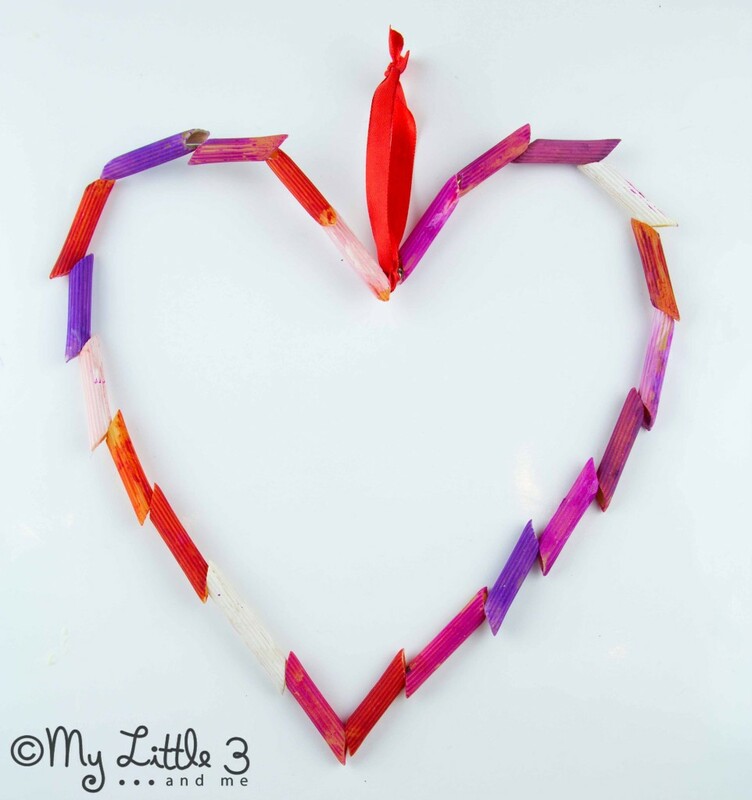 Using tissue paper squares and a little water – children will decorate paper hearts. Once try, everyone peels off the tissue paper and will get a surprise as the color has transferred onto their white paper heart! Craft projects with ‘unusual’ craft supplies is always a fun activity. 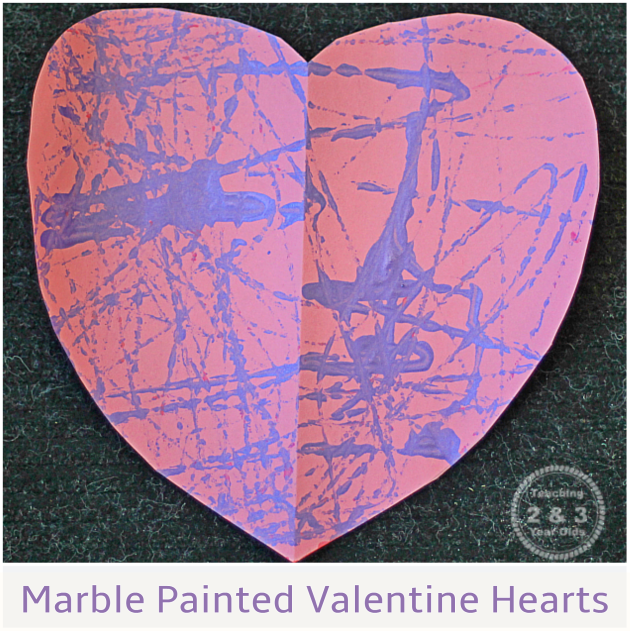 Students will have a blast painting different shaped pieces of pasta that they can then use to decorate hearts. 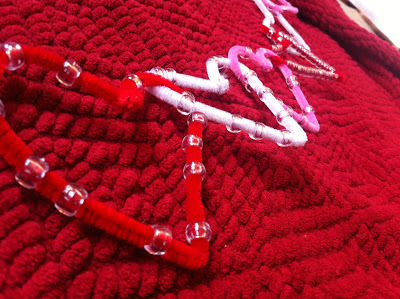 Beaded name hearts will work those fine motor skills as well as letting your students be creative. And students love making personalized items – so this is one craft that will be a class hit. 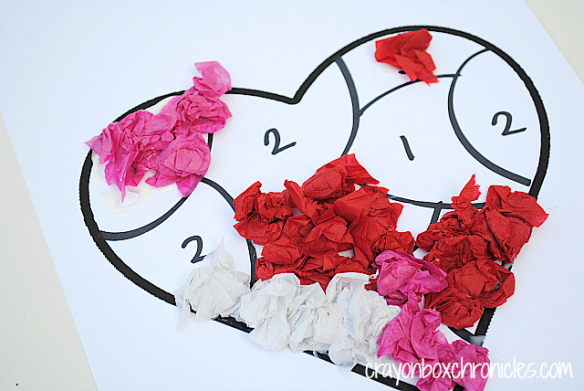 Blowing Valentine Bubbles is a fun hands-on project for students. Let them help you make the solution – you can even work in math questions! 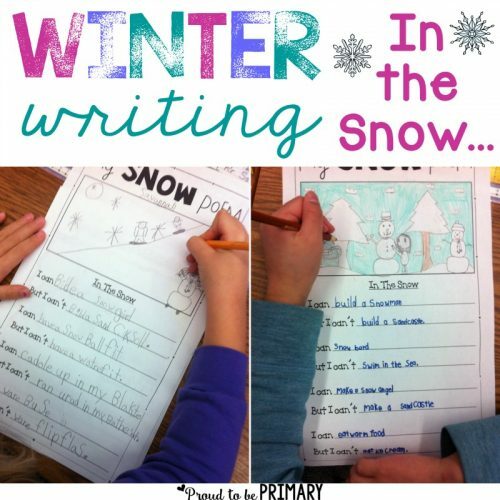 Pre-writing activities are a great way to get students thinking. This Valentine’s version is no different. By putting together pictures and words of items the students love, they’ll be strengthening their language skills. Have some fun with a science activity this Valentine’s Day. 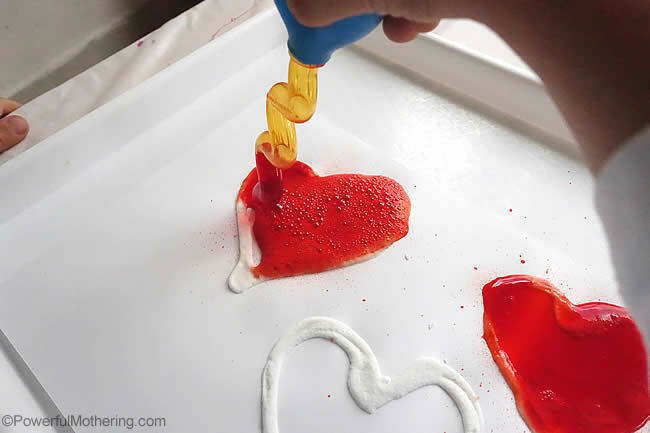 This simple activity uses basic baking soda and white vinegar to create super neat fizzing hearts. 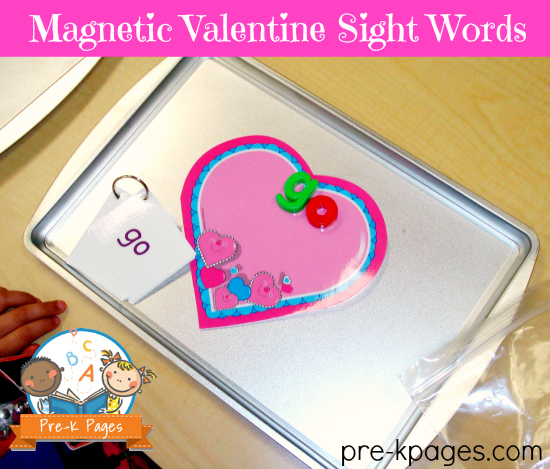 Magnets are another great tool to have in the classroom – kids love them! 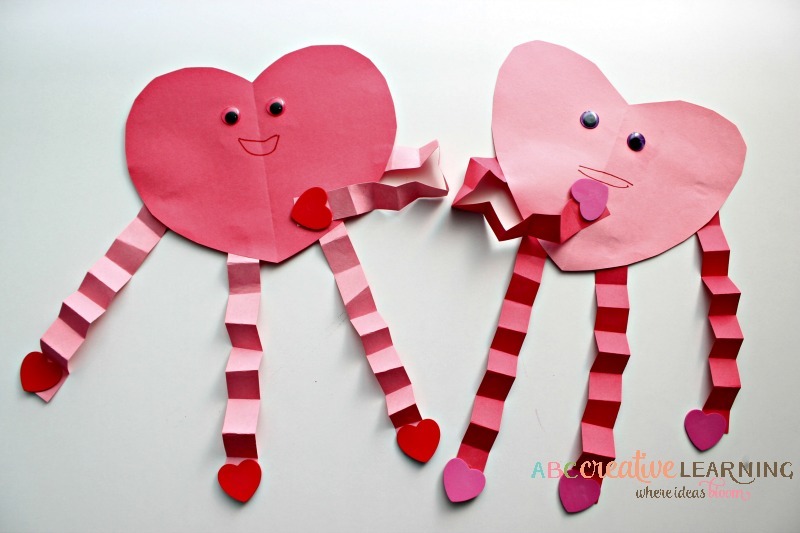 This activity pairs paper clips with paper hearts in a fun activity your kids will want to do over and over again. Sensory bins are always great for students – but this one has an extra element added to it. Hearts with words on them are stuck and buried in the sensory bin. 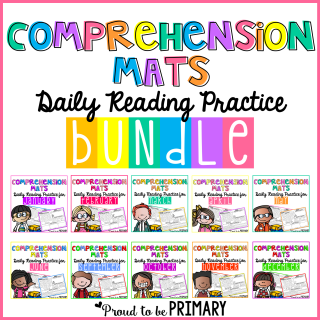 Your students get to dig around for the hearts where they then will practice reading and their penmanship. 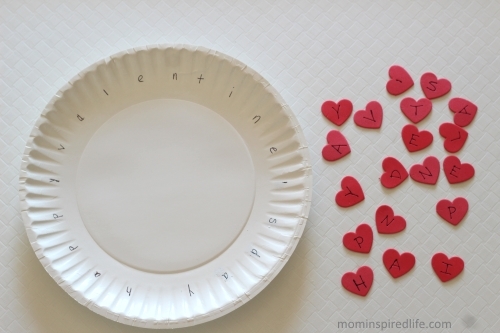 This valentines alphabet wreath not only works on letter recognition, but it gets students to work on their fine motor skills as well. Plus, when the activity is completed, each child will have a cute valentine wreath to take home! Whether ya love ’em or hate ’em, conversation hearts can be a fun supply to use. 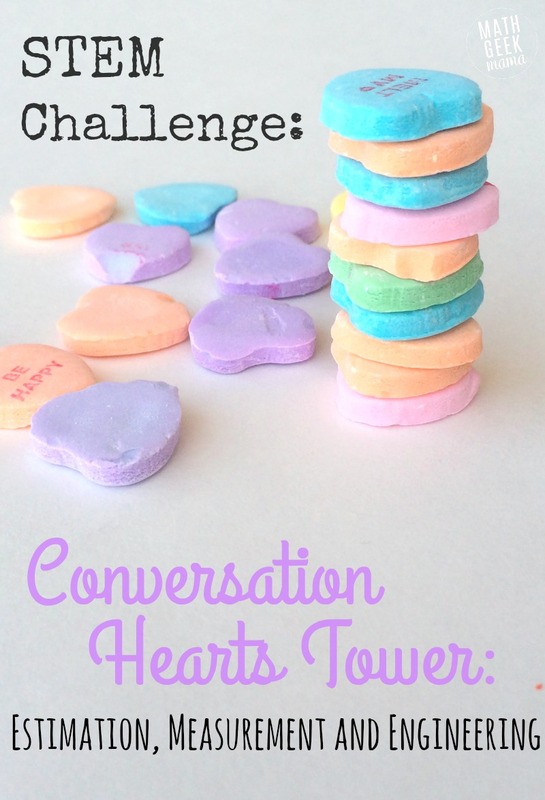 Try making these conversation heart towers with students. It’s a great opportunity for them to work on estimating, measuring, and engineering. Tons of fun to be had with marbles and paint! 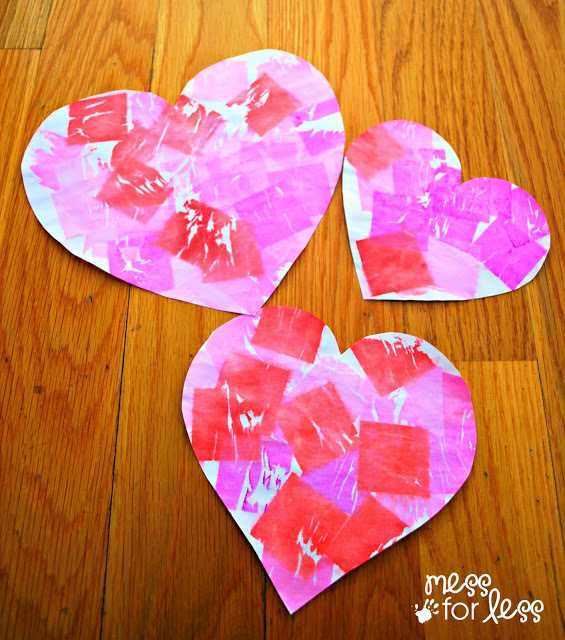 Just grab a box, paper, and paint and let kids get moving as they create this abstract valentine heart. Who knew straws could be turned into hearts? This simple craft is sure to excite kids and create a cute display for any classroom bulletin board! 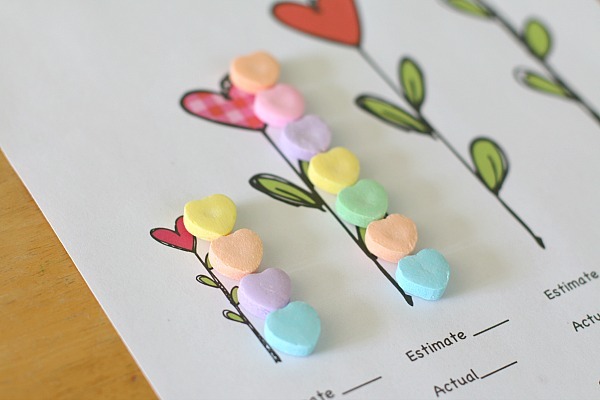 Kids can complete this simple measurement math activity with a small pile of candy hearts to make it extra special! 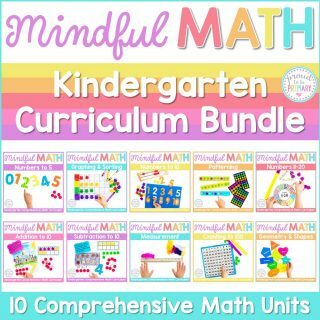 This roll to fill math activity is filled with hands-on fun. Simply roll the dice and fill heart shaped cookie cutters with pom poms! 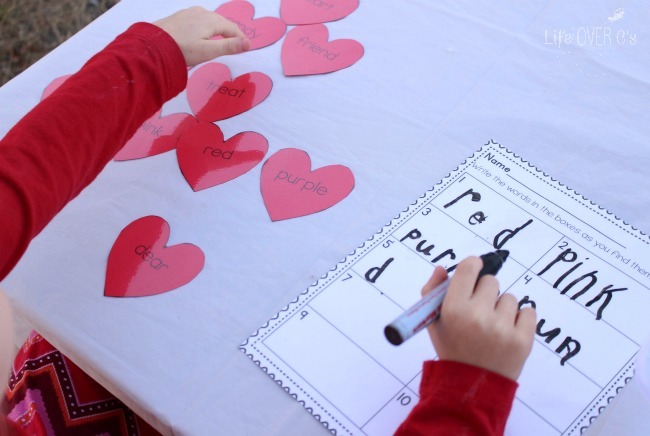 Kids can practice their sight words in a Valentine’s Day literacy center with a few simple materials. 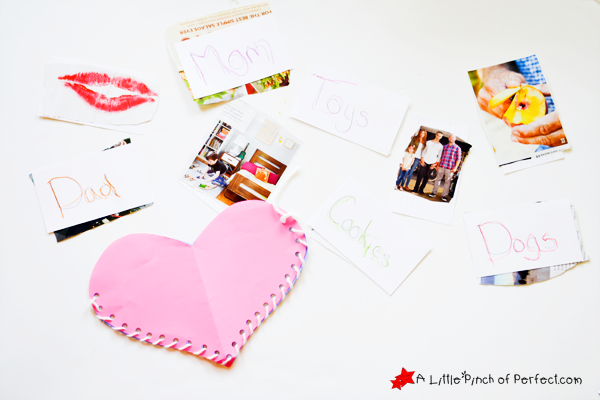 What’s your favorite Valentine’s Day activity for kids? 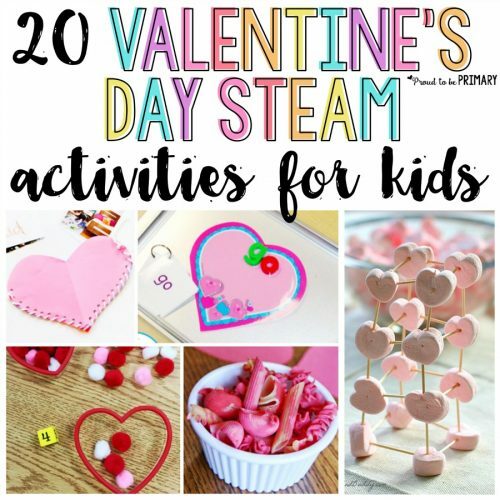 Check out these Valentine’s Day Activities for Kids Too! 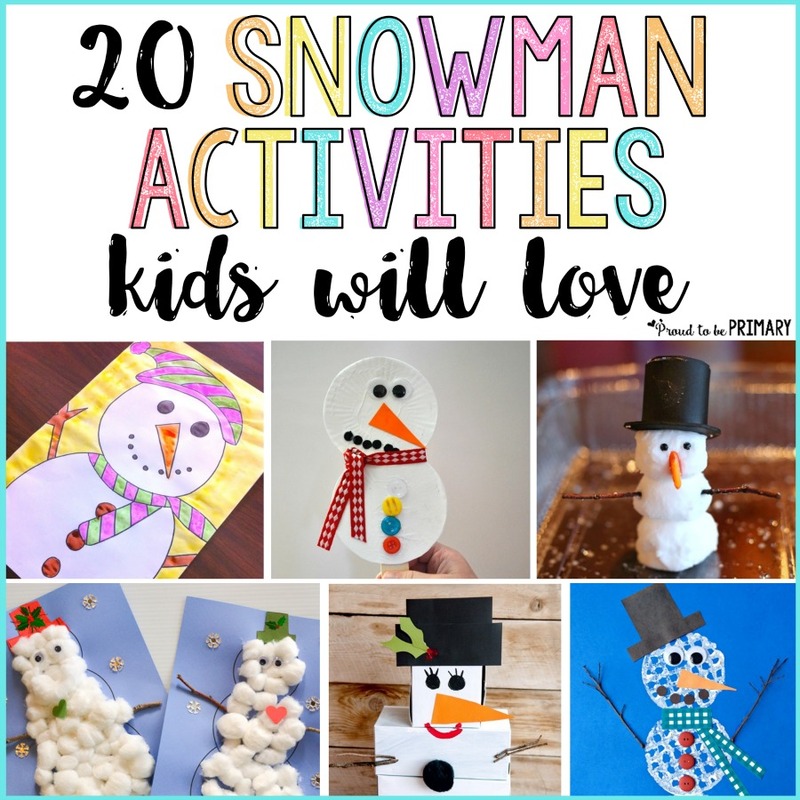 20 snowman craft ideas and activities for kids, including tons of arts & crafts, DIY decor, hands-on learning, and other ideas for winter. 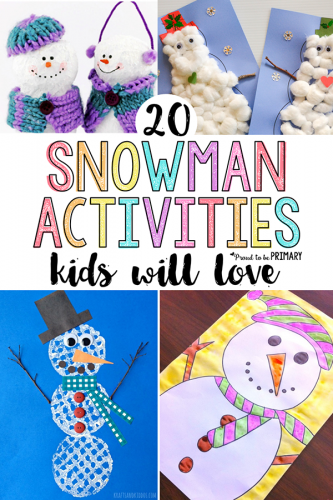 It doesn’t matter if it’s snowing in your area or not, children will still get to have a blast making snowmen with these 20 snowman craft ideas. Snowmen are one of my favorite winter icons. Those big smiles and bright orange carrot noses make me so happy. So what better than to spread some of that snow-fueled happiness with kids! 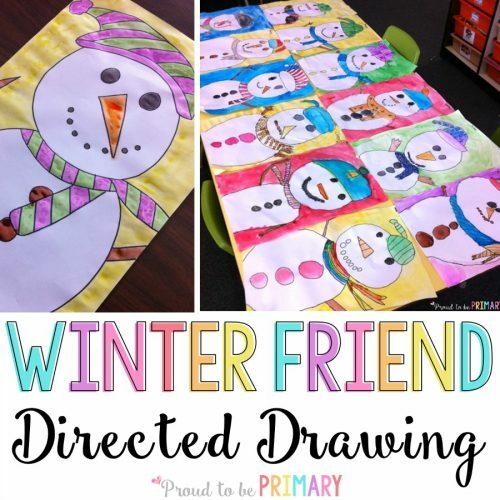 Personalized snowmen really help your child stretch their imagination – just look at the cute possibilities with this directed drawing. Break out the cotton ball! 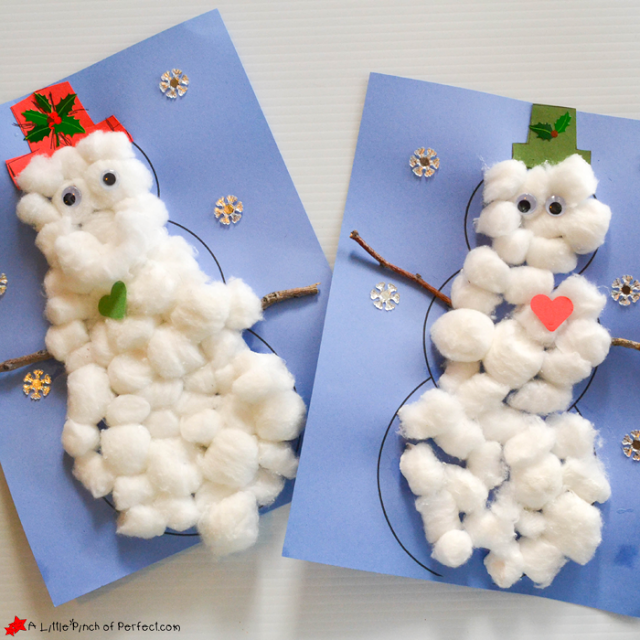 These fluffy balls are the perfect supply to make these awesome snowmen pictures. 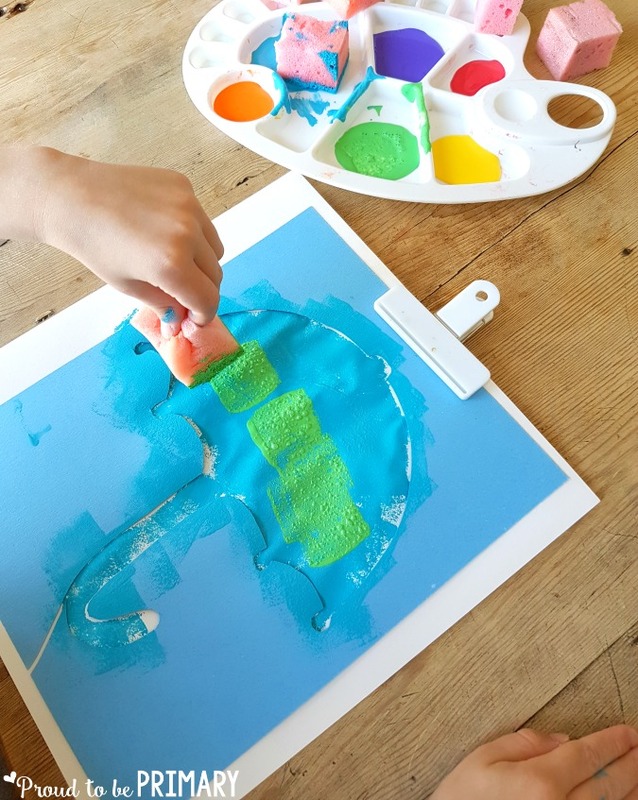 Kids love to paint – but you’ll make their day as you show them how much fun they can have altering their painting with just a straw and their breath. 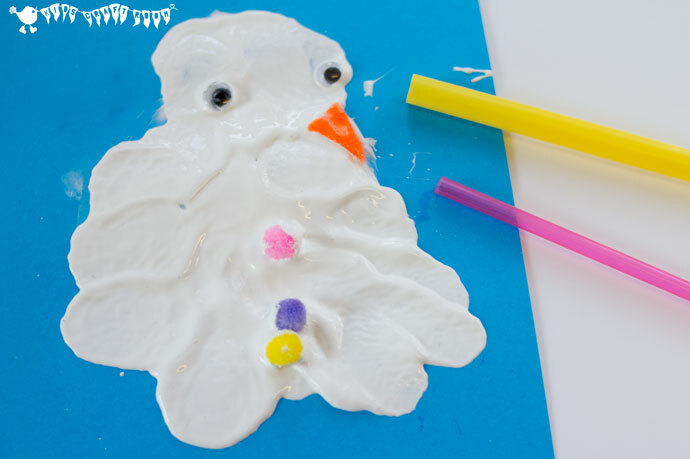 It’s important to get your child involved in science – take this foaming dough snowman for example. They’ll have a blast as they watch him change depending on what they do to him. These snowmen mats have letters all over them. 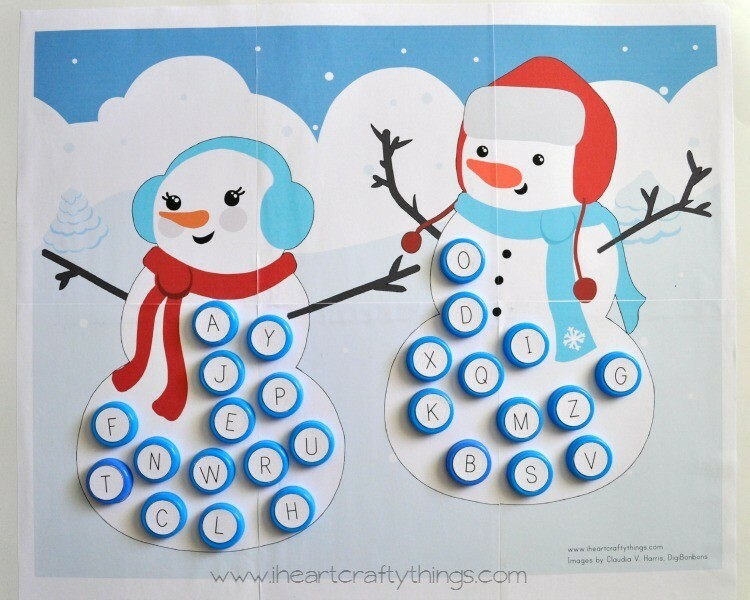 Your child matches their letter labeled pieces to the letters on the snowman. 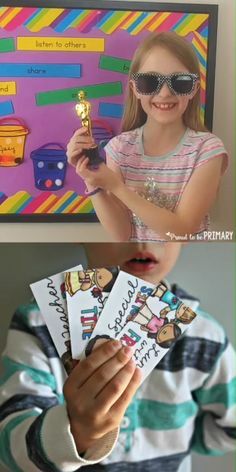 This is a great way to make letter identification fun. 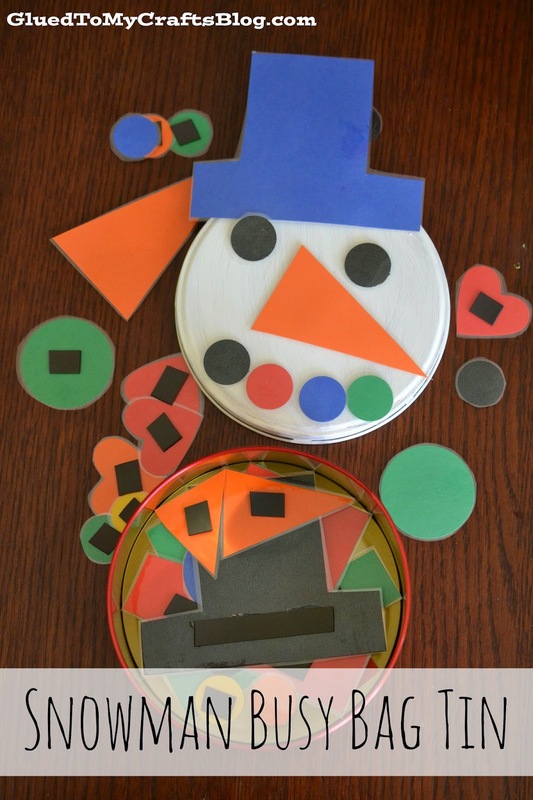 If you’re looking for a fun activity to keep little hands busy – this magnetic snowman building activity is just for them. 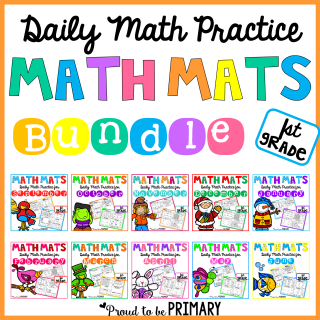 It’s time for some math matching! 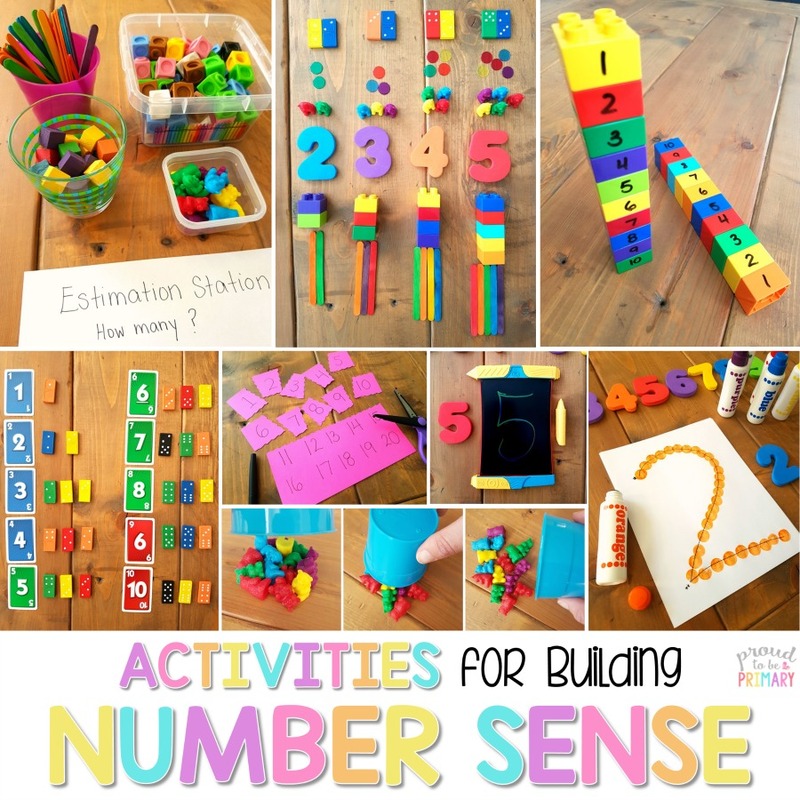 This is a great visual activity for children to learn their numbers. 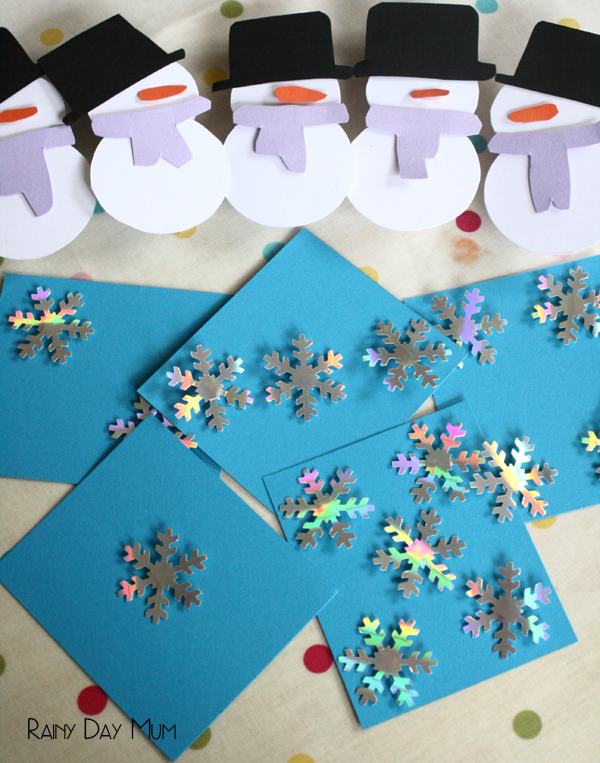 Help them count out how many snowmen belong on each snowflake card. Everyone gets the pieces tomake a snowman, by taking turns to roll the dice, see who makes the complete snowman first. At first glance, you’d think this multi-piece snowman is just a cute decoration, but in reality, it’s an awesome game! 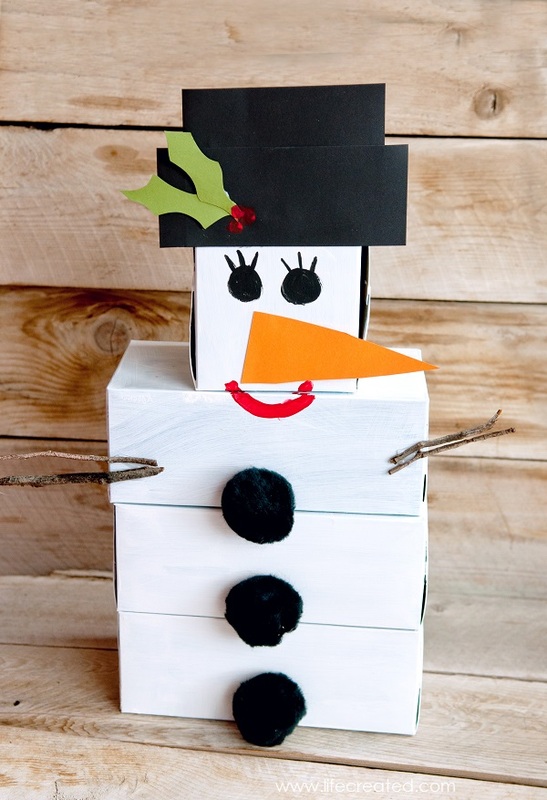 Your children will have a blast bowling over this boxy snowman. Who knew waffles made really cool stamps? This is a fun opportunity for your kids to play with their food. 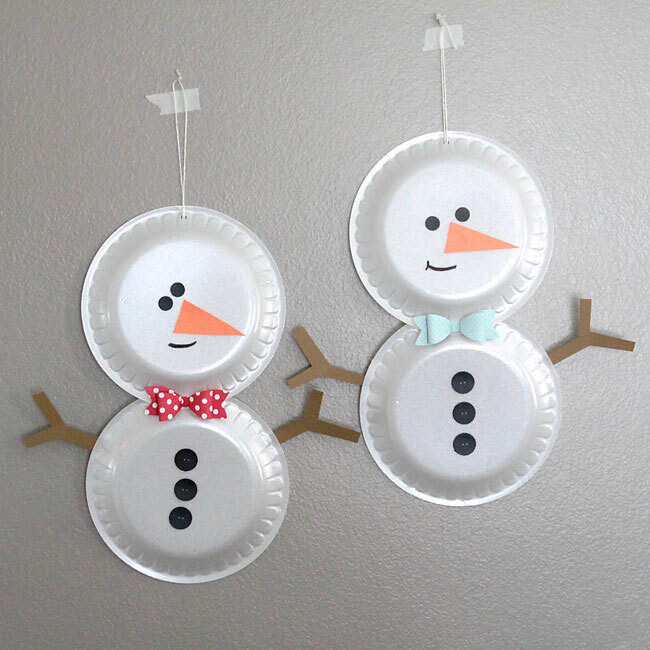 Foam plates are absolutely perfect for making this simple snowman craft. Painting is a load of fun, but it’s even better when it’s puffy paint. 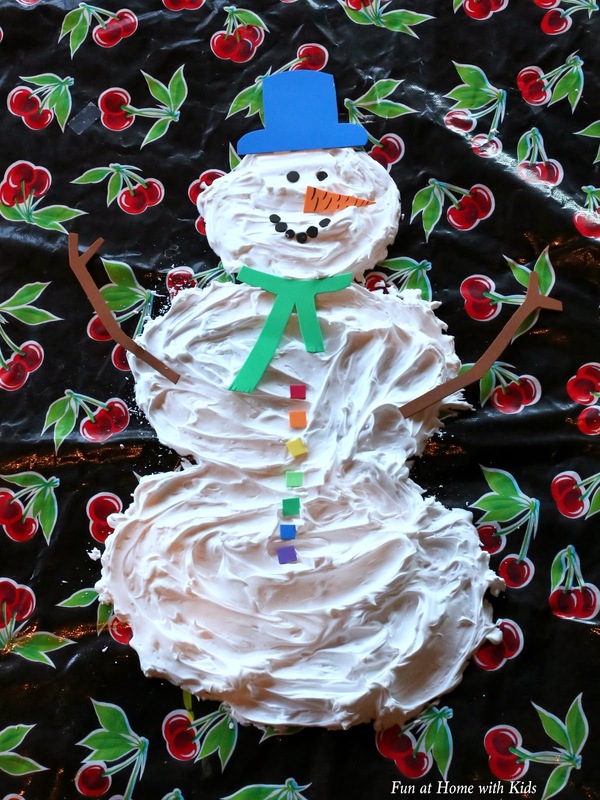 Kids won’t be able to make enough snowmen with this activity. 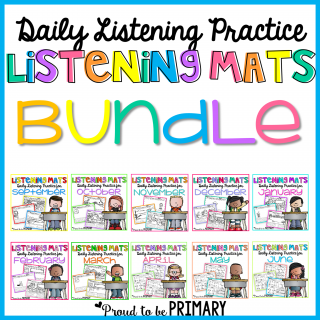 Working on listening skills is something that will help your child throughout their life. 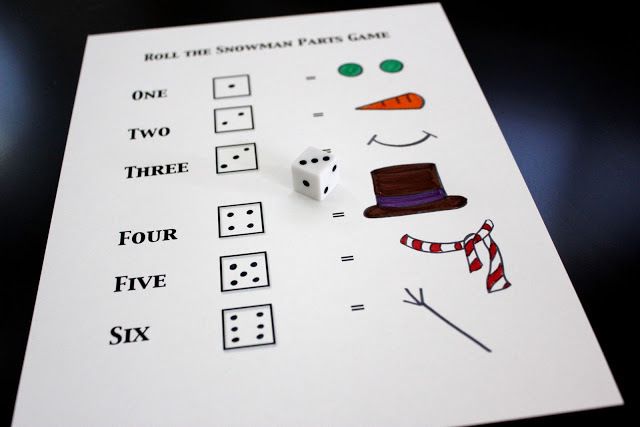 Make practicing listening fun with this snowman game. 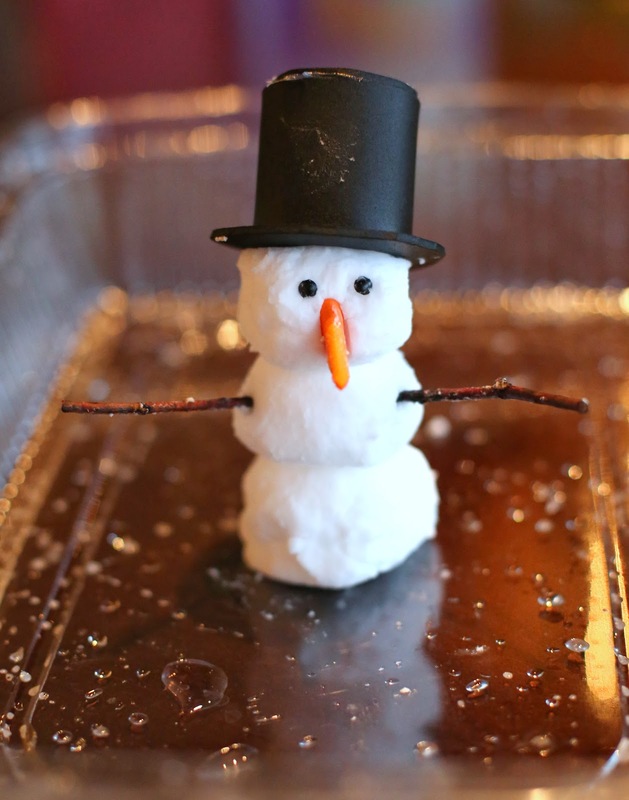 Not all snowmen have to be cold and made of snow. 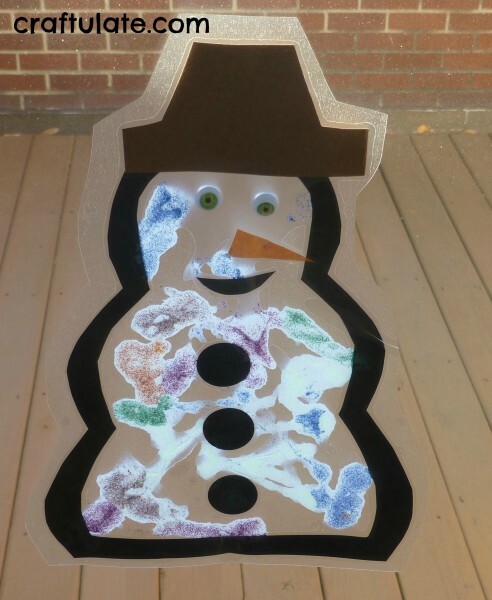 A snowman suncatcher lets you enjoy the frosty friend even when it’s sunny out. 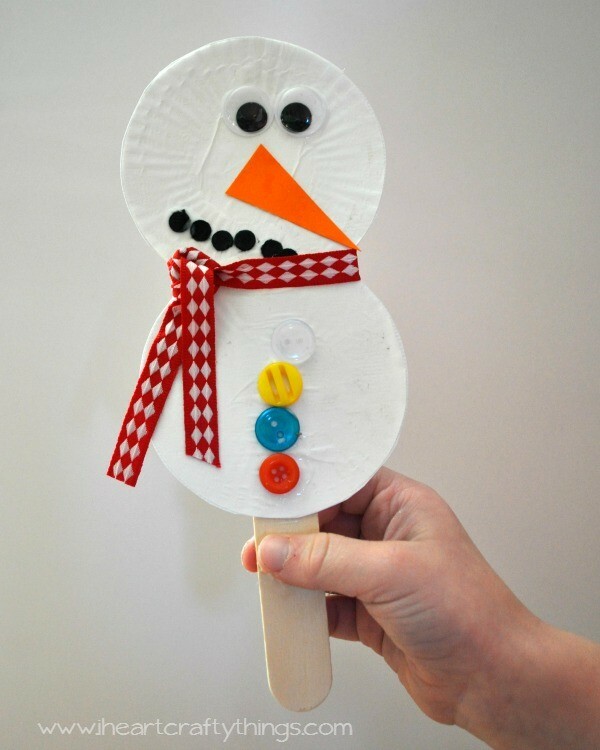 This papier mache craft proves that anything can be made into a super cool snowman. 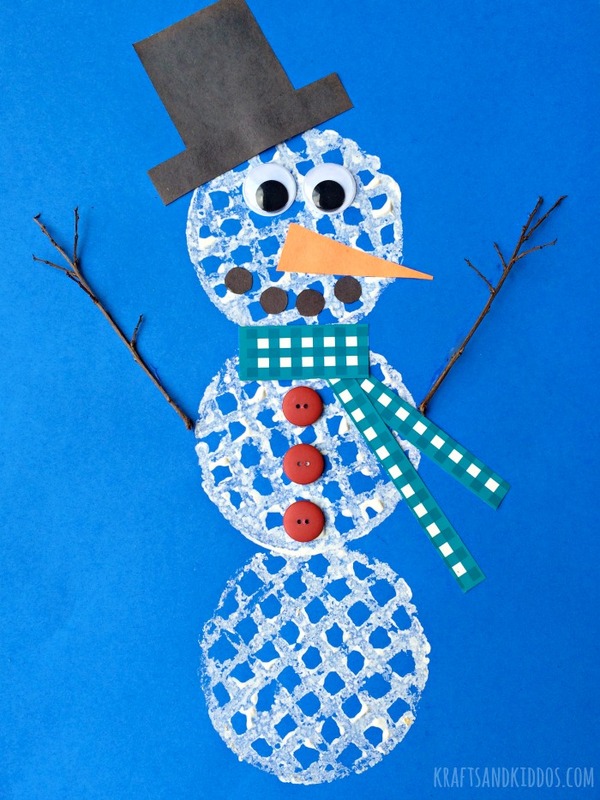 Using contact paper and squares of colored tissue paper, your child can great some beautiful stained glass inspired snowmen. This is one of the few times you should ease up on the ‘no throwing in the house’ rule. Hang up this hollow snowman and with paper ‘snow balls’ start tossing them through his middle! Messy play is always a great sensory activity. 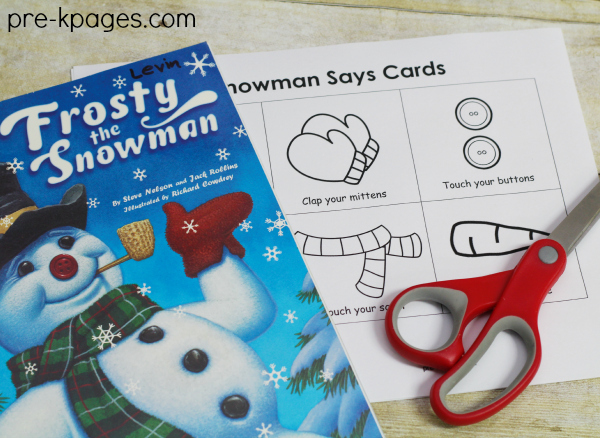 Make a snowman and let those little fingers start demolishing it. 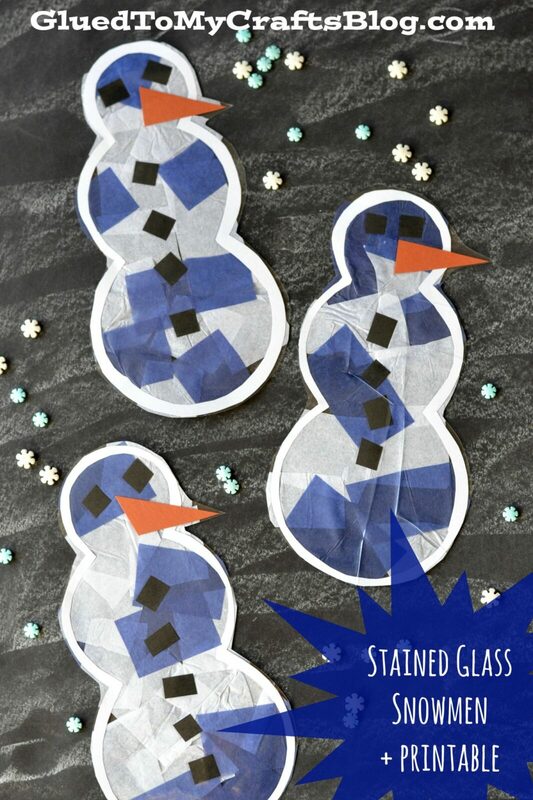 It only takes a few craft supplies to put together these neat snowmen stick puppets! Craft projects are fun to do with kids, but making projects that can be used is even more awesome. 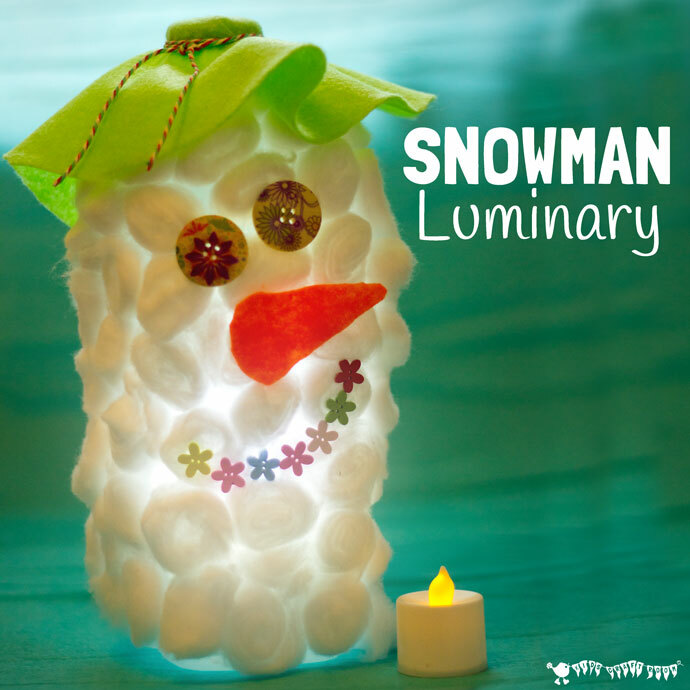 This snowman luminary lights right up with the help of a flame-less tea light candle. 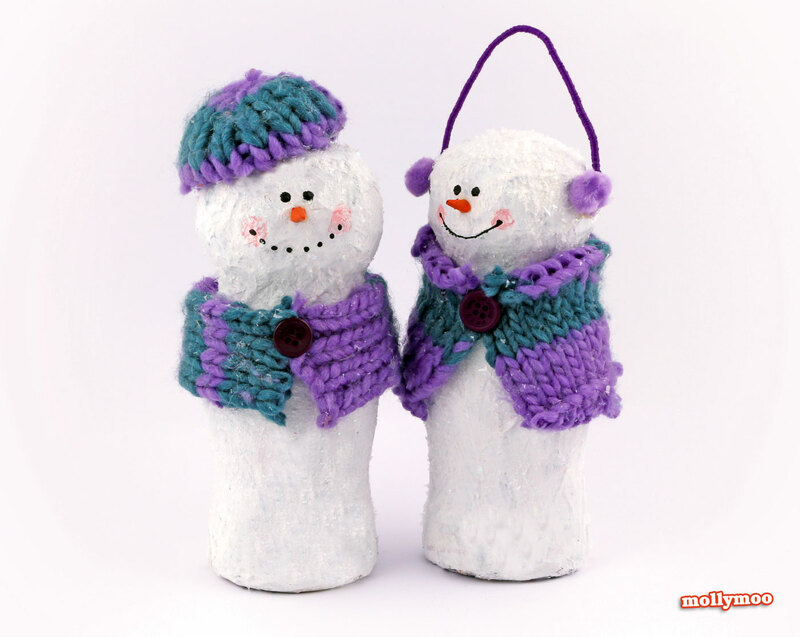 What’s are your favourite winter snowman craft ideas? 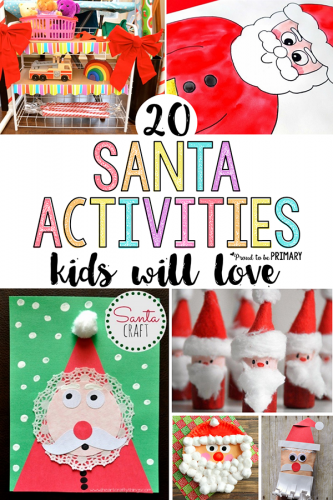 20 Santa crafts for kids they will love! 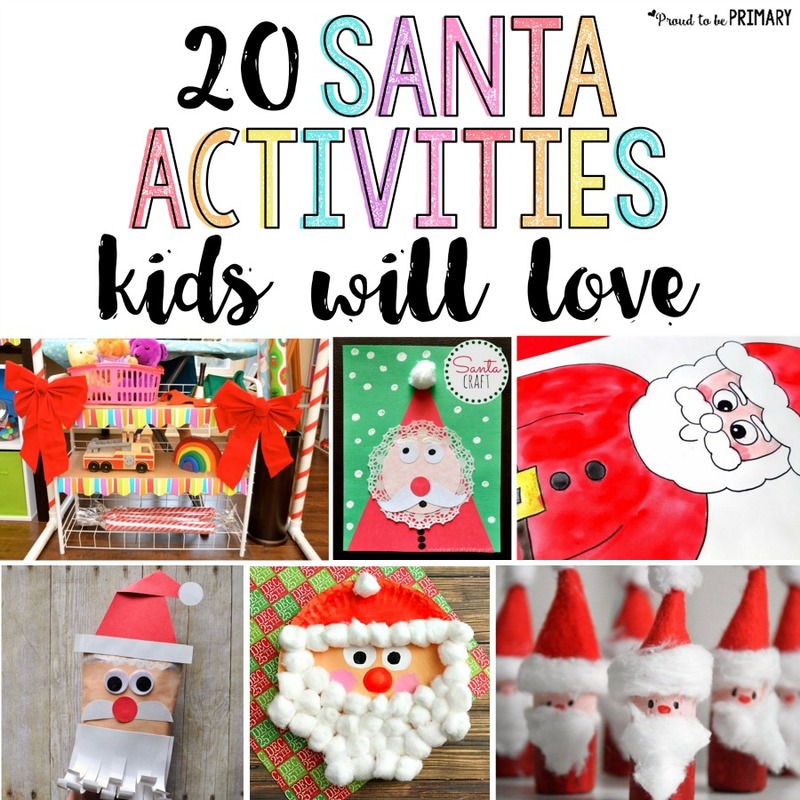 Includes activities that would make the perfect DIY decorations, FREE printables, and other Christmas ideas. There’s nothing more iconic than Santa Claus. His bright red suit, that full white beard, and that big belly that shakes when he laughs. 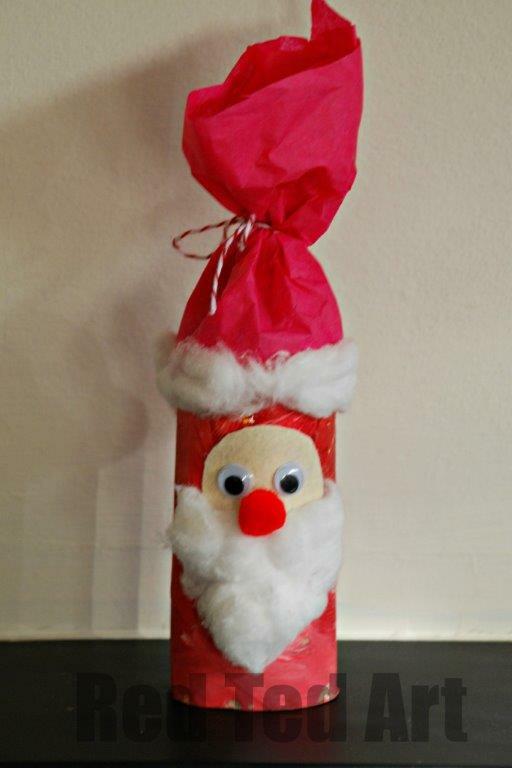 Have fun this holiday season with craft projects and educational Santa Claus activities for kids that are all themed. Break out the red paint and cotton balls, it’s time to make some holly jolly fun! 1 – Proud to Be Primary – Santa Directed Drawing Art Activity Use these simple directions to create unique Santas that will look festive hanging anywhere! 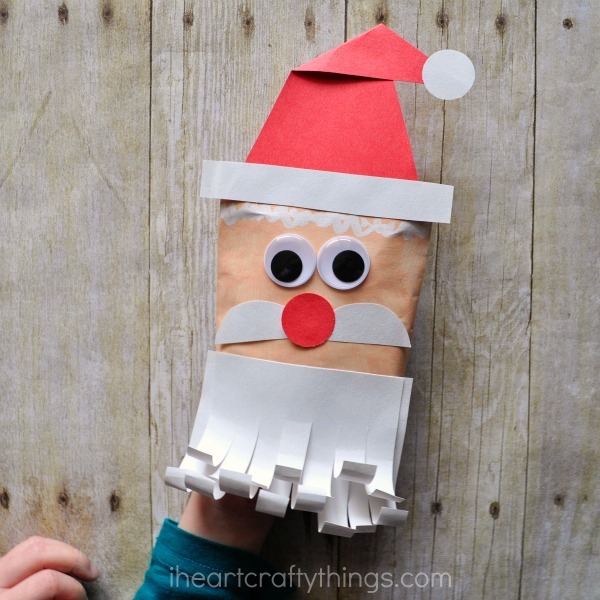 A little paint and construction paper help transform an envelope into Santa’s head. 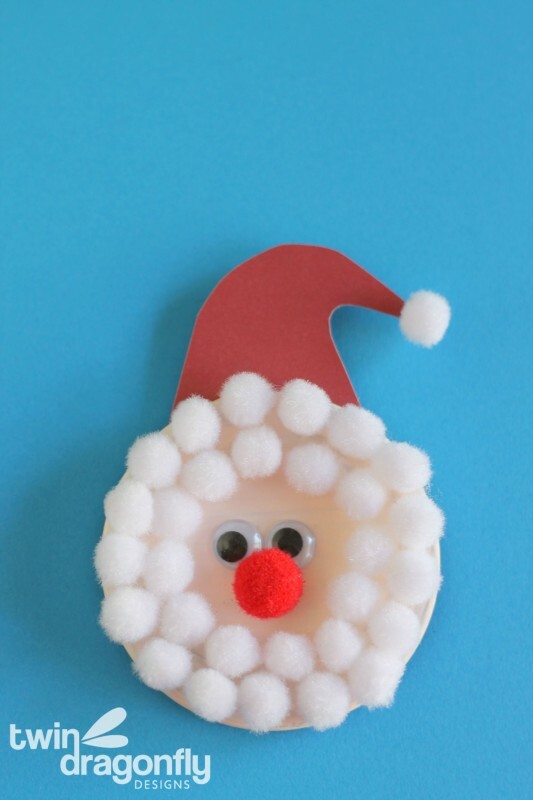 This fun and festive Santa magnet is an easy way for your child to add their own decoration to the house. 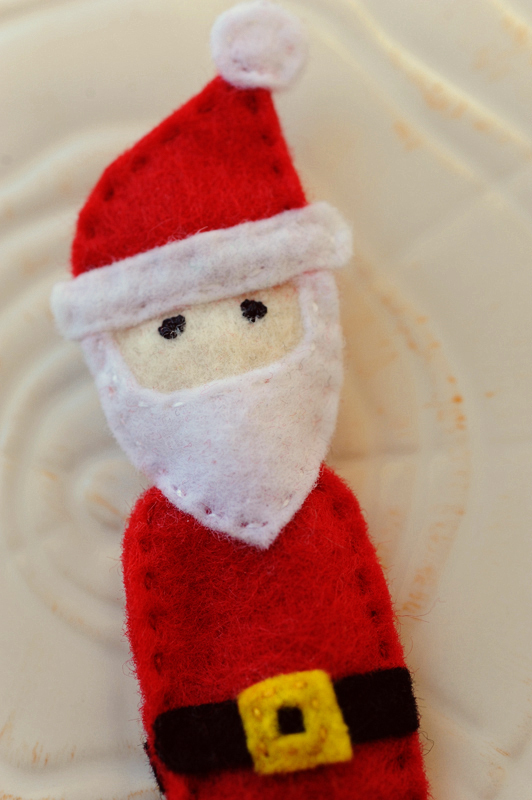 Toilet paper rolls can be anything you can imagine – this time, it’s Santa! 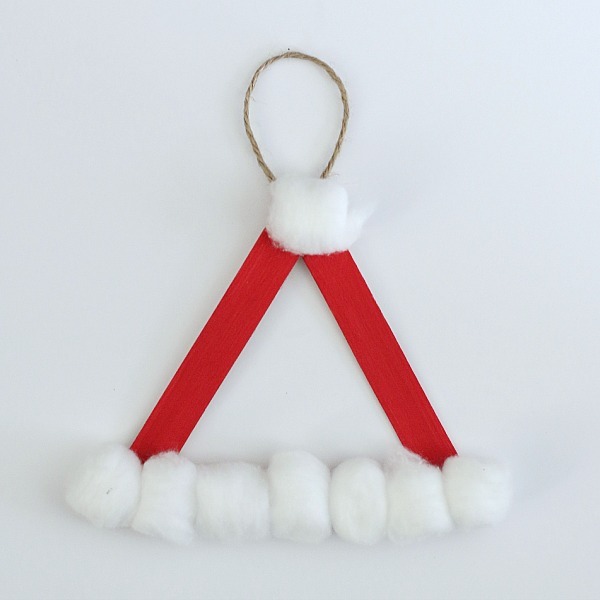 With only a few items, your little one can make this tree-worthy santa hat ornament. 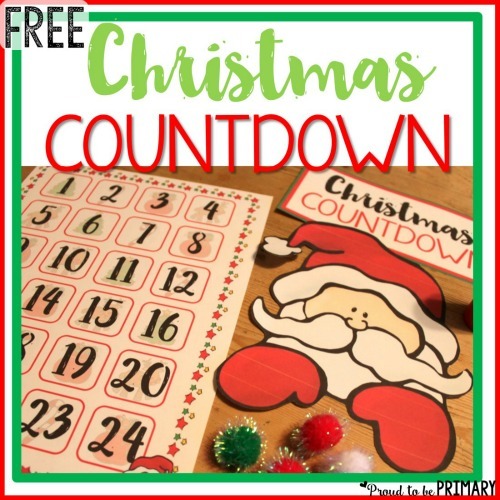 Excite the kids with this FREE Santa countdown to Christmas that you can hang anywhere! 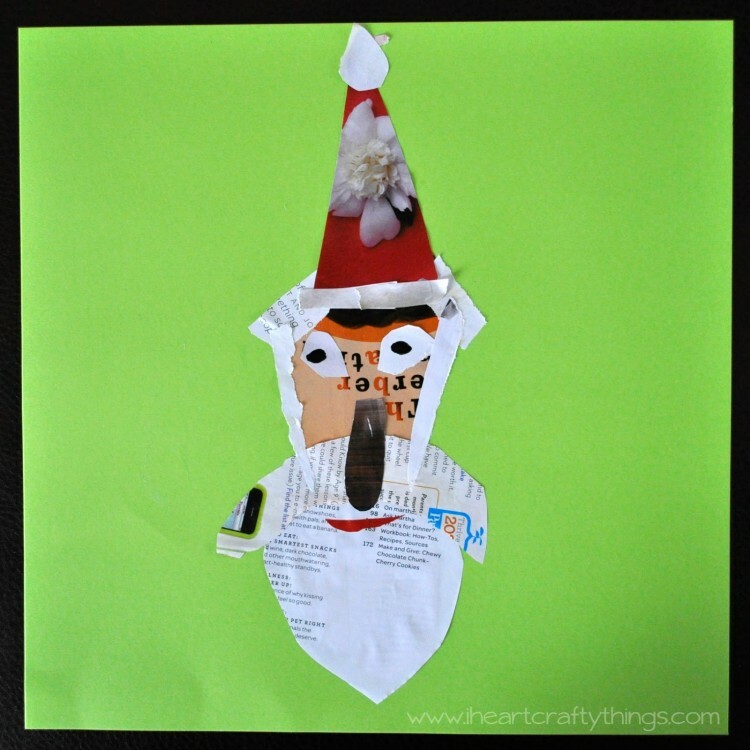 Before tossing out your old magazines, make these magazine scrap Santa collages. 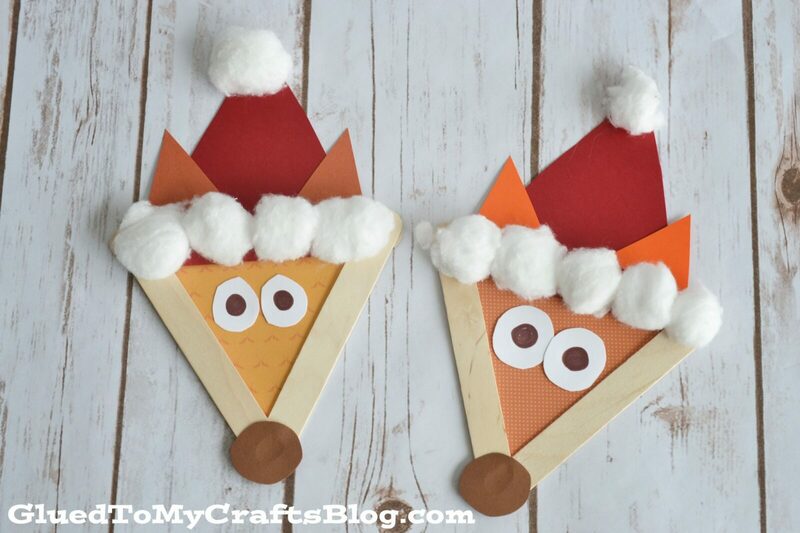 Fox are so cute – so what’s better than a fox with a Santa hat on? 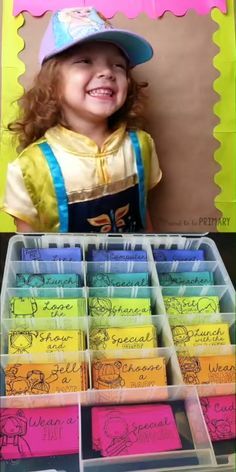 This kid craft is super easy to make. 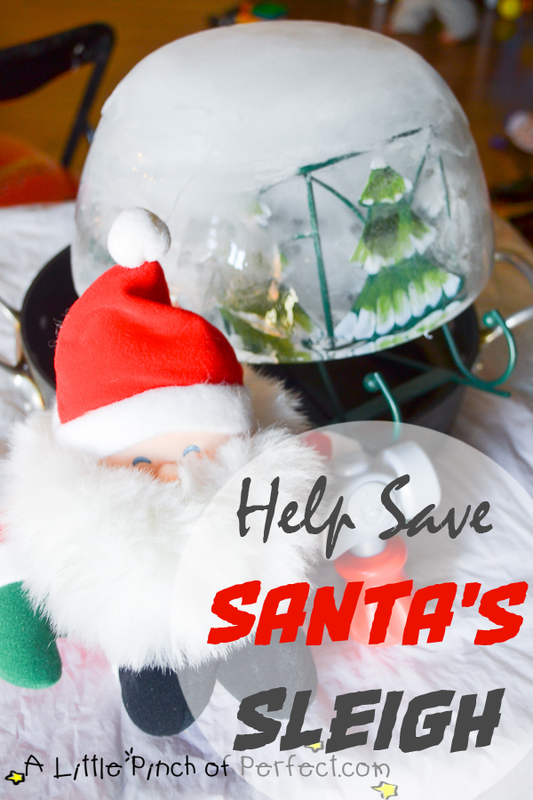 Help Save Santa’s Sleigh is a hands-on activity where kids work together, using science to melt the ice and help rescue the big man. 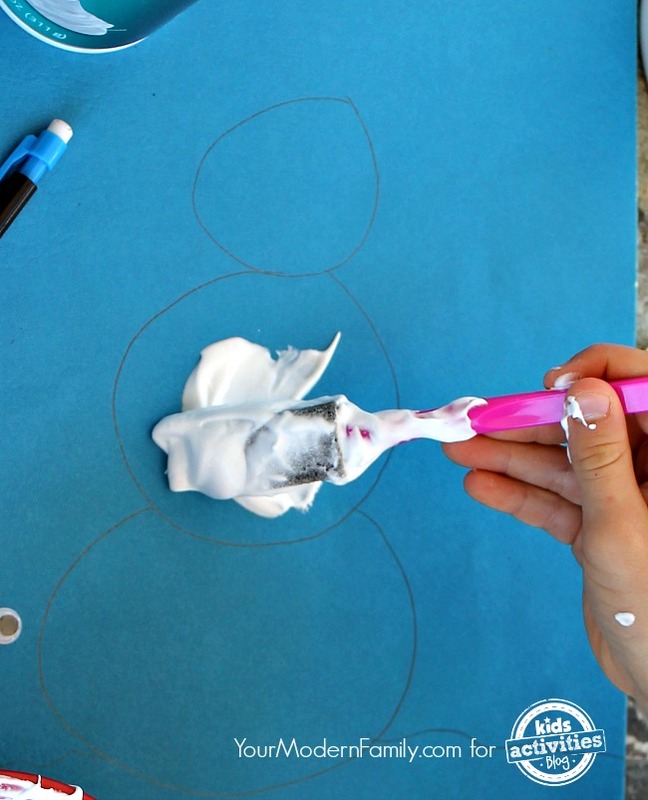 Cotton balls are a fun craft supply for kids. They can be anything from snow to an animal’s fur. 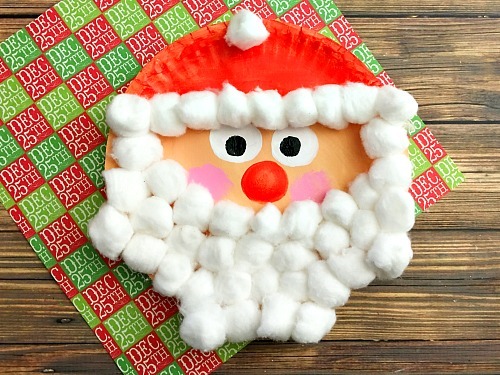 In this paper plate craft, they make Santa’s beard big and puffy. Parents – this is a project where you have to do the actual assembly. But trust me, once these Santa and friends finger puppets are together, your child will have fun playing out their own fun holiday scenes. Pretend play is an awesome way for kids and learn. 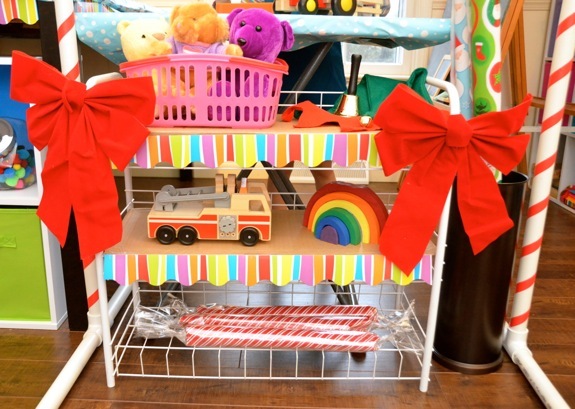 Set up some supplies and engage your child with playing Santa’s Workshop. Gotta get those gifts ready for all the good girls and boys! 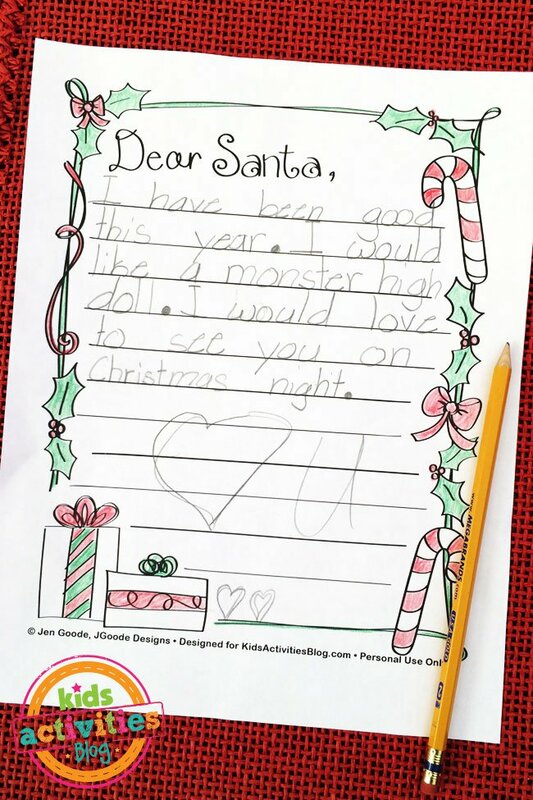 Build and practice letter writing skills while writing to Santa this holiday, then send it to him in the North Pole! 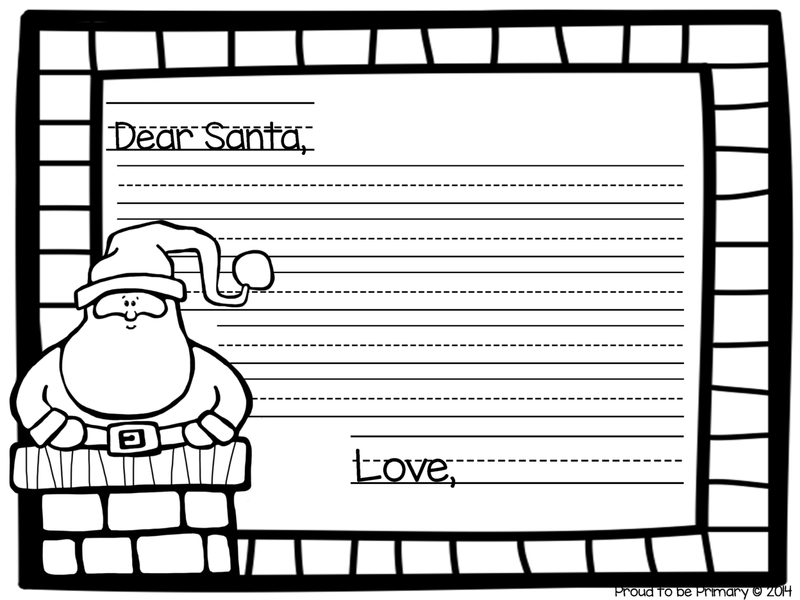 Another free a letter to Santa template. This is a great option for older children who can write independently. Have fun with this clever rendition to the Bingo song. 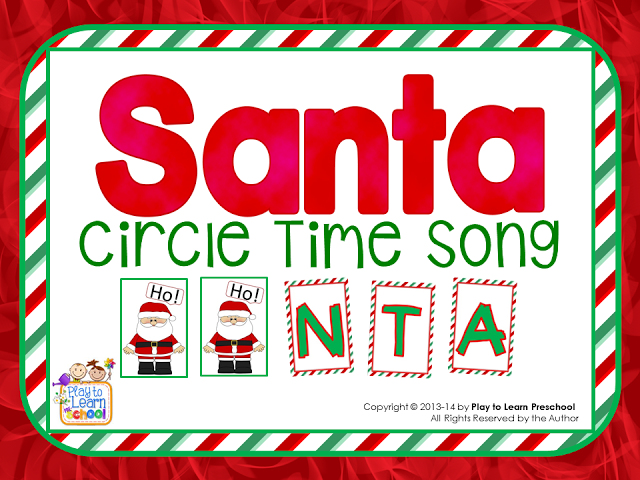 This is a great song to get kids moving this holiday! 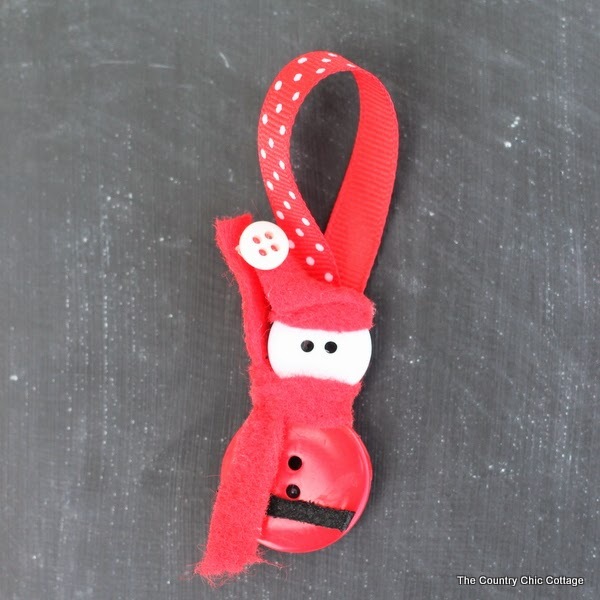 The small pieces in this button Santa ornament are perfect for those who are a little older and still working on their fine motor skills. 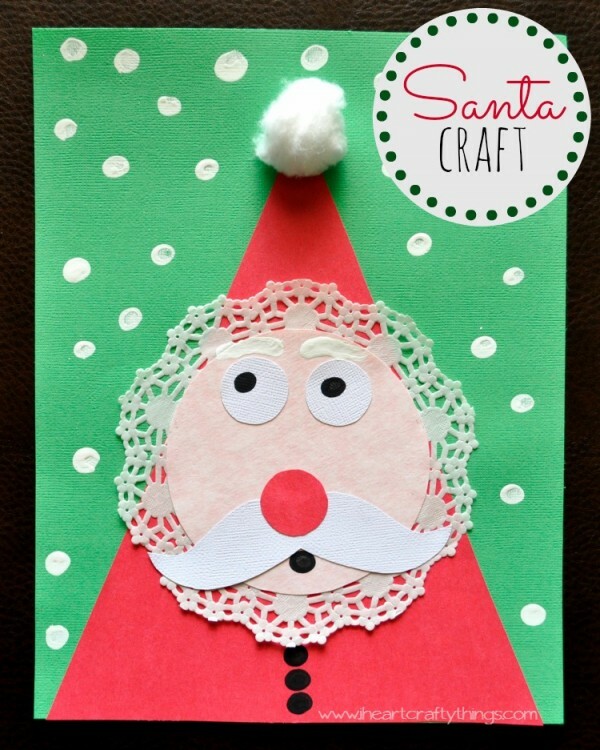 Watch as your child transforms a doily and some construction paper into this fun Santa picture. Oh no! Santa’s heading down the chimney to deliver presents, but it looks like he’s gotten stuck! 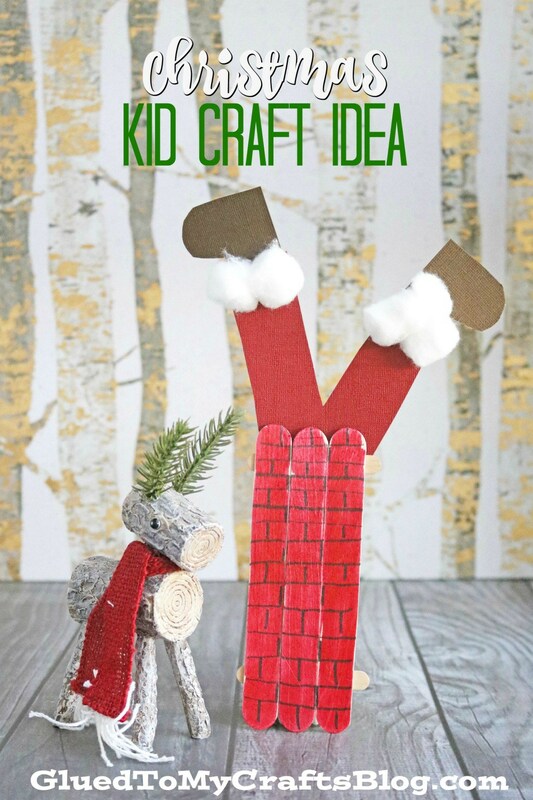 This is a cute craft project sure to make your children giggle. 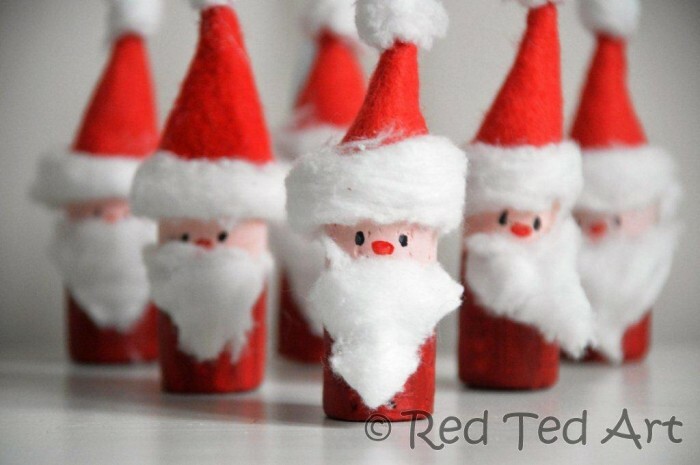 Use up those leftover wine corks by turning them into little Santas. Once the craft portion is done, you and your child can bowl them over. 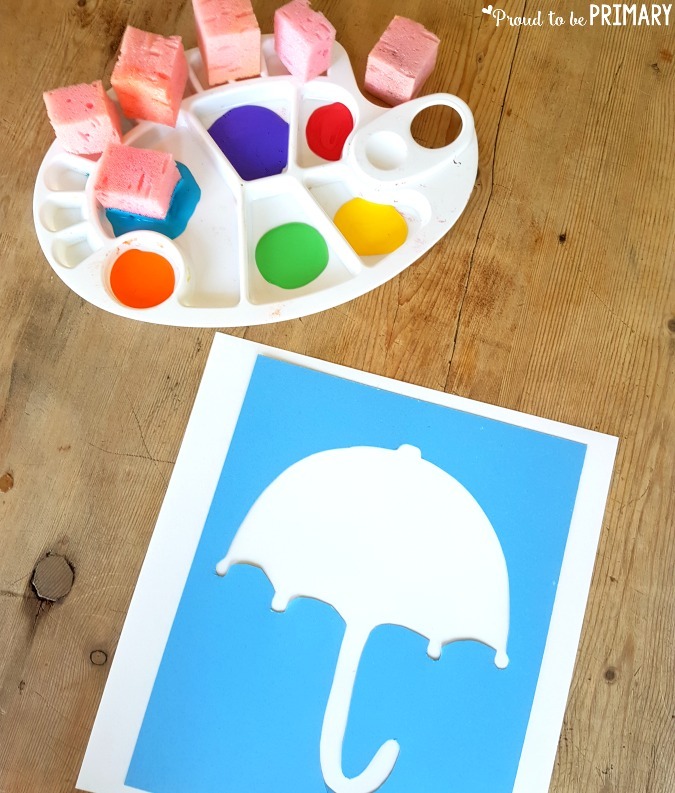 Printing is such a fun craft technique to share with your children. 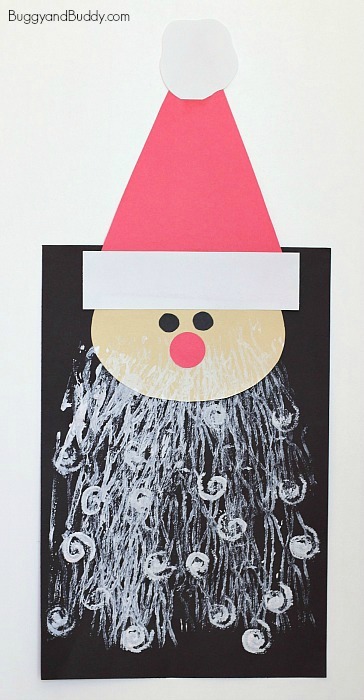 They’ll have loads of fun by printing a big full beard for Santa. What Santa activities are you going to use this holiday season? Have a favourite to share? 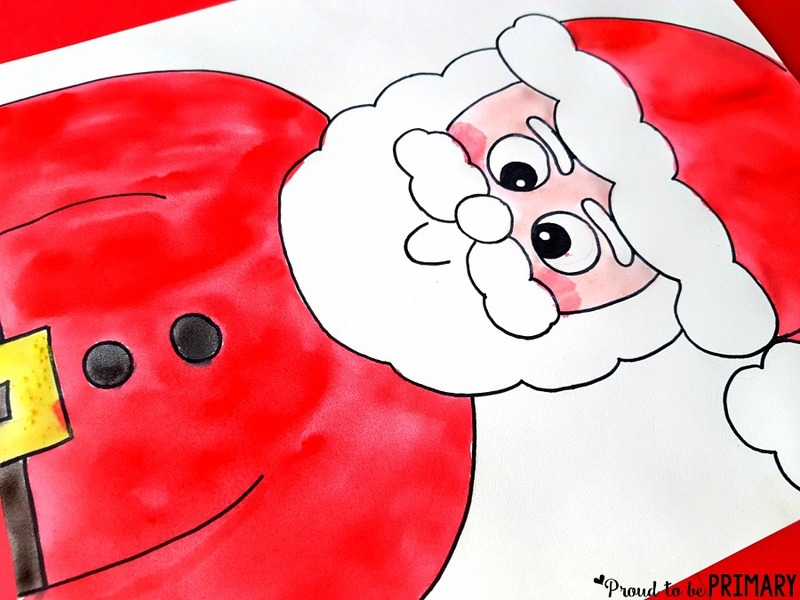 Santa Claus Drawing – The Jolliest Art Activity! 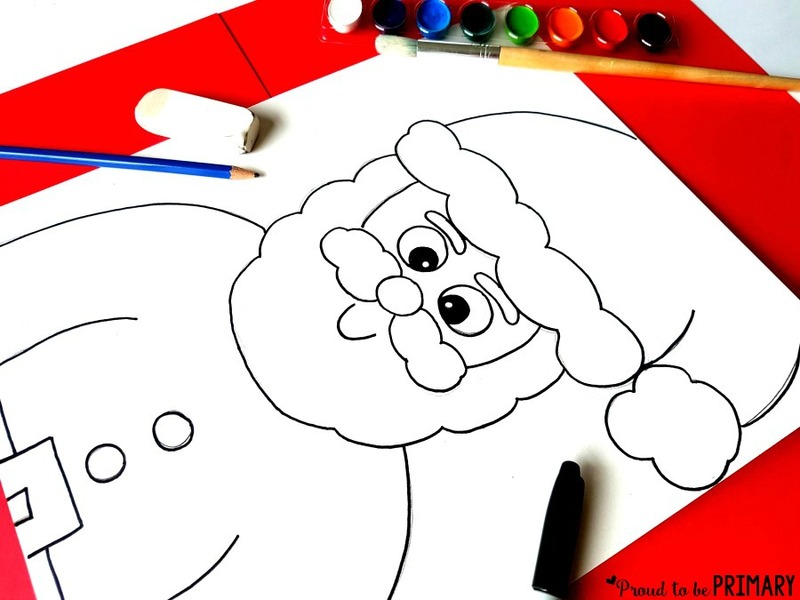 Santa Claus drawing activity with simple to follow directions that are perfect for decorating those bulletin boards. 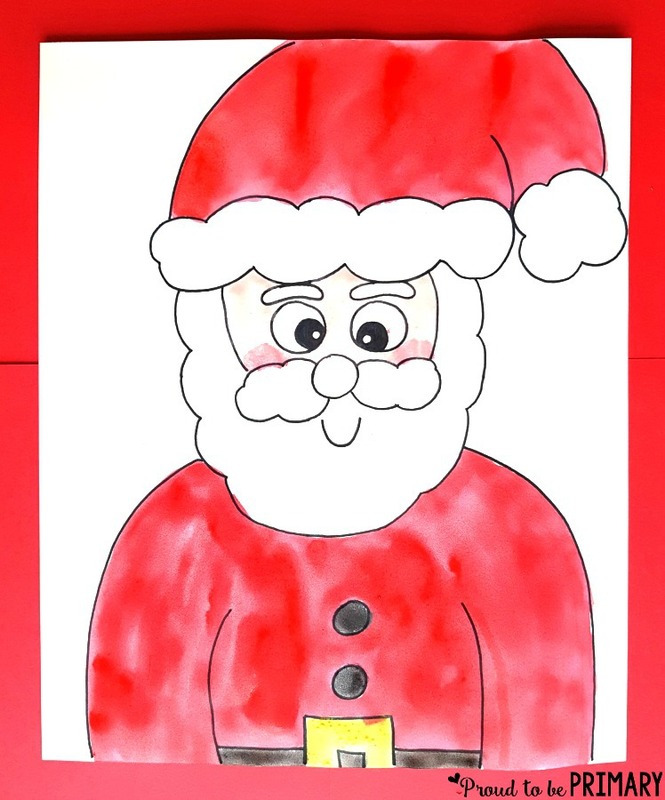 Santa Claus Drawing – The Jolliest Classroom Activity! It’s the time of year for learning about Santa Claus! 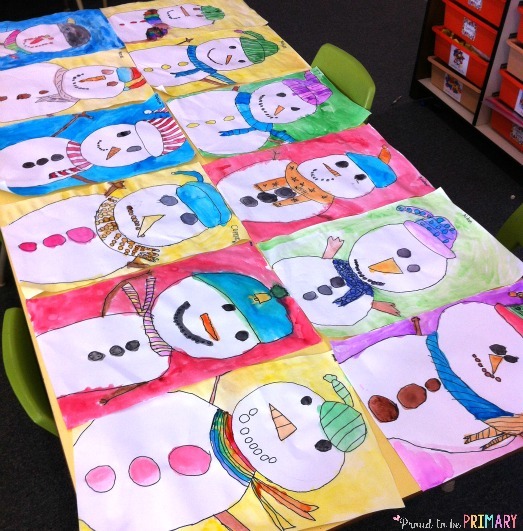 Or possibly, you just need a fun and festive art activity for your classroom? 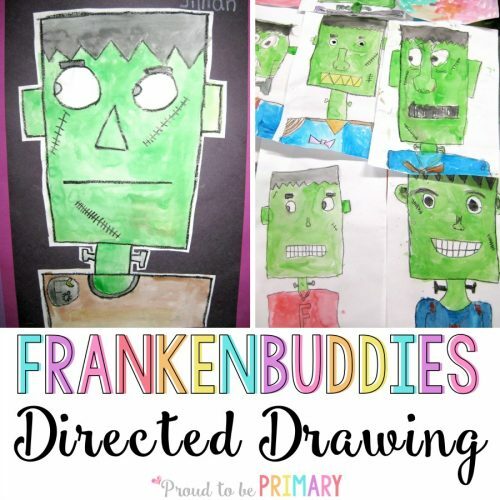 Either way – this directed drawing activity will be so much fun for your students. 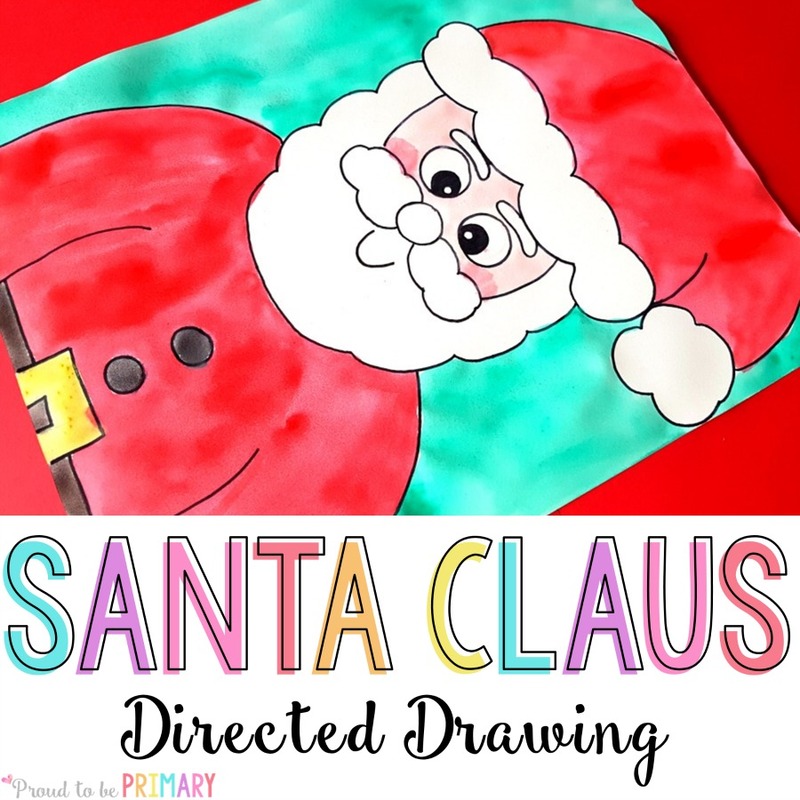 This Santa Claus directed drawing can be adapted for any primary classroom or completed at home with a few simple materials. You will need white art paper, a pencil, an eraser, a fine black marker or Sharpie pen, watercolor paints, and larger paintbrush. I recommend proper paper meant for painting because it can handle the water and shouldn’t tear the paper if used properly. When teaching this art lesson to a class I recommend standing front and center and using a large easel and chart paper to draw on. Students can sit at tables with their supplies. I take things slow and draw each step and give each instruction one at a time. I give my students plenty of time to follow along and ask questions. You will have the most success if you model the lesson this way and take your time. 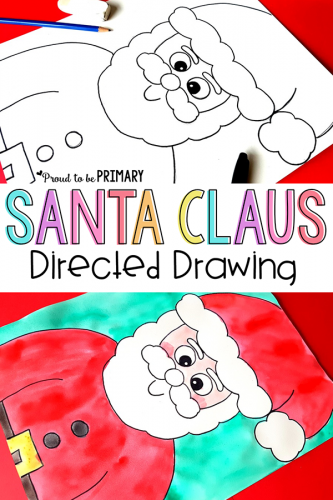 Below are all the steps for the Santa Claus directed drawing art lesson. 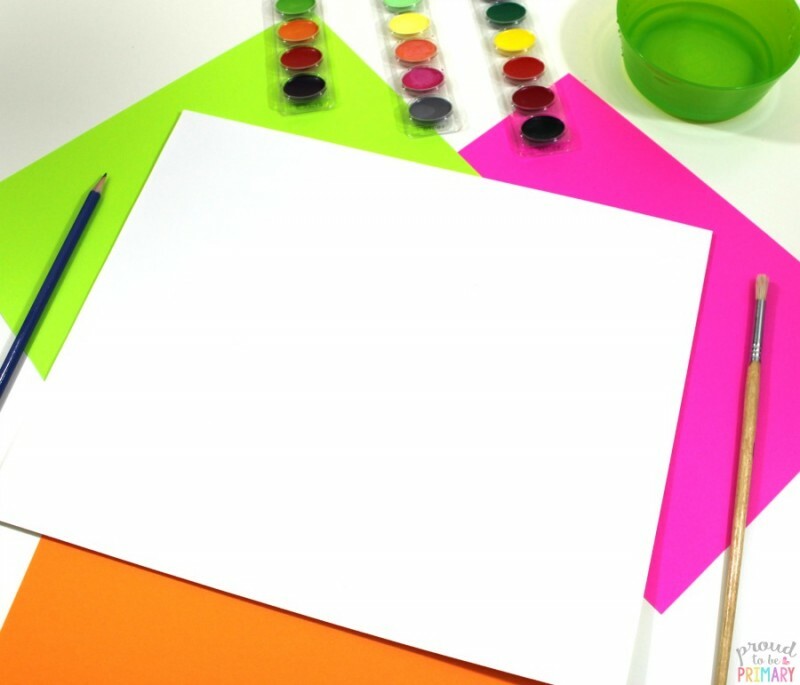 Place a large white piece of art paper in landscape orientation. 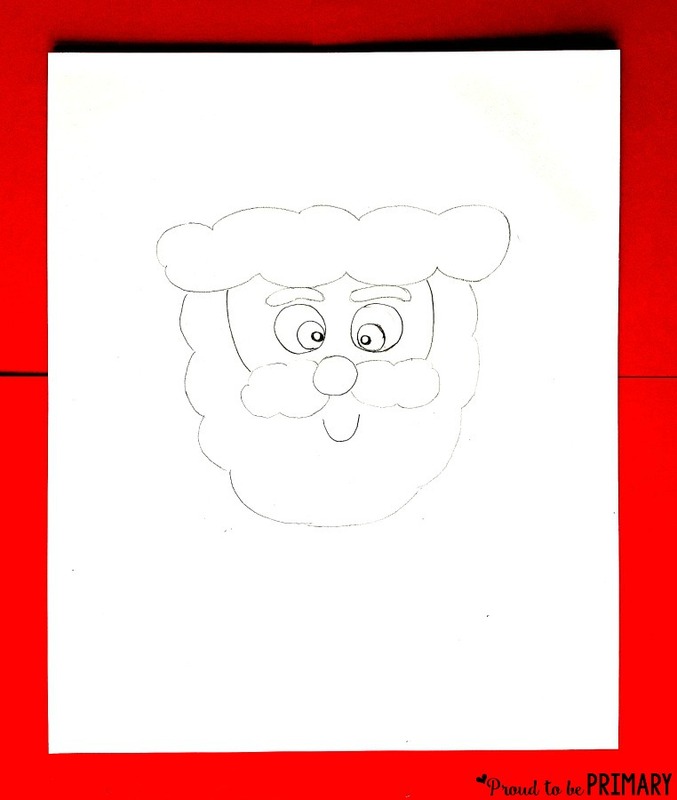 Start by drawing a small circle in the center of the page for Santa’s nose. Next draw two small cloud shapes on either side of his nose to make his mustache. 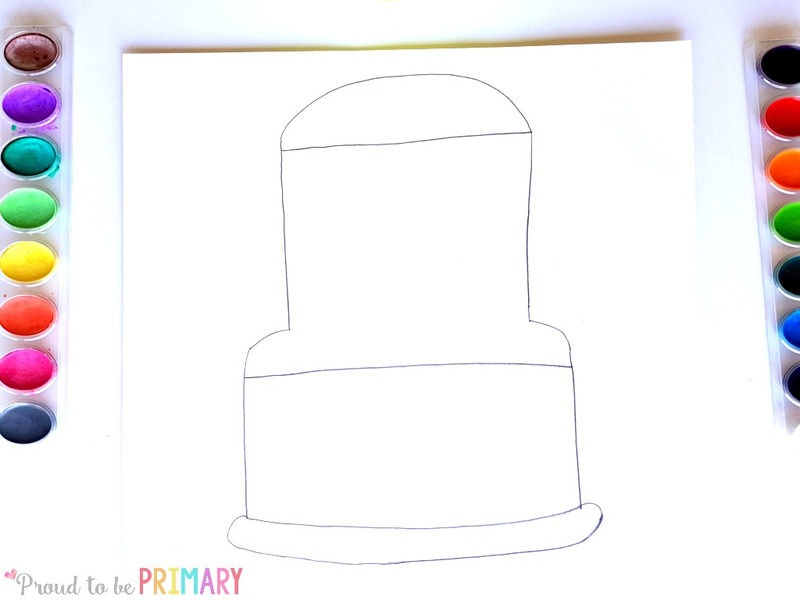 Draw a flat cloud shape above his nose for the bottom of his hat. 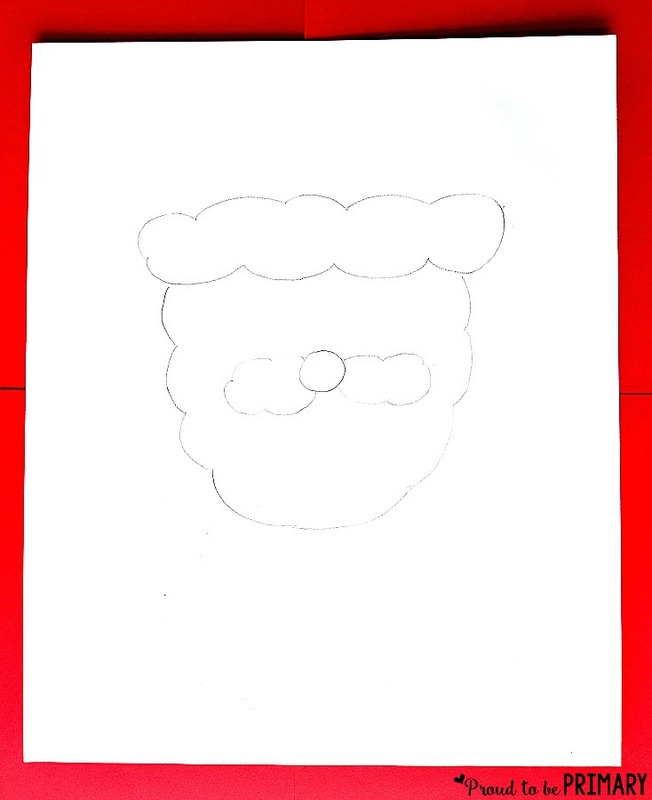 Then draw the outer part of Santa’s beard with a cloud shape again. Add two circles above the nose for Santa’s eyes. Inside his eyes draw two more smaller circles for his pupils, as well as two more tiny circles inside. Next draw a bean shape on top of each eye for Santa’s eyebrows. Give Santa a small smile. Draw a curved line on both sides of Santa’s face connecting the top of his mustache to the bottom of his hat. 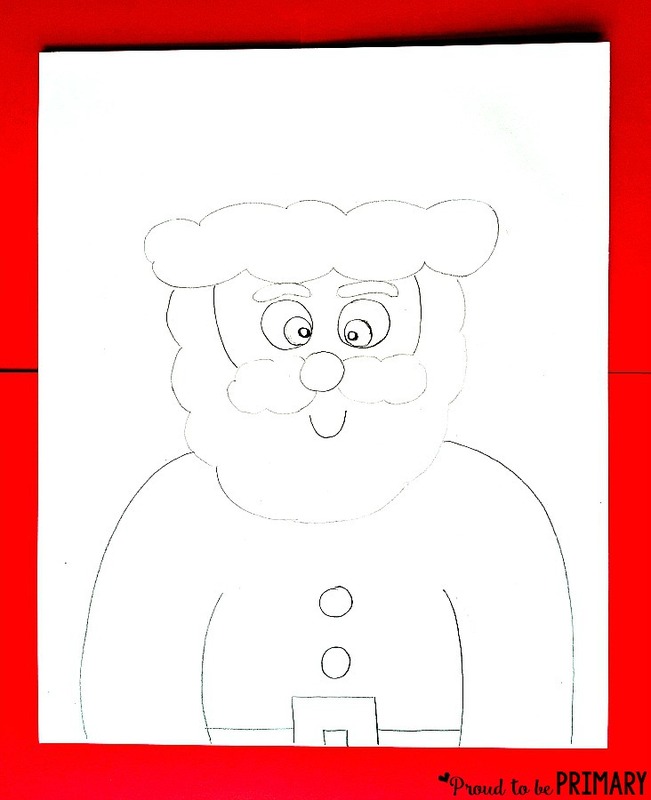 Draw a curved line on each side of Santa’s body starting from his lower beard down to the bottom of the page. Add another, smaller curved line on each side going down to give Santa arms. Give Santa a belt buckle by drawing an open rectangle in the center at the very bottom of the page. Add a smaller open rectangle inside. Join the buckle and the arms with straight lines going across. Draw two small circles above the buckle for Santa’s buttons. Now for Santa’s hat. Tell students that it is supposed to look like Santa’s hat goes off the page. 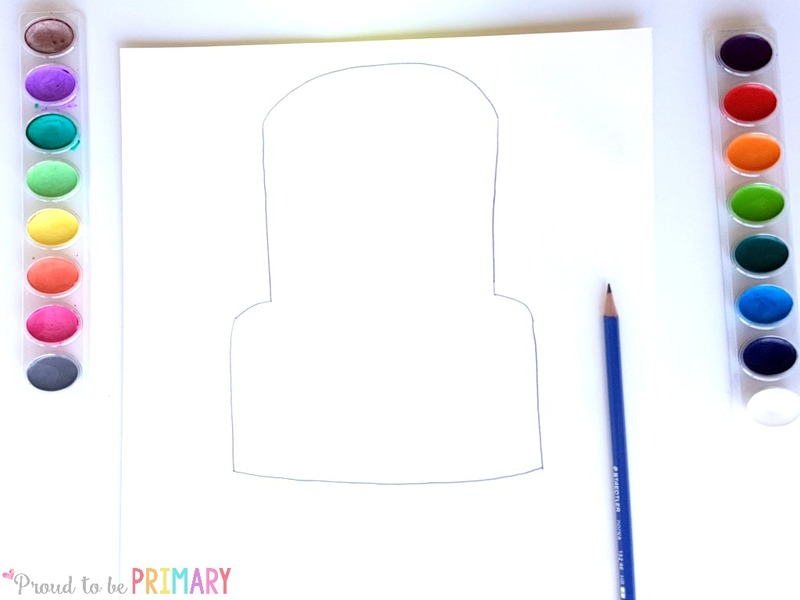 Draw a curved line going up from the left end of the hat to the top of the page. Then, draw another small cloud shape on the right side of the hat. After that, draw two small curved lines going up from the cloud shape. One line will go to the top of the page and the other only part way to make it appear that Santa’s hat is hanging to the side. 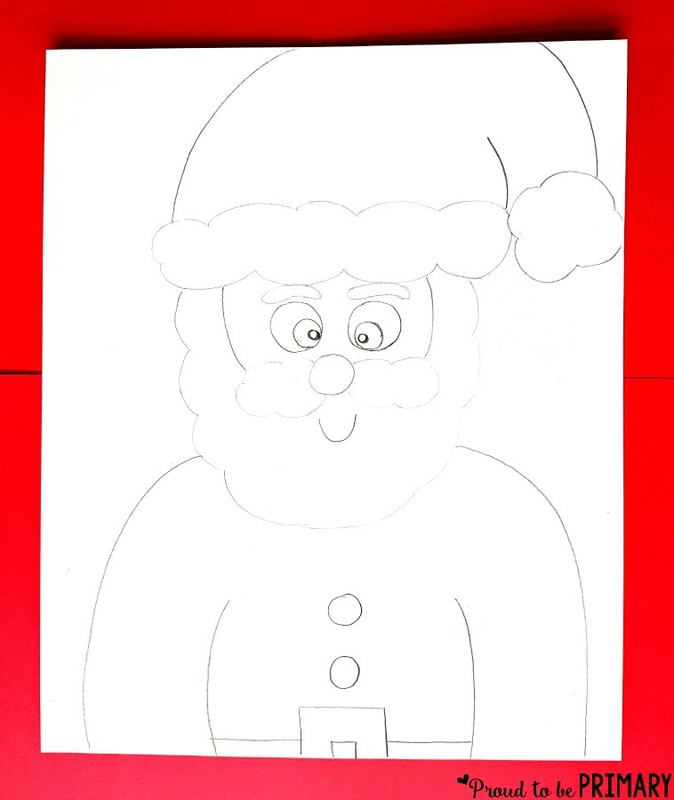 Use a fine point black marker or Sharpie pen to trace all the lines of the Santa Claus directed drawing. Erase the pencil lines with a good white eraser. I usually complete the activity over two days or periods of time. On day one we complete the drawing and the tracing with a black marker. One day two we paint. If your class hasn’t used watercolor paints before, you should demonstrate how to make proper brush strokes with a paintbrush and the water to paint ratio. I usually use larger paintbrushes instead of the small ones that are normally included with watercolor paint sets. 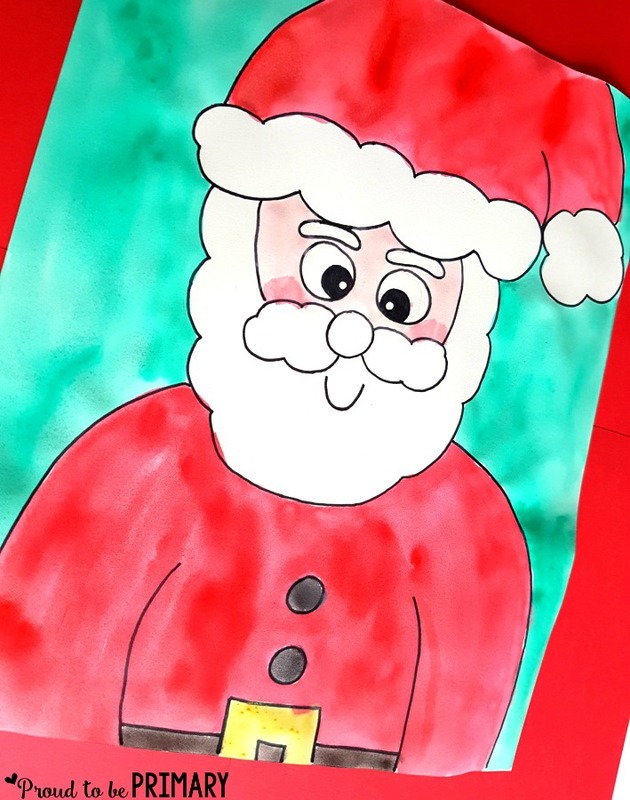 Use watercolor paints to paint the red parts of Santa’s coat and hat first. Next paint his face (with or without rosy cheeks) and paint his belt buckle. 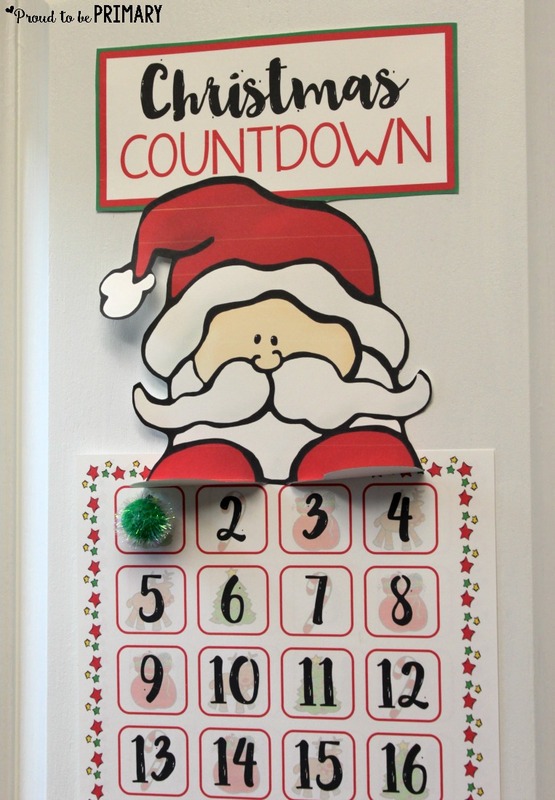 Lots of Santa will be left white (the rim around his coat and hat) so make sure to point that out to children. It is up to you if you wish to leave him on white paper or paint the background. I choose a bright green for the back to make Santa pop! You could also cut Santa Claus out and glue onto construction or other special paper. Once everyone completes their Santa Claus directed drawing, place them somewhere to dry completely. Don’t make the mistake to hang them or place them upright. Paint and water would drip down onto the pictures. Once dry, I recommend hanging them up or creating a fun bulletin board display for Christmas time. Send them home so families can hang and enjoy Santa as well! You can download and print the instructions for the Santa Claus directed drawing to use in your classroom this holiday season by clicking the image below. Click images to view these popular posts! 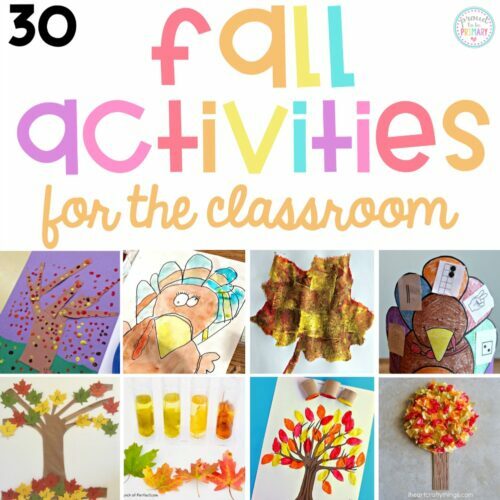 A Leaf Activity to Create Fall Classroom Excitement! 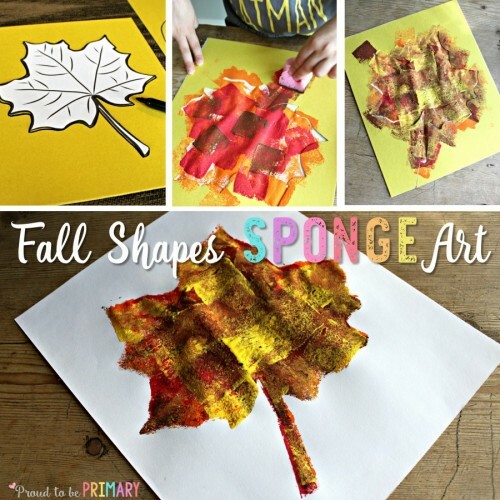 Try this leaf activity! Learning about leaves this fall has never been more fun. Also, grab your FREE pack of leaf science templates! Perfect Leaf Activity: Fall Classroom Excitement! 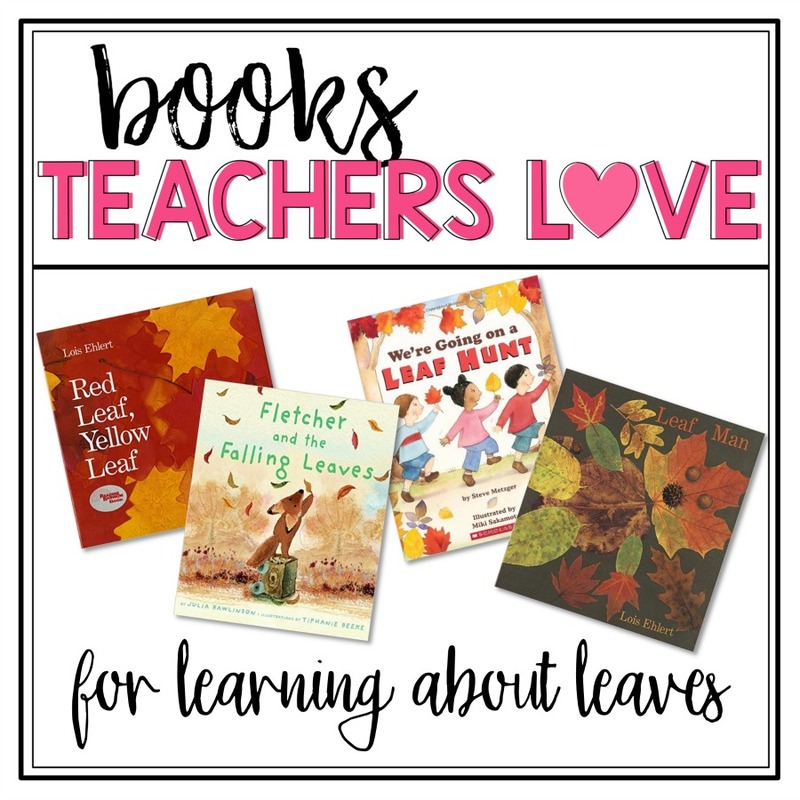 This post highlights a few of my favourite children’s books for fall that will help you teach about the changing leaves. 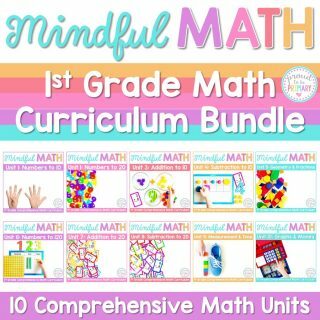 It includes four different books for fall, an activity or two to go along with each, and a free science resource for teachers. I love the changing leaves! The beauty in the variety of colours together takes my breathe away! Fall is a wonderful time for exploring outdoors and learning about nature. Fall brings so many changes and these changes are fascinating for children. Collecting leaves on nature walks and learning about leaves can encourage curiosity and thoughtful exploration. 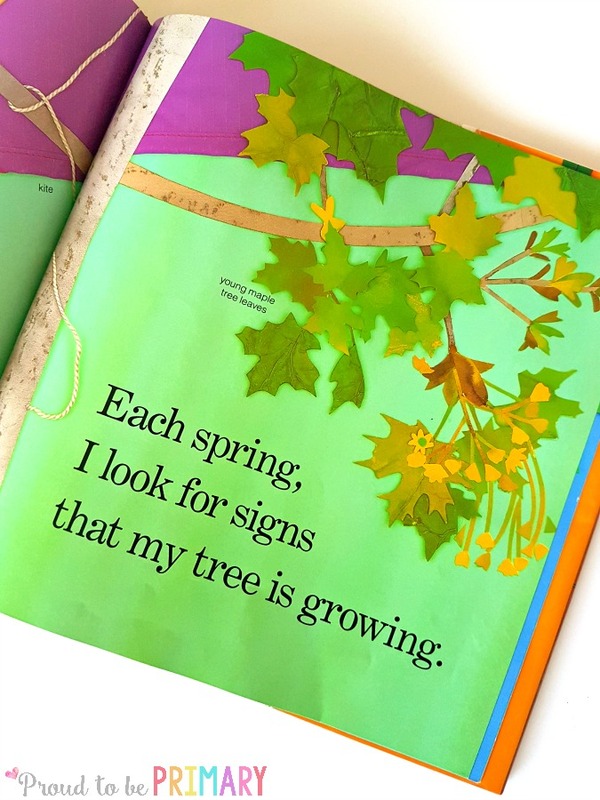 By teaching children about trees and their leaves, we are connecting with the world around us. By picking up, touching, and holding leaves, we are using our senses and connecting with nature. This science exploration is interesting, real, and something all children can connect to. 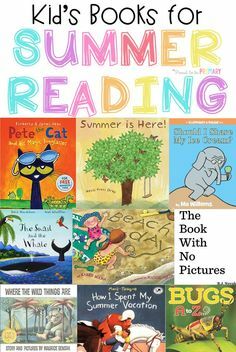 I strive to have a bookshelf full of children’s books for each season in our classroom. I use children’s books to help me teach many things related to the fall season. 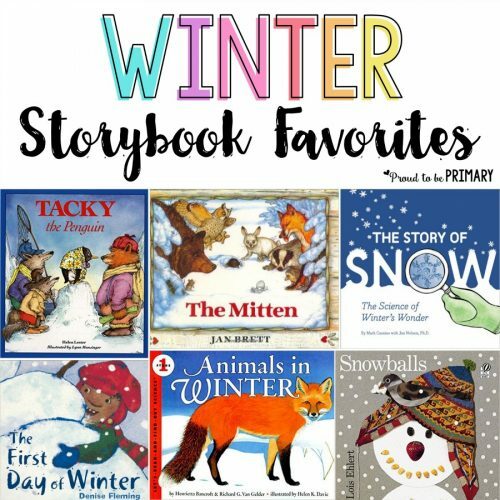 My post, Favorite Books for Fall, is filled with the best thematic, fiction and non-fiction children’s books for fall available. 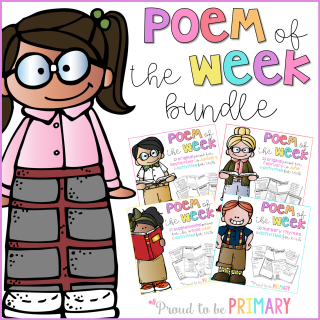 If you are looking for some engaging and informative reads that are suitable for primary aged students, these books are for you! 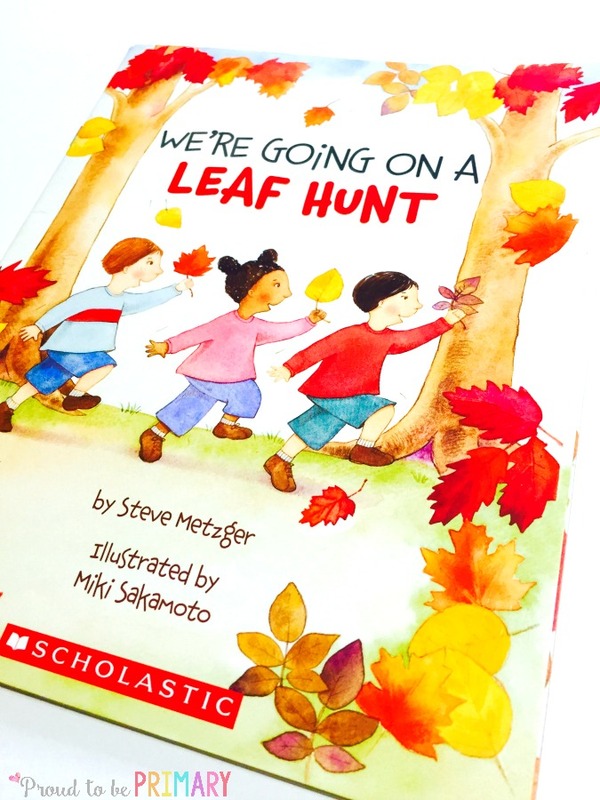 The book We’re Going on a Leaf Hunt by Steve Metzger is a perfect book to read before going on a nature walk with children. It introduces children to a few different types of leaves that they may find on their hunt for leaves. Children look and find colorful leaves along their hunt, as well as another surprise…a skunk! Before going on a nature walk with children, read We’re Going on a Leaf Hunt and a non-fiction book about leaves. Bring in a few leaves ahead of time to teach them what types they are. Teach children the names of a few leaves that they may find. You could also wait until after your nature walk when children have found their own leaves to examine and hold. Go outside on a “leaf scavenger hunt” as a class. Give students a small seal-able bag that they can put their leaves into. Encourage them to use their senses and find leaves that are different colours, sizes, and shapes. Allow them to collect seeds or small sticks that has fallen from trees. After the leaf hunt, have students share a few things they found with the class. Students can draw and write what they found on their hunt. Ask students to choose 4 different leaves that they like best. Students can draw or do leaf rubbings and write down how each leaf looks. 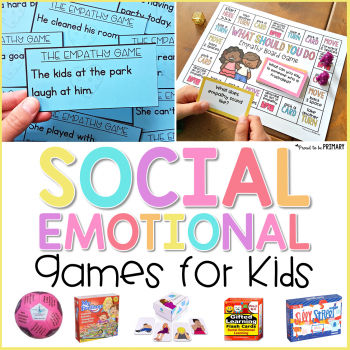 Printable activities are provided for free later. 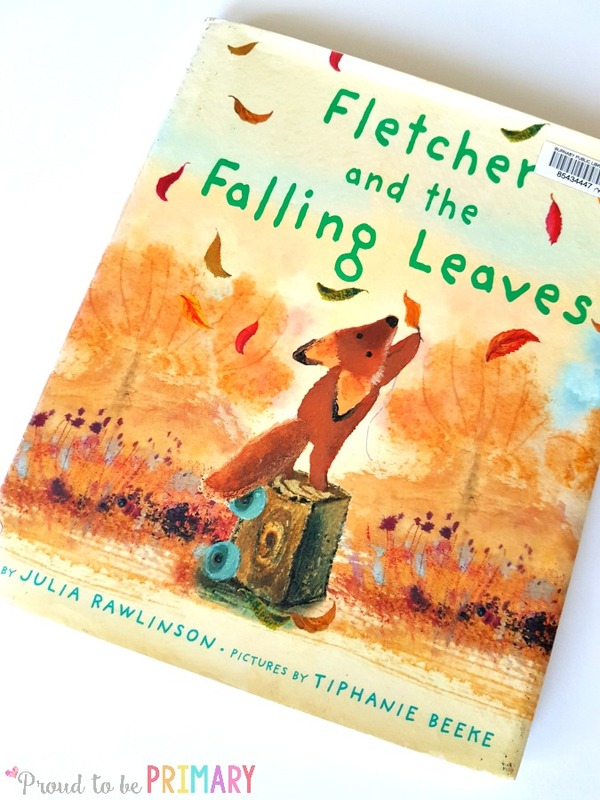 If you are looking for the perfect fiction book to read this fall, read Fletcher & The Falling Leaves by Julie Rawlinson. Children will adore this story! Its beautiful illustrations and thoughtful story pull on your heart strings and make you really appreciate each moment in each season. 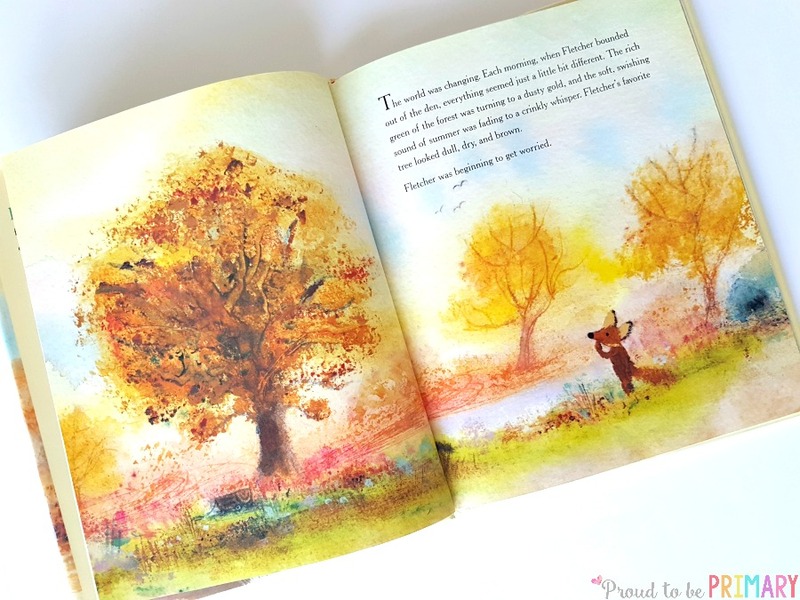 Fletcher is a sweet fox that discovers the changes that fall brings to his friend, the tree. He learns that his favourite tree changes each year and with each change brings a new beautiful surprise. After reading Fletcher and The Falling Leaves with your class, talk about the four seasons and the changes a tree undergoes in a year. 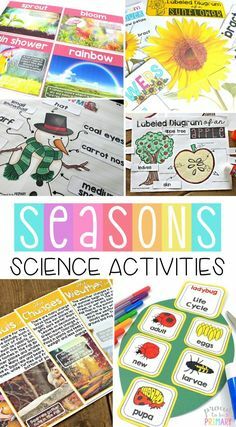 Create an anchor chart together with a tree for each season. Have students give suggestions and help add on to each of the trees with things like leaves, buds, flowers, apples, animals, etc. Label each tree with the season. After the class lesson, students can illustrate and colour the different seasons of a tree. A printable for this activity is provided later. 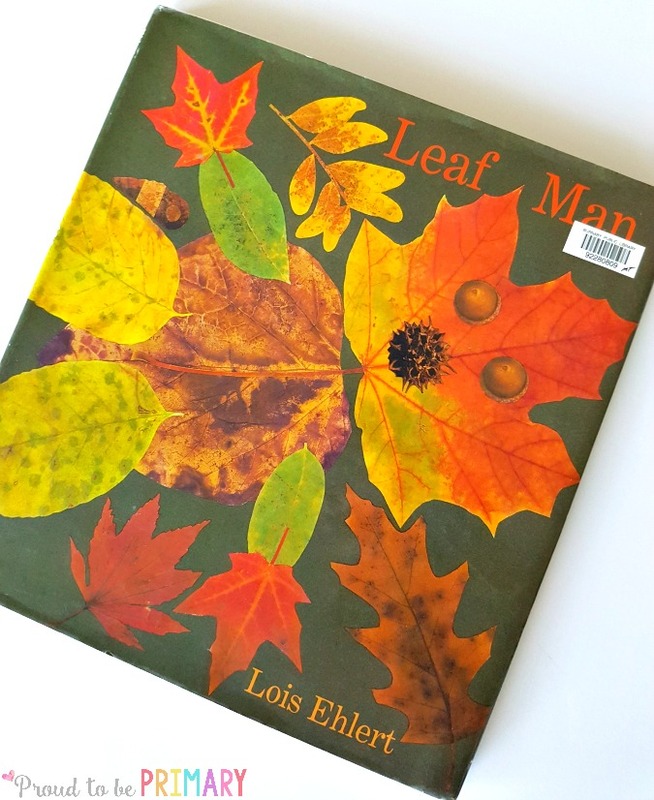 Leaf Man by Lois Ehlert is a fascinating fiction book that follows the travels of fallen leaves. At the beginning of the book there are pictures and names of leaves for you to learn. The Leaf Man art in this book are colour copies of actual leaves collected by the author. 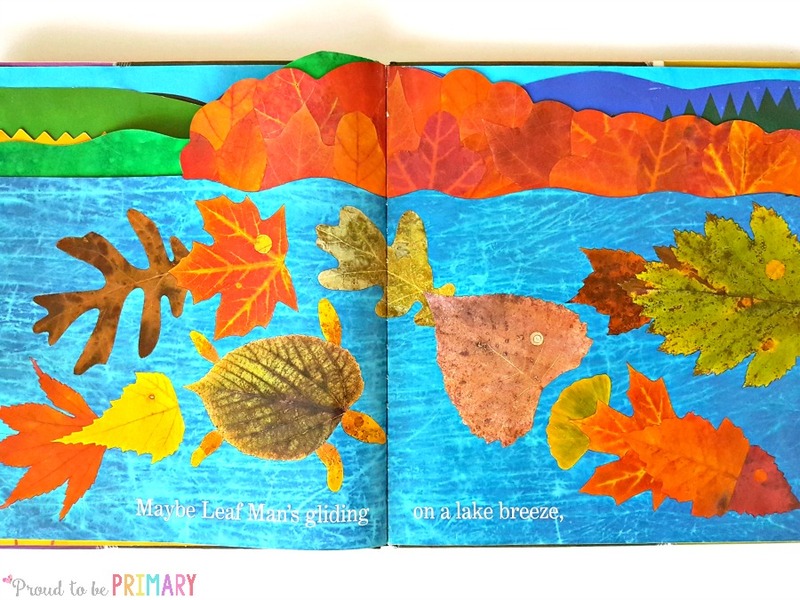 This book encourages us to use our imaginations and imagine leaves in new ways. The pages tell a story of travelling leaves changing from one thing to another. It encourages those experiencing the story to find their own Leaf Man. Children love using their leaves from their leaf hunt to make a collage. After reading Leaf Man, have students play with their leaves and outside treasures. Steer children to create something like they saw in the book or something from their imagination. Maybe a leaf man or women, an animal, insect, or fish. Once they have created something they want to keep, glue the leaves and other items on paper. To prep for the activity, enlarge the leaf collage template (provided below) and glue it down on heavier cardstock or construction paper. Allow the collages to dry completely before hanging. 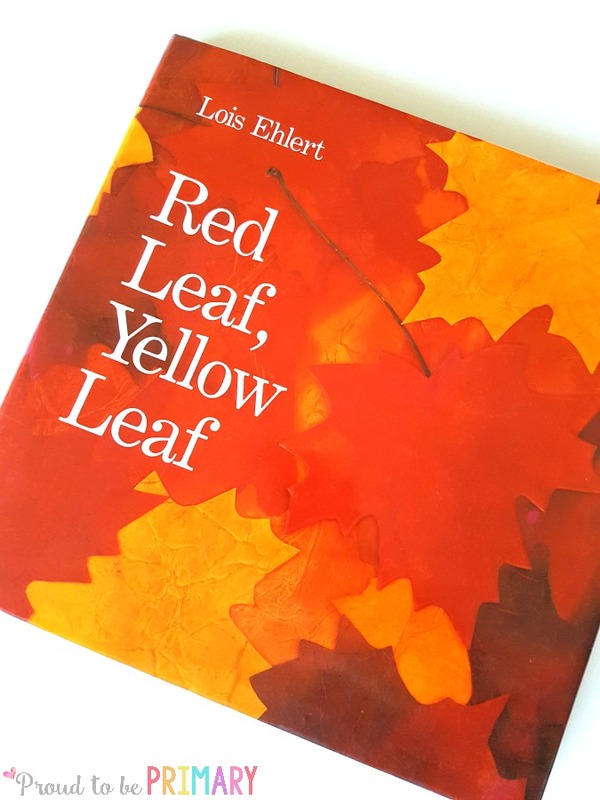 Red Leaf, Yellow Leaf by Lois Ehlert is a great book for teaching children about the life cycle of a tree. It captures what it is like for a tree to be transplanted and raised in a new location. The coloured copies of real leaves in this book help bring it to life as we learn how a maple tree comes to be. It starts life as a winged seed and ends as an adult tree, though its journey may be long. If you have the opportunity, plant a tree with your class and watch it grow through the school year and into the future. This will be such a powerful learning experience for children. Use Red Leaf, Yellow Leaf as a guide. Discuss the life cycle of a maple tree using the book. Create an anchor chart and talk about and illustrate together the steps it takes for a tree to become full grown. Students can then illustrate the life cycle of a tree independently using one of the templates (provided below). I have each of these books on our bookshelf and I highly suggest you seek them out. 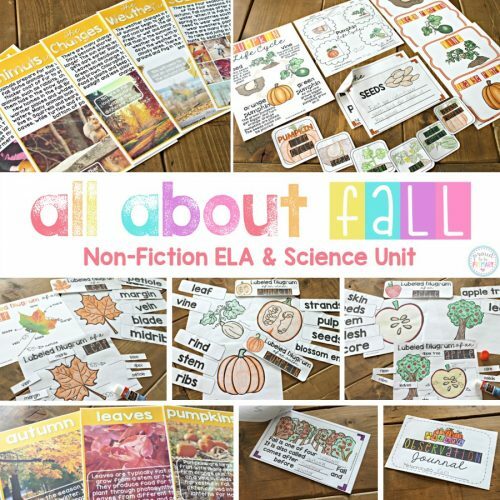 Grab FREE leaf science templates to go along with the books mentioned above and your leaf exploration by clicking the image below. 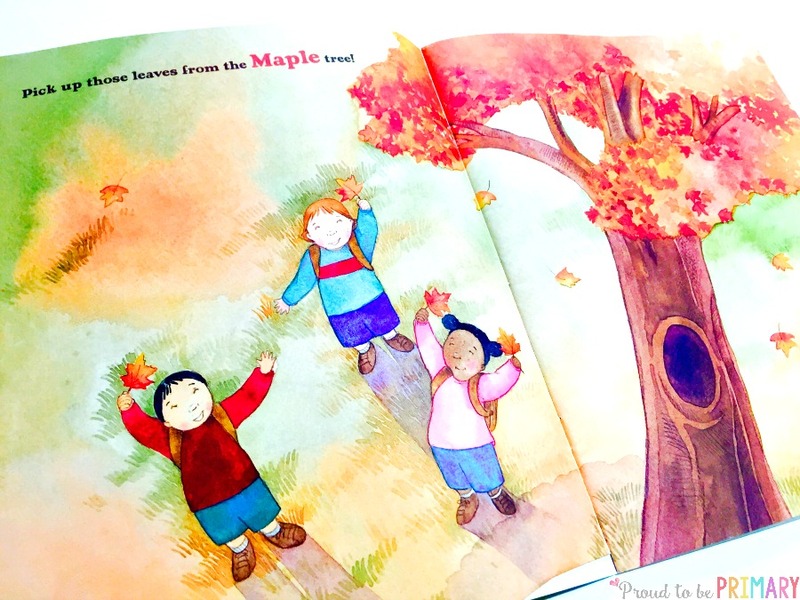 You will receive 7 pages that coordinate with the activities and books provided above to help you with your fall leaf and tree exploration. 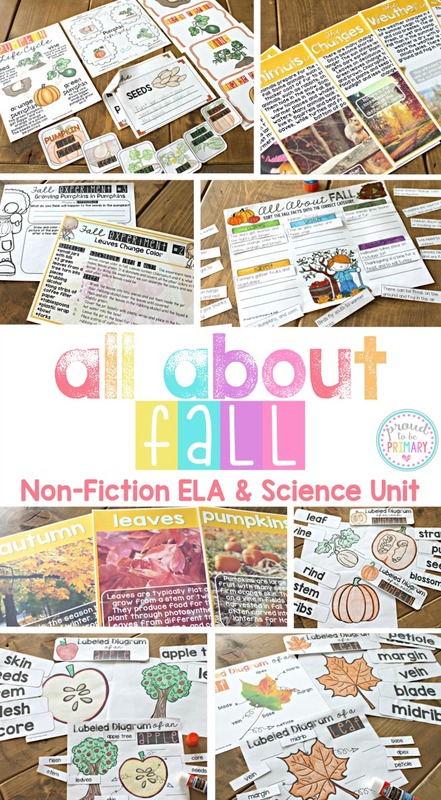 Looking for more science and non-fiction ELA activities for your class this fall? This resource is jam-packed with a ton of materials for an in-depth study on leaves, pumpkins, apples, and more. 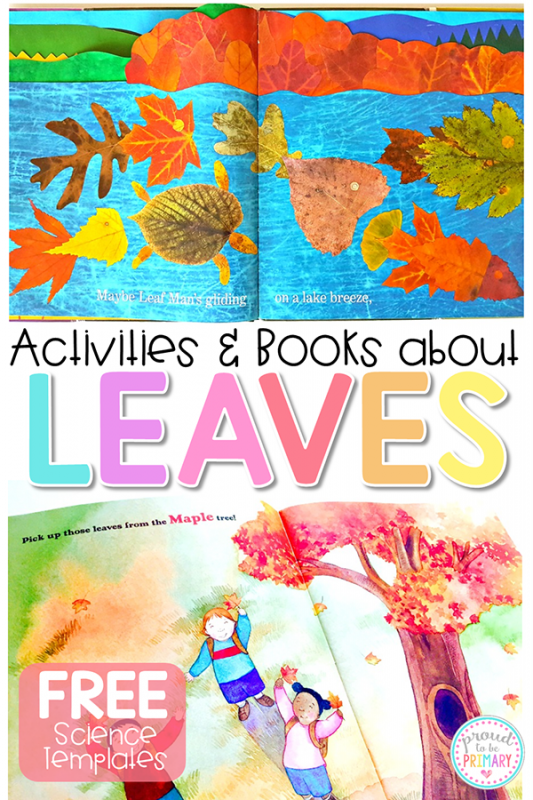 What to Do Along with This Leaf Activity: Add These Ideas! 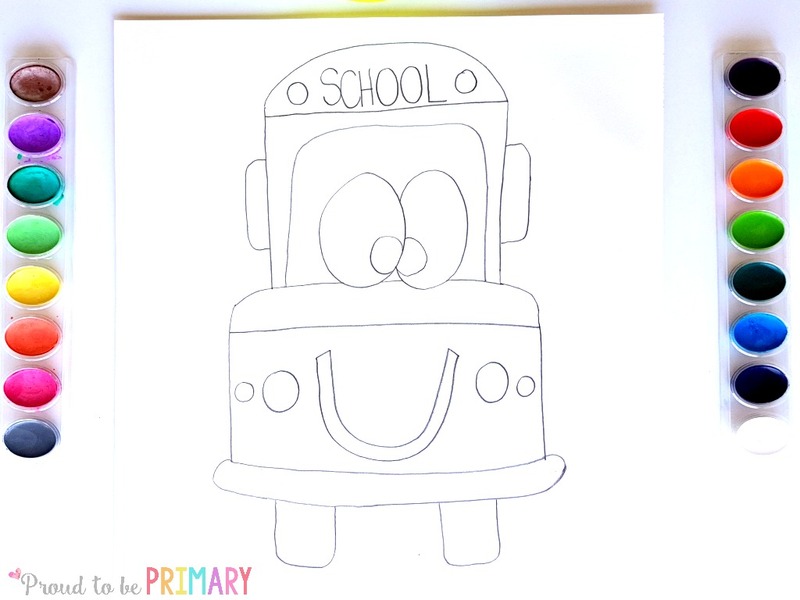 School Bus Drawing Activity in 6 Easy Steps! 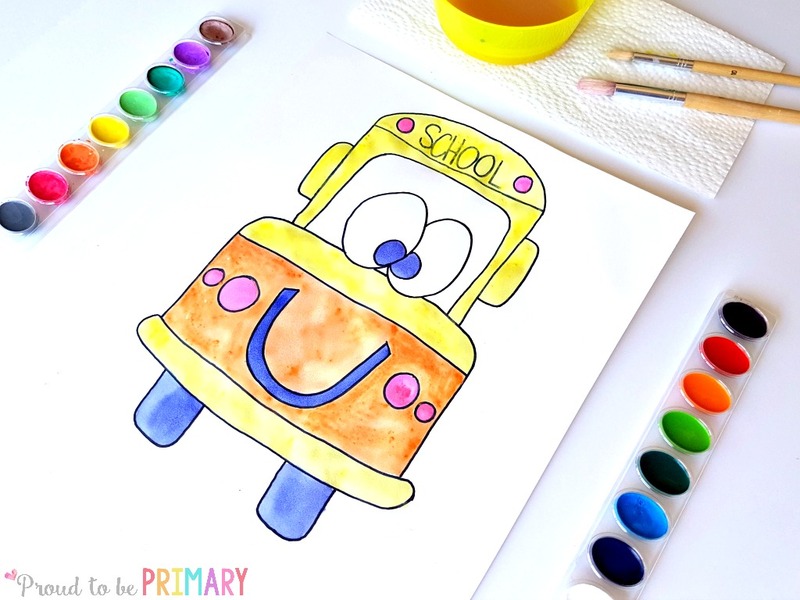 A back to school bus drawing art activity for kids with easy step by step instructions that teachers can use in the classroom. 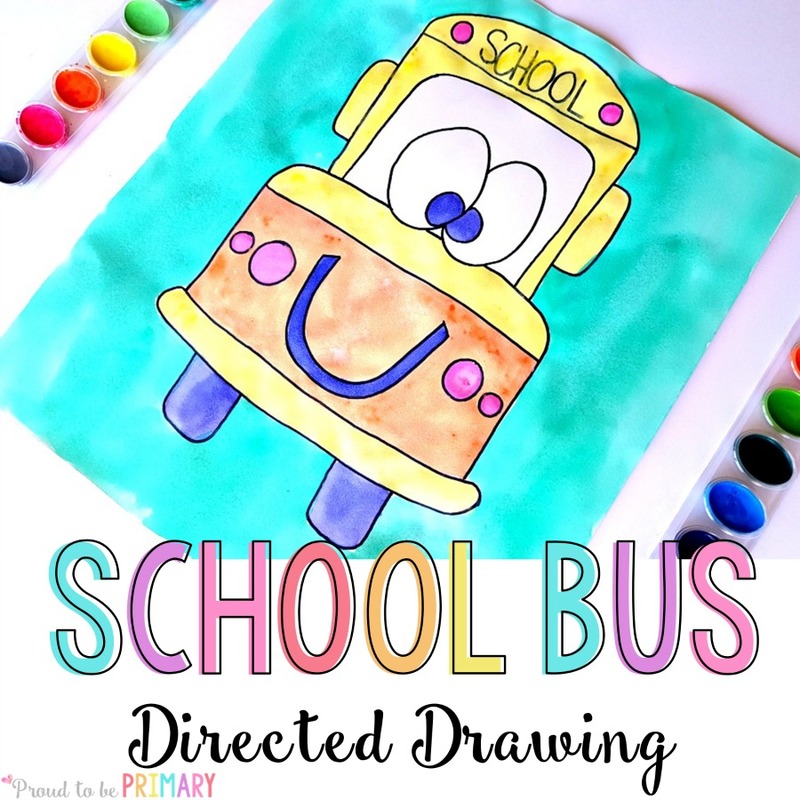 Kids love to draw, and that’s why this back to school bus drawing will be the perfect activity during the first days and weeks of school. 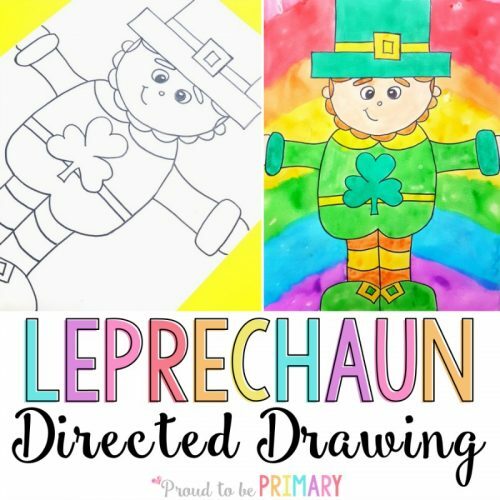 Practice following directions, important hand-eye and fine motor coordination skills, and learn a few fun tricks in artistic drawing. 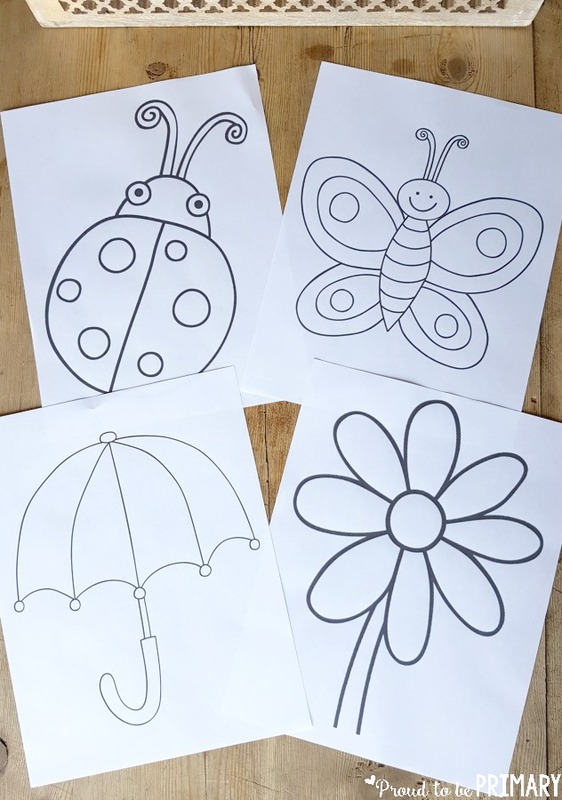 Use the drawings to decorate your bulletin board or walls for a cheerful scene. 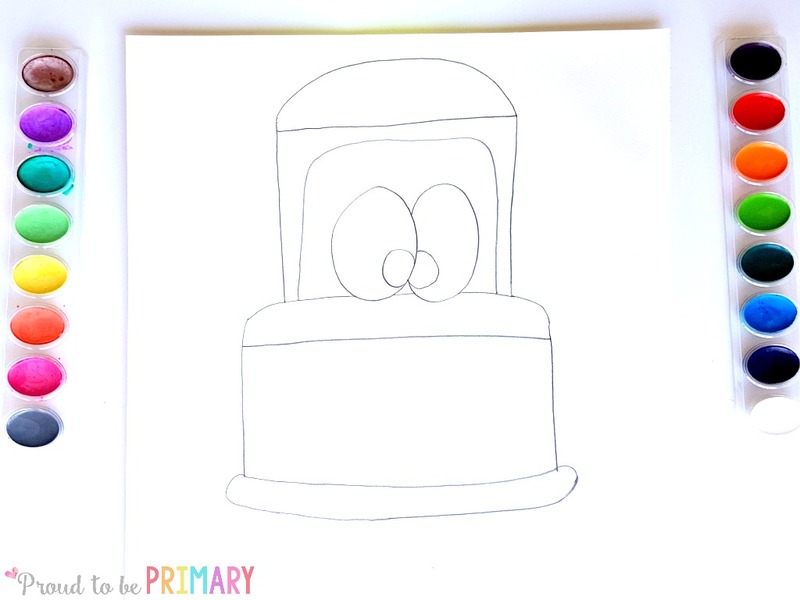 This is just one of the many directed drawings available for teachers – make sure you check out all of them! 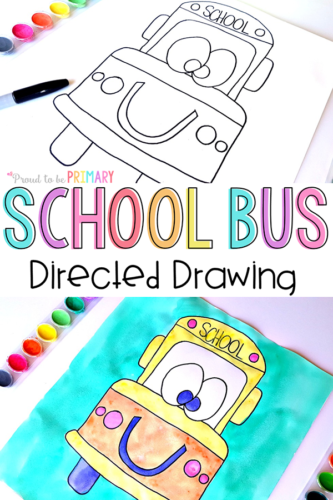 This school bus directed drawing can be adapted for any primary classroom or completed at home with a few simple materials. You will need white art paper, a pencil, an eraser, a fine black marker or Sharpie pen, watercolor paints, and larger paintbrush. I recommend proper paper meant for painting because it can handle the water and shouldn’t tear the paper if used properly. Below are all the steps for the back to school bus directed drawing art lesson. 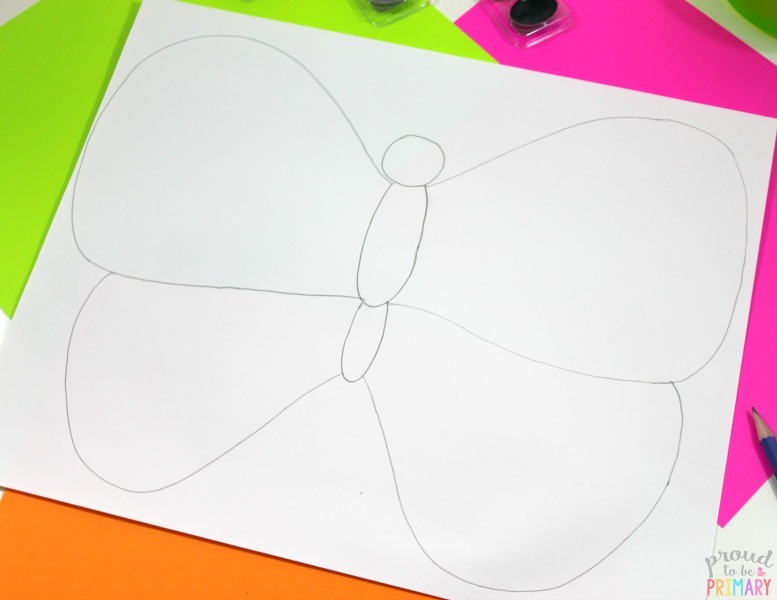 Place a large white piece of art paper in landscape orientation. Starting by drawing a curved line at the top of the page that comes straight down on both sides to the middle of the page. Draw a curve and straight line down from the side. Repeat on the other side. Do not come too far down the page to leave room for the bumper and wheels. Connect both sides with a line going across. Draw two straight lines going across. One near the top of the bus and one near the middle. To complete the bumper, draw another line at the bottom and connect with curved lines on the sides. Draw two large eyes in the center of the top part of the bus. Draw the eyes one at a time so that they can connect. Add a smaller circle inside each eye. Draw a line going across the middle so it connects both sides. Erase any lines that may have been drawn into the eyes. For the window, draw a curved line going up from the middle on both sides and around the top. Now add the details. Draw a U shape about an inch wide under the bumper on both sides of the bus for the wheels. Draw a few circles for lights on the front of the bus. Add a smile to the front of bus to give it a mouth. Give the bus ears by drawing a curved line on both sides. Write the word SCHOOL along the top of the bus and draw two more circles for lights. 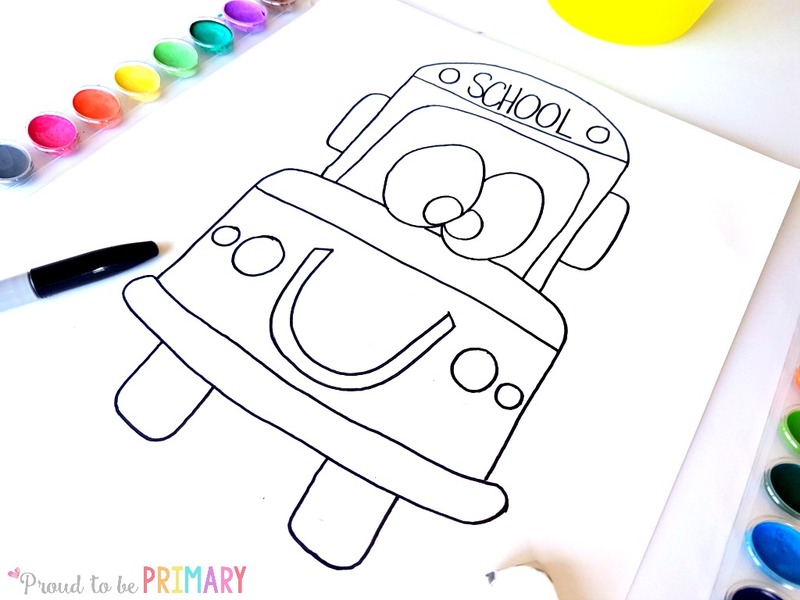 Use a fine point black marker or Sharpie pen to trace all the lines of your school bus directed drawing. Erase the pencil lines with a good white eraser. 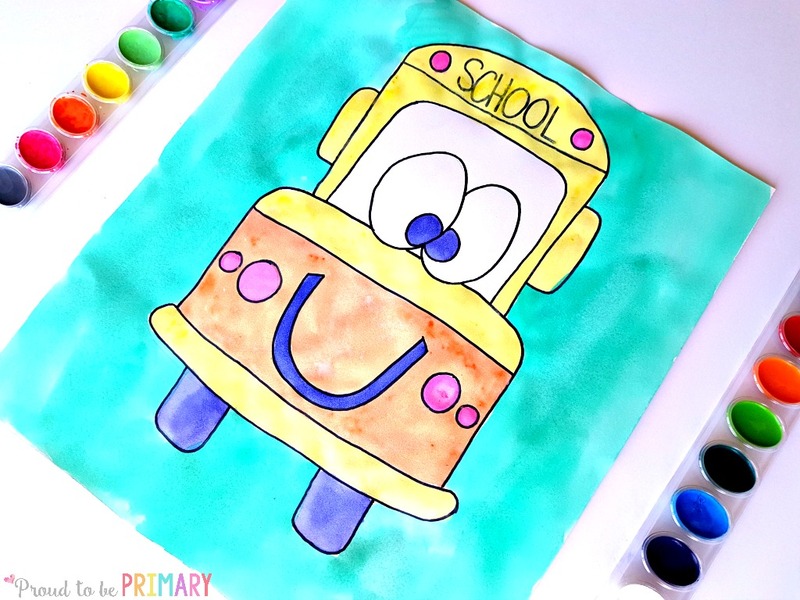 Use watercolor paints to paint the body of the school bus first, starting in the center and working your way outward. I used yellow for the main parts of the bus and other fun colors for the details. Bright colors really pop! Use one color completely before moving on to the next color. You could continue to paint the background a different color or leave it as is. You could also cut the school bus out and glue onto construction or other special paper. Once everyone completes their back to school bus directed drawing, place them somewhere to dry completely. Don’t make the mistake to hang them or place them upright. Paint and water would drip down onto the pictures. Once dry, I recommend hanging them up or creating a fun bulletin board display for back to school time. You can download and print the instructions for the back to school bus directed drawing to use in your classroom during your art lesson by clicking the image below. 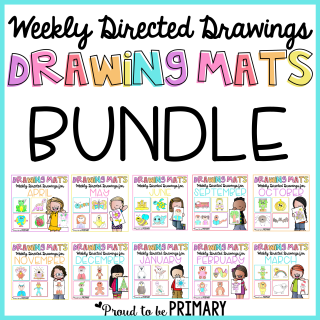 Looking for more drawing resources? 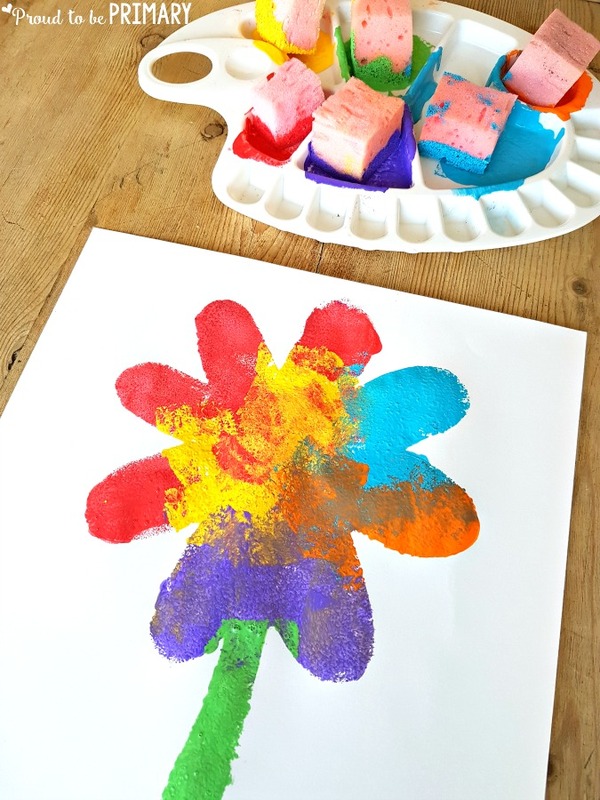 Shapes sponge art hands-on Spring art idea for children with a few simple materials to create a beautiful spring display in your classroom. 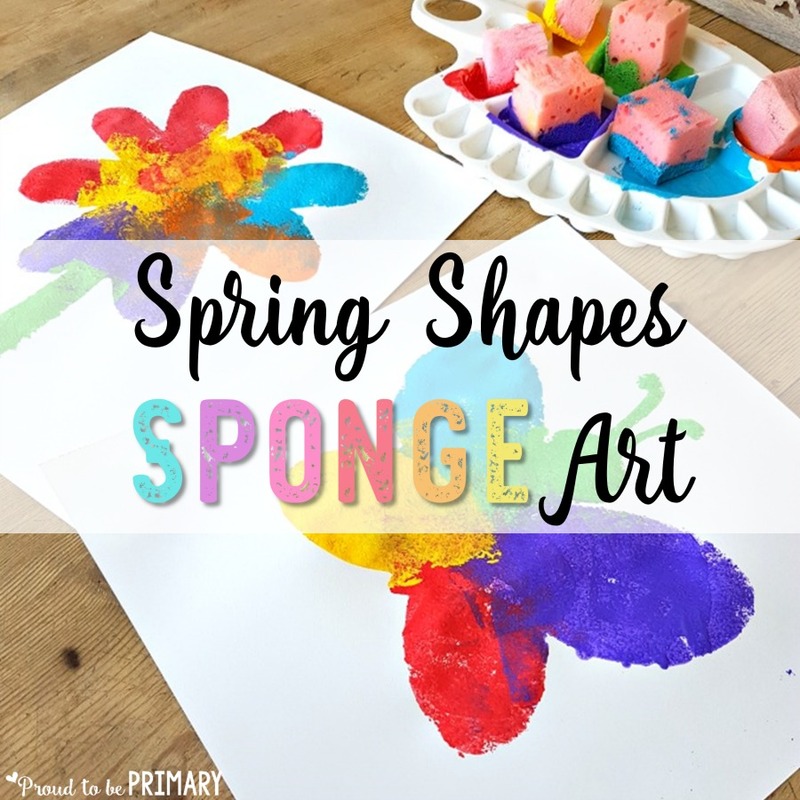 This post features a spring shapes sponge art lesson that can be taught and completed by children with the help of an adult. The technique of using sponges and layering bright paint colours creates beautiful results worth framing. We wanted to create some kid-created art to hang up for spring. We choose some cute clip art pictures with bold outlines that can be easily traced. I used shapes from the clip artist Kate Hadfield. 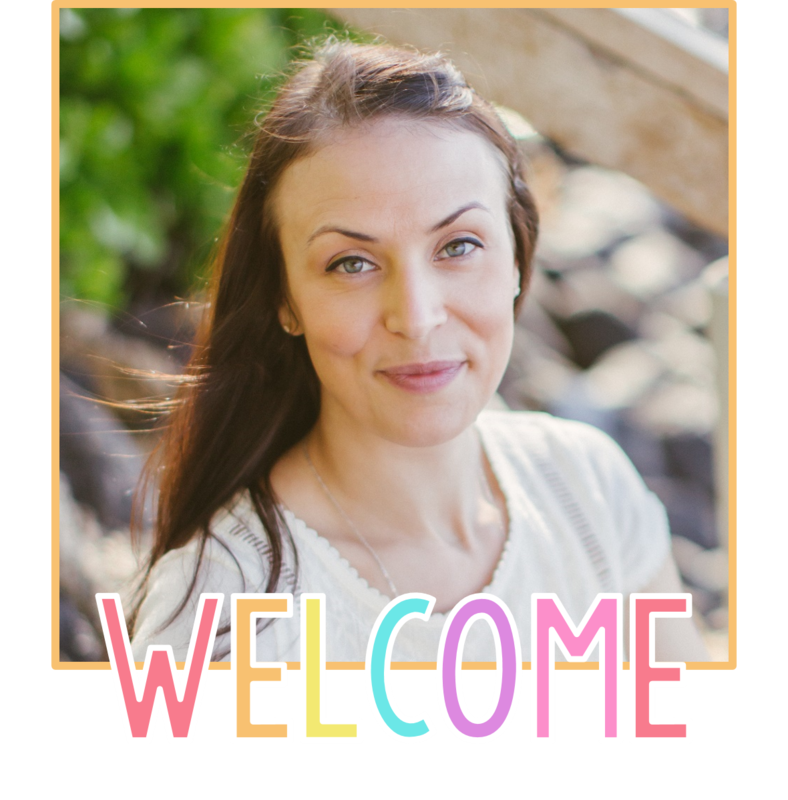 She has a great selection of seasonal sets and a creative look to her images. I enlarged the images in a PowerPoint document and printed them off the computer on white paper. 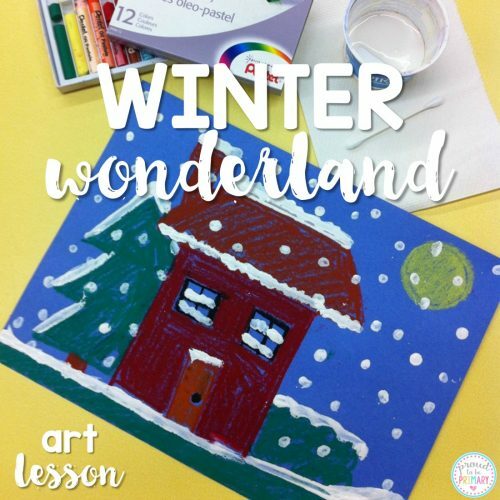 You could recreate this art activity with any images for any season or theme you wish. I cut the shapes out along the outlines. I cut pieces of heavier paper large enough to fit each shape inside. Then, I use a Sharpie marker and carefully trace the outline of each shape. I make sure the black outline is thick enough to follow during cutting. Each shape is cut out carefully with only 1 cut-in to the shape. After cutting out the shapes, I am left with the inner and outer pieces. 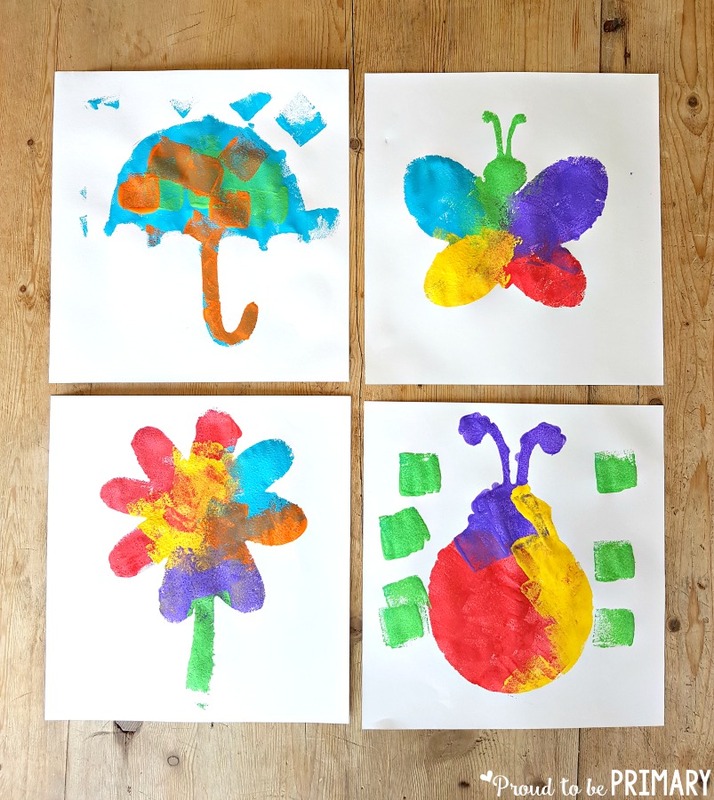 You can save the inner pieces and use those for a future art activity. 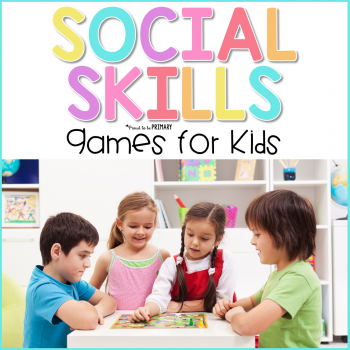 You will need the outer pieces for this activity. I cut white pieces of quality art paper approximately the same size as the blue paper. I suggest using a paper clip or bag clip to keep the two together while painting. This way there is no slipping and the shape stays exact. We bought a pack of sponges at the dollar store and cut them into smaller pieces using scissors. I pour acrylic paint onto an art palette to keep colours separated. You could use tempura paint if you wish. We use bright colours for spring. I have a different sponge ready for each colour of paint. 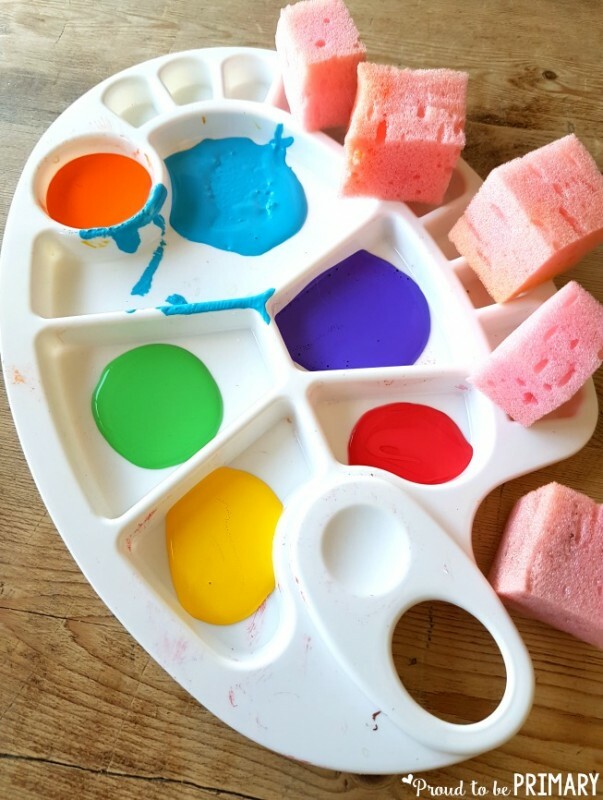 To paint, dab the sponge in one colour at a time and lightly drag off the extra paint on the edge of the palette. We use the sponge all of the inner cut-out, making sure to get all along the edges. We use different colours for each shape. Sometimes we layer the colours on top of each other. Sometimes we overlap the colours but used different colours for different parts of the shapes. We sponge paint each shape one at a time. We cover the entire shape and carefully remove the blue paper. Finally, we have beautiful results. 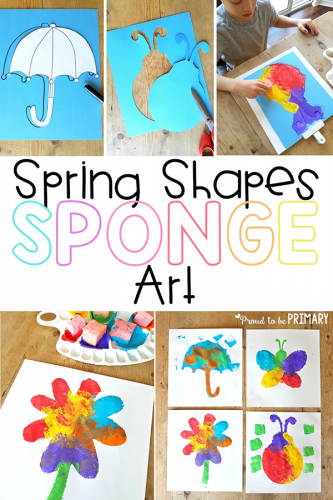 Our spring shapes sponge art turns out unique and bright. Great for any display in the classroom or home. NOTE: Let children get creative and add their own details. My son added rain for the umbrella and leaves for the ladybug. 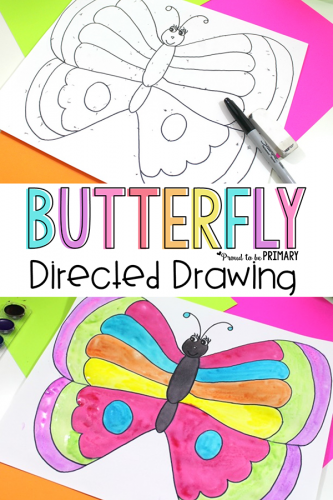 Teach students how to draw a butterfly with an easy to teach, step-by-step lesson. 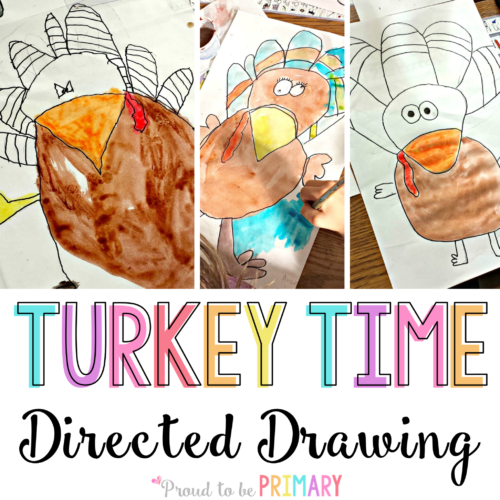 Kindergarten and primary kids love directed drawings! 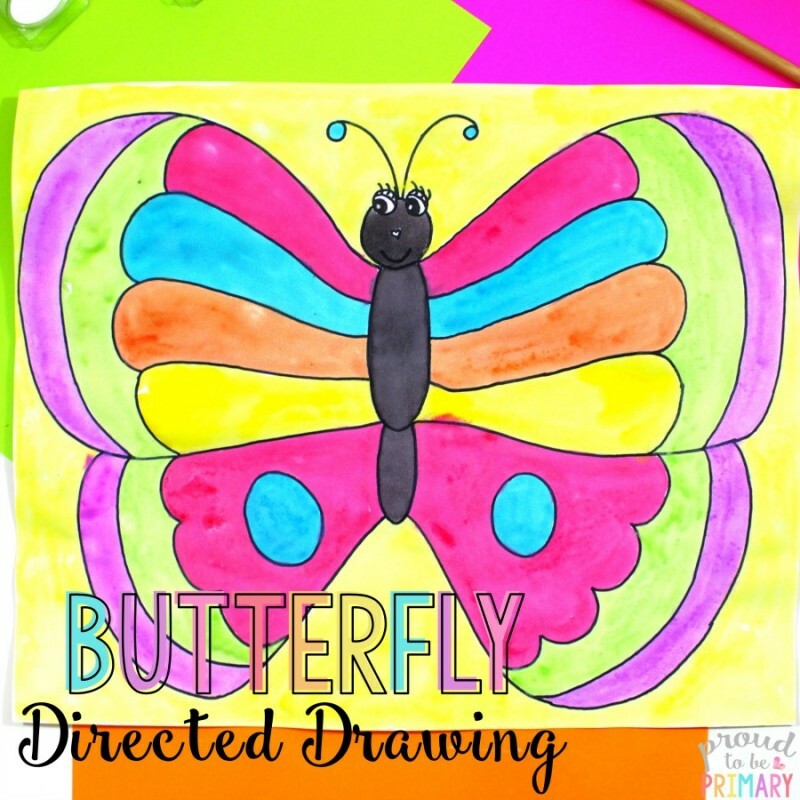 This spring butterfly directed drawing creates a beautiful result and perfect for your spring lessons. When teaching this art lesson to a class I recommend standing front and center and using a large easel and chart paper to draw on. Students can sit at their desks with their supplies. I take things slow and draw each step and give each instruction one at a time. I give my students plenty of time to follow along and ask questions. You will have the most success if you model the lesson this way and take your time. 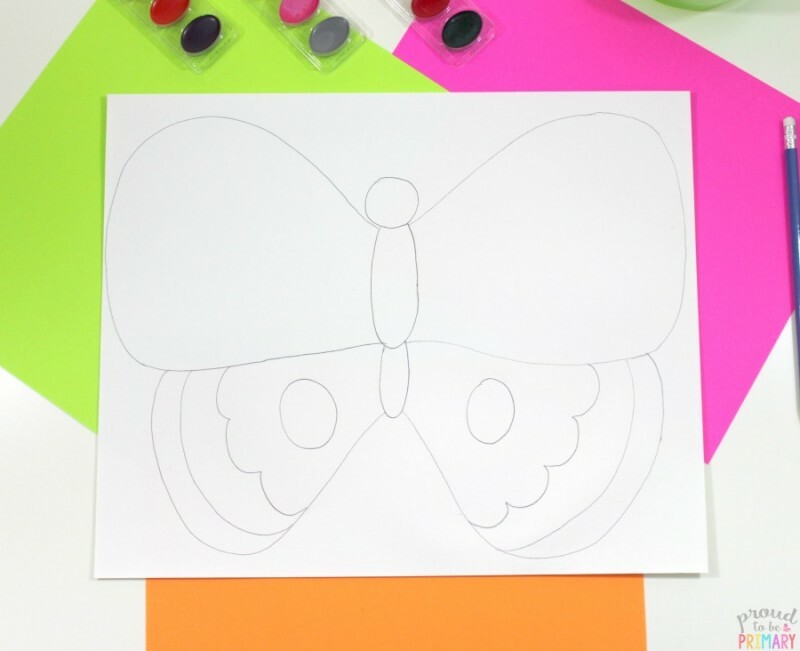 Below are all the steps for how to draw a butterfly. Place a large white piece of art paper in landscape orientation. Starting in the middle of the page draw a small circle. Add an oval going down from the circle and another smaller oval from the bottom. This is the 3 parts of a butterflies’ body (head, thorax, and abdomen). To draw large upper wings, start on one side first and then the other. 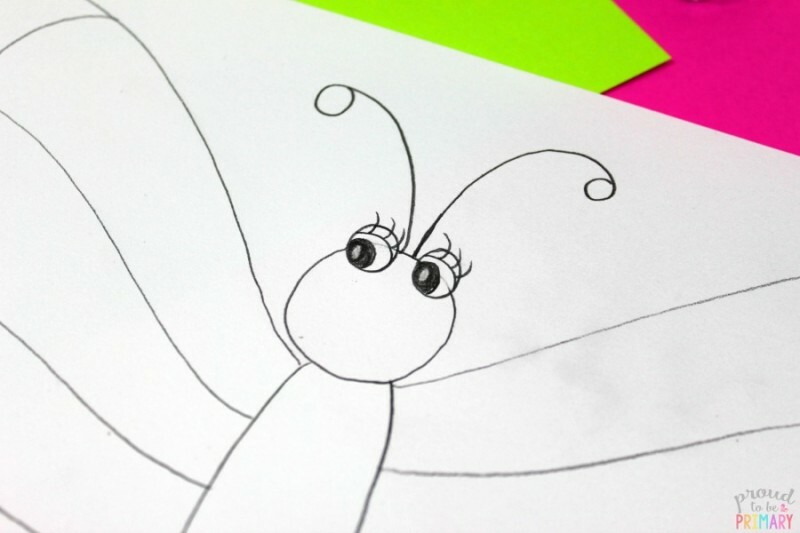 Draw a curved wing shape starting below the head up, around, and then connect it at the bottom of the thorax (middle body). Repeat on the other side. 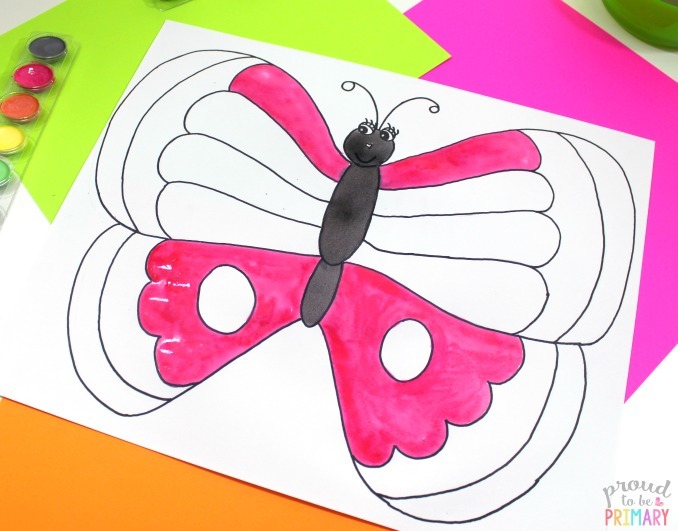 To create the smaller lower wings, start at the outer corner of the top wing and draw a curved wing shape down and back up connecting with the bottom of the abdomen (lower body). Repeat on the other side. Now add the designs to the butterfly’s wings. You can let children to get creative here and give them some examples or they can follow the steps. Start by drawing a curved line along the inside of each lower wing. Follow that with a scalloped line inside. Finish with a circle in the center of the leftover space. For the upper wings, start again with a curved line inside of each upper wing. Follow that with a scalloped line inside that. Draw a curved line from each inner point of the scalloped line to the thorax (upper body). Repeat on both sides. Draw 2 antennae from the center of the head going out in different directions. Draw a swirl or circle at the end. Adding details to the face is optional and would not take away any beauty if left blank. To add the details for the eyes, draw two circles at the top of the head. Draw small curves at the top for eyelids. Add 3 small eyelashes. Draw and color in pupils, leaving a small spot of white in each eye. Add a small smile and a tiny heart-shaped nose, if you wish. 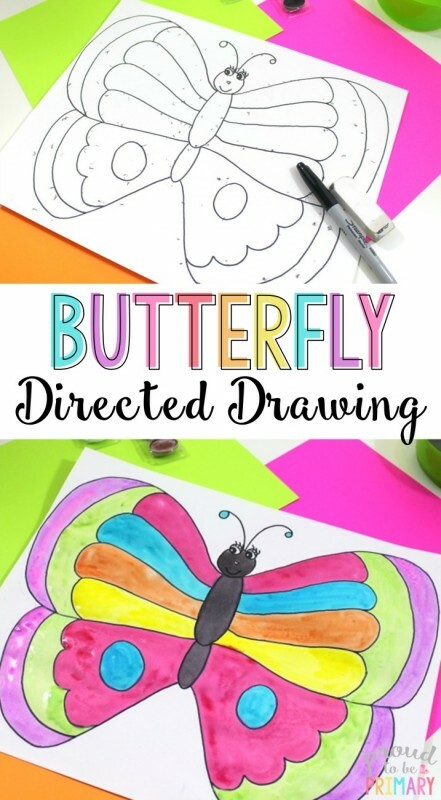 Use a fine point black marker or Sharpie pen to trace all the lines of your spring butterfly directed drawing. Erase the pencil lines with a good white eraser. 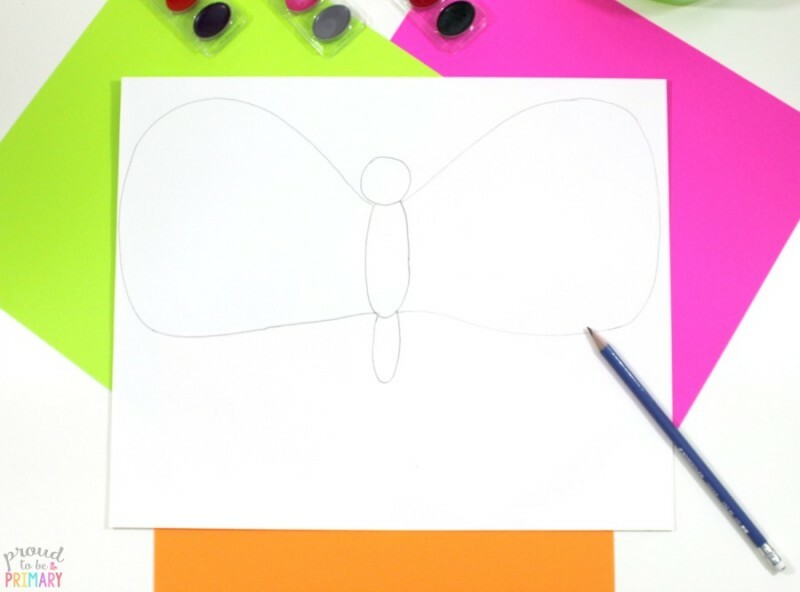 Use watercolour paints to paint the body of the butterfly first, starting in the center and working your way outward. I used black for the entire body, being careful to not let it run anywhere or in the eyes. 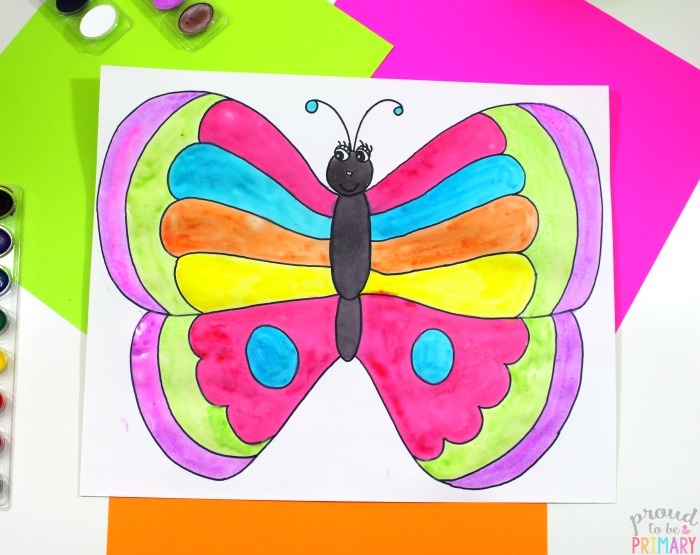 Paint different parts of the butterfly’s wings in different bright colours (yellow, pink, green, blue, purple). Use one colour completely before moving on to the next colour. You could continue to paint the background a different colour or leave it as is. The butterfly really pops when left against a white background. 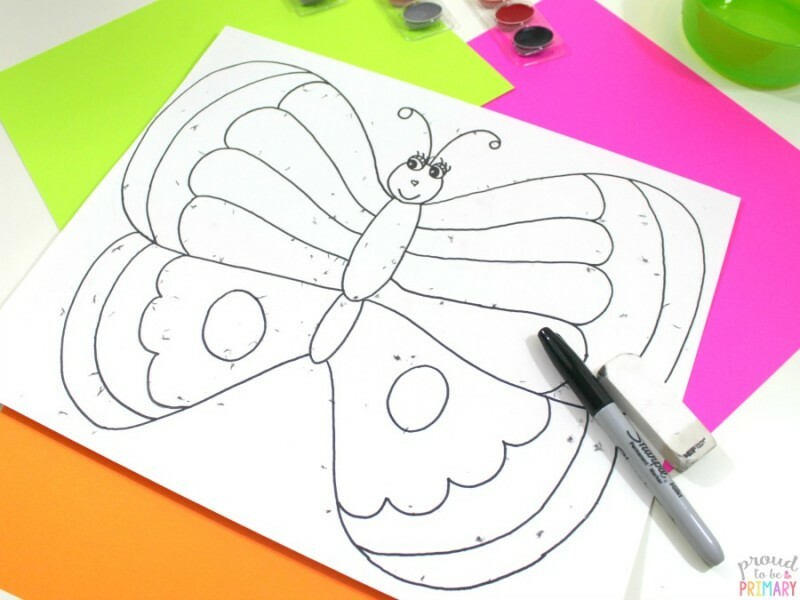 You could also cut the butterflies out and glue onto construction or other special paper. 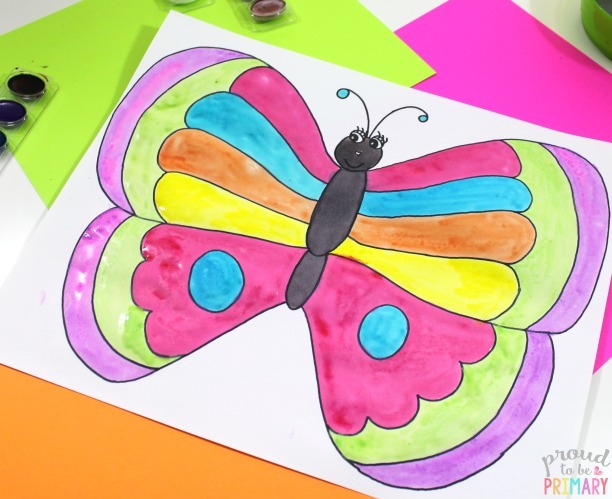 Once everyone completes their spring butterfly directed drawing, they place them somewhere to dry completely. Don’t make the mistake to hang them or place them upright. Paint and water would drip down onto the butterflies. 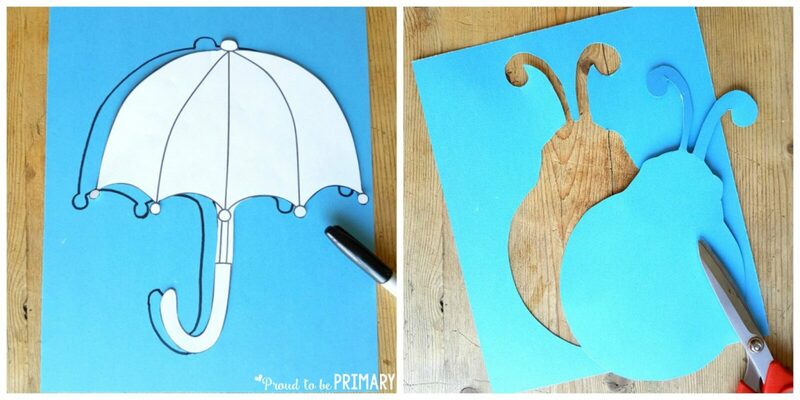 Once dry, I recommend hanging them up or creating a fun bulletin board display for spring. You can download and print the instructions for how to draw a butterfly to use in your classroom during your art lesson HERE. Do you LOVE directed drawings as much as I do? 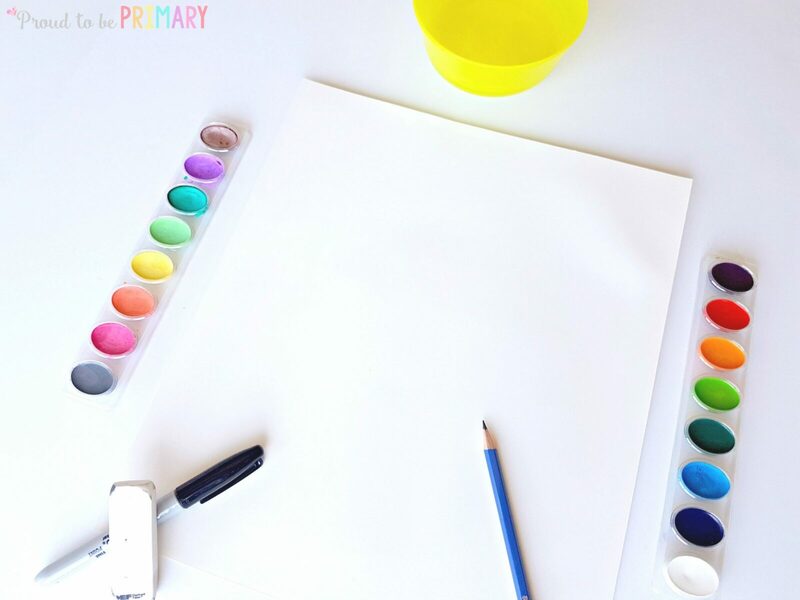 You must check out these popular posts with FREE directions for your next art lesson. 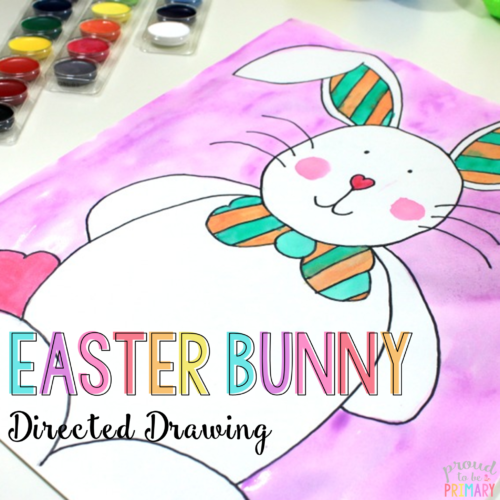 This Easter Bunny directed drawing is adorably cute and perfect for your Easter lessons and celebration. 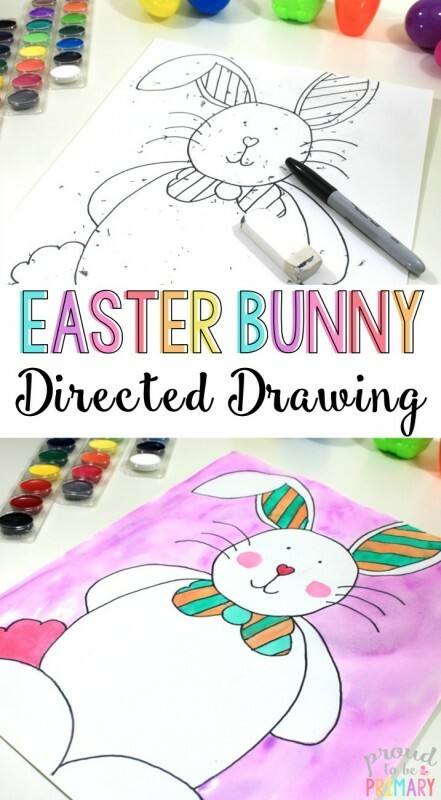 The Easter holiday is always an exciting time for children, and what better way to redirect their excitement than to provide this activity? This Easter Bunny directed drawing can be adapted for any primary classroom or completed at home with a few simple materials. 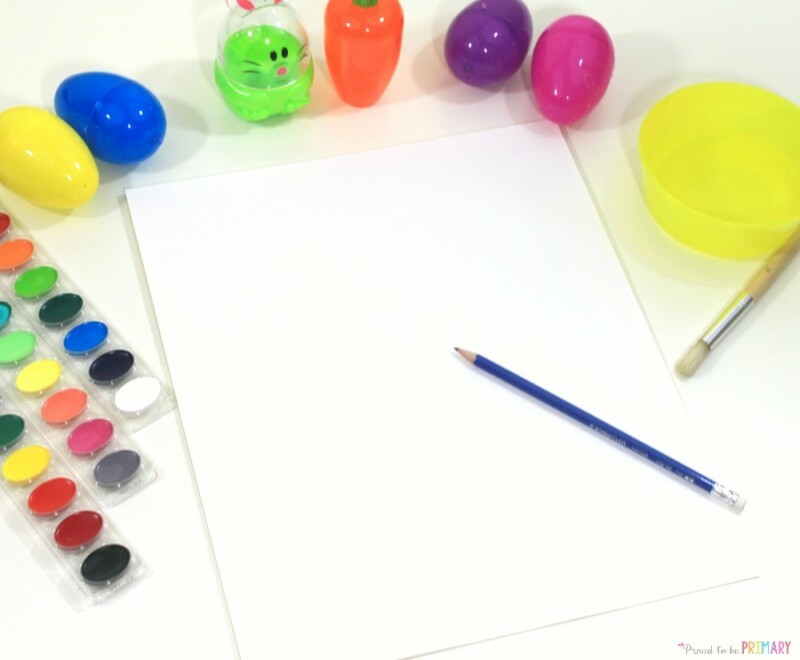 You will need white art paper, pencils, erasers, fine black markers or Sharpie pens, and watercolor paints. I recommend proper paper meant for art because it can handle the water and paint and shouldn’t tear the paper if used properly. 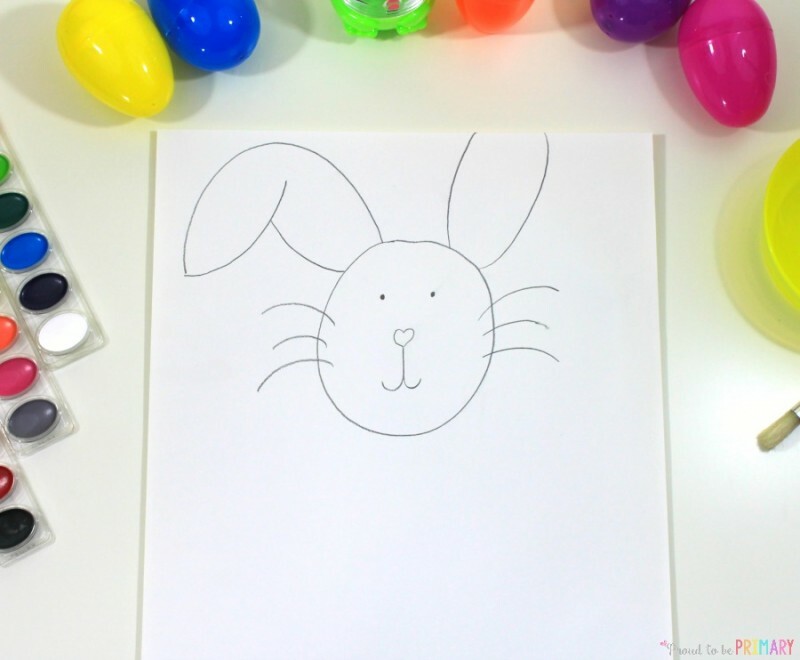 Below are all the steps for how to draw an Easter Bunny. 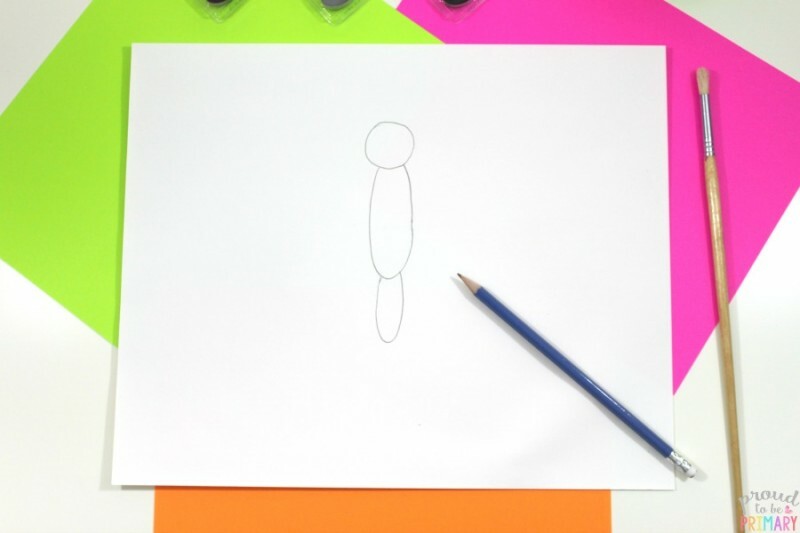 Place a large white piece of art paper in portrait orientation. Starting in the upper part of the page draw a medium sized circle for the head. Add two black dots for eyes. Draw a small heart shape in the center for the nose and a forward and backward ‘J’ shape coming down from the nose as the mouth. Add three whiskers coming off of both sides of the face, leaving room for painting on cheeks later. For one ear, draw two curved lines going up from the head to the top to look like they would go off the page. For the other ear, draw an arch from the head up to the left. Draw a line from the left point up to the right and a line up from the head to connect. At the bottom of the page, draw two curved arches from the center going out towards the sides for the paws. Add two small lines on the end of each paw for the toes. Draw two curved lines down from under the head on each side connecting with the paws for the body. Draw two more smaller curved lines down from under the head on each side connecting with body midway down for the arms. Now it is time to add details. Add a cloud shape connecting from the side of the lower body to the paw for a fluffy tail. Under the bunny’s chin, add a bow tie shape. 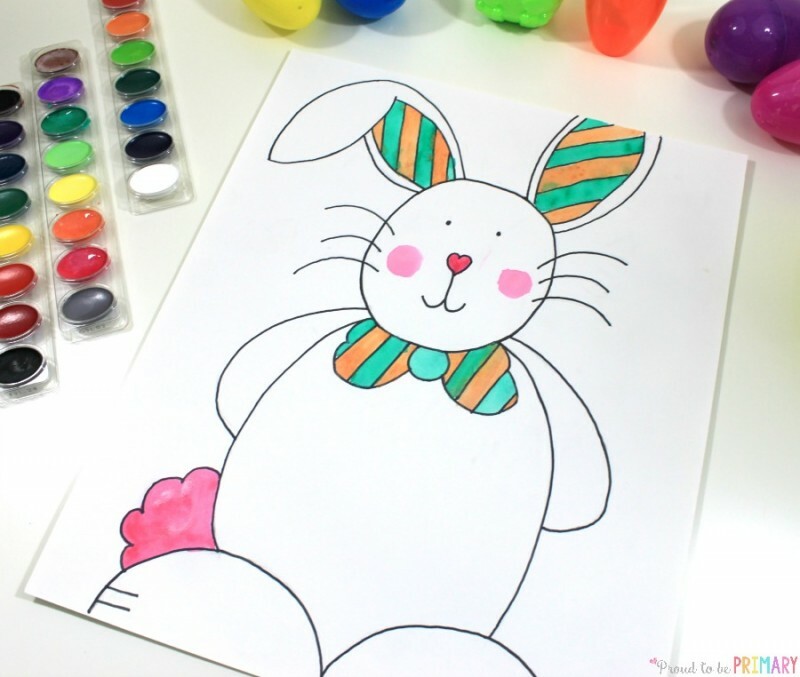 Add two lines inside each of the bunny’s ears to create an inner ear area. Add a pattern design inside the details. Stripes are used in the example. 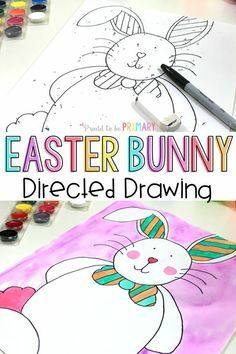 You can get creative with the details here and allow your students to draw their own details from a few ideas that you share with them (draw an egg, low necktie, or basket). Let them choose the pattern for inside the ears and on the bowtie or egg they draw. Patterns like polka dots, stripes, and zig-zags would look great! 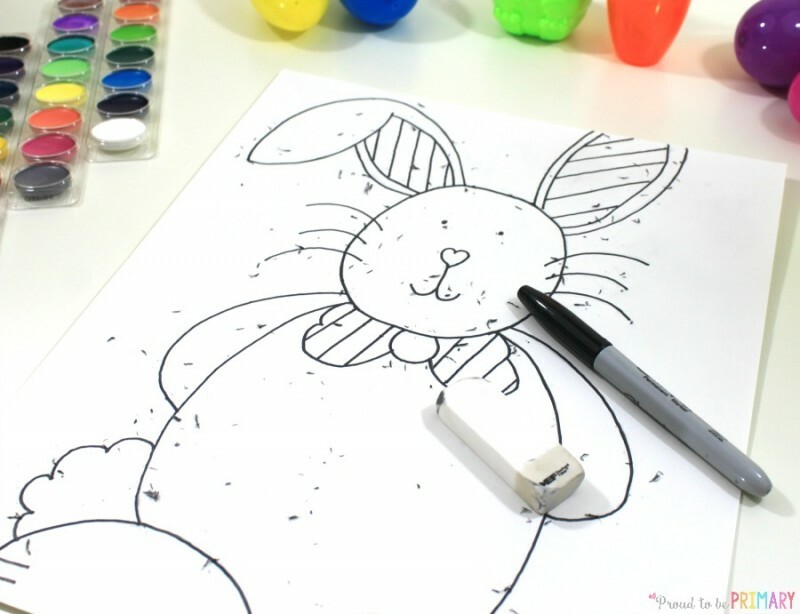 Use a fine point black marker or Sharpie pen to trace all the lines of your Easter Bunny. Erase the pencil lines with a good white eraser. 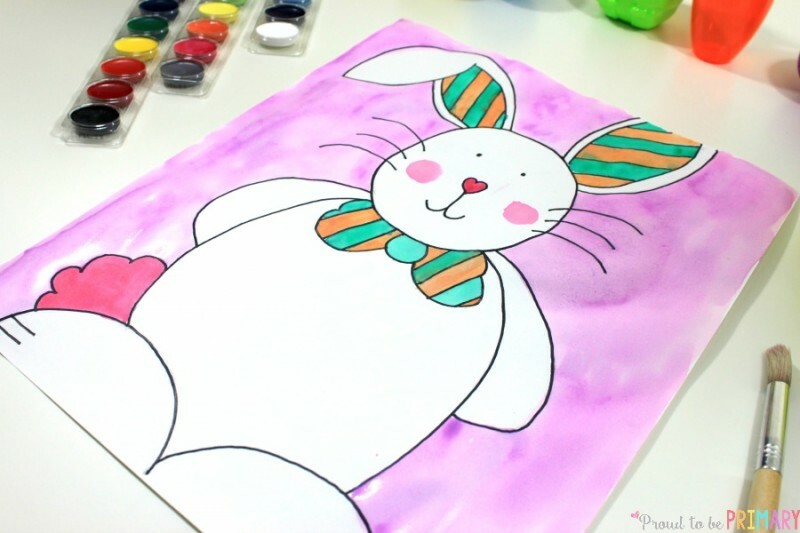 Use watercolour paints to paint the details of the bunny first, starting in the center and working your way outward. Add two pink cheeks as well. Remember to leave the Easter Bunny’s body white. 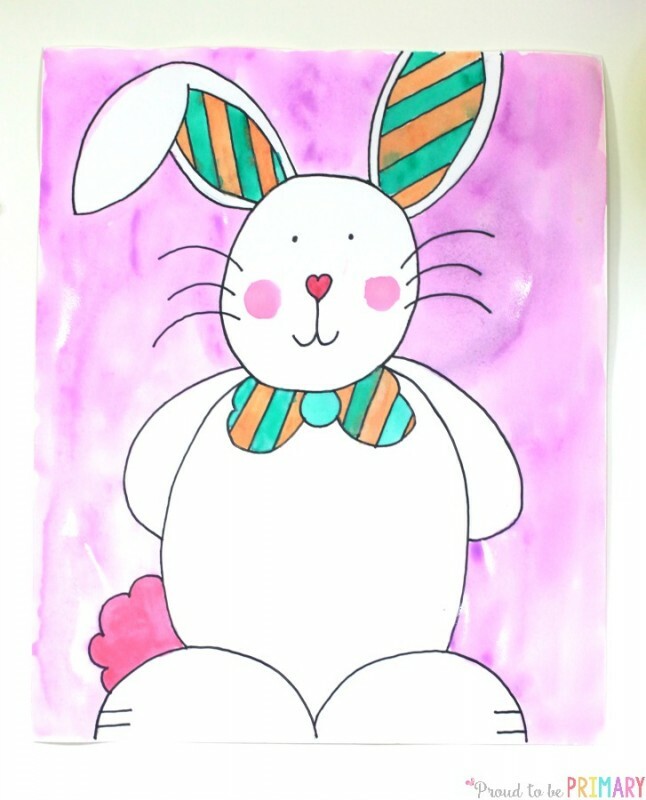 Paint the background behind the Easter bunny in a bright colour like yellow, purple, pink, or another spring colour. 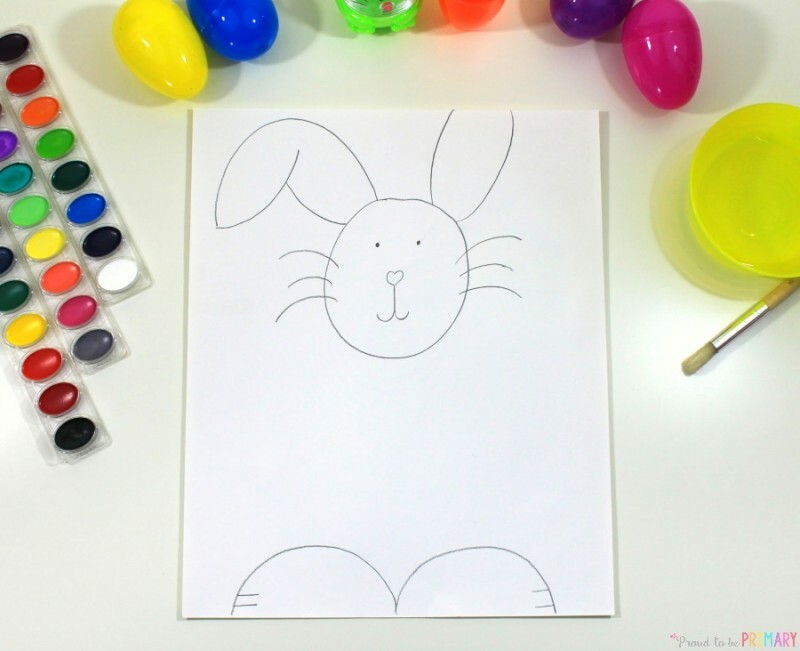 These colours will make your Easter Bunny really pop from the page and look great as a display! 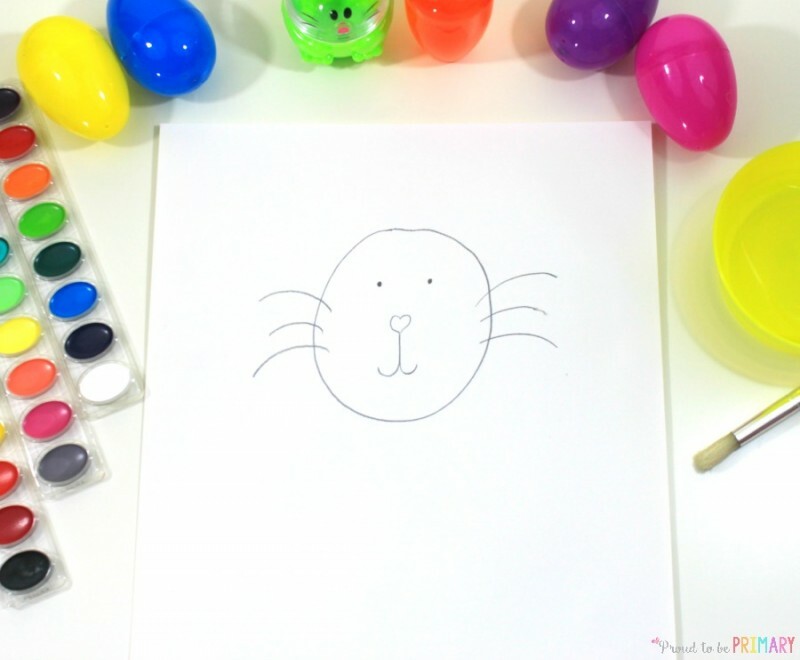 Once everyone completes their Easter Bunny directed drawing, place them somewhere to dry completely. Don’t make the mistake to hang them or place them upright. Paint and water would drip down onto the snowman. Once dry, I recommend hanging them up or creating a fun bulletin board display for Easter. 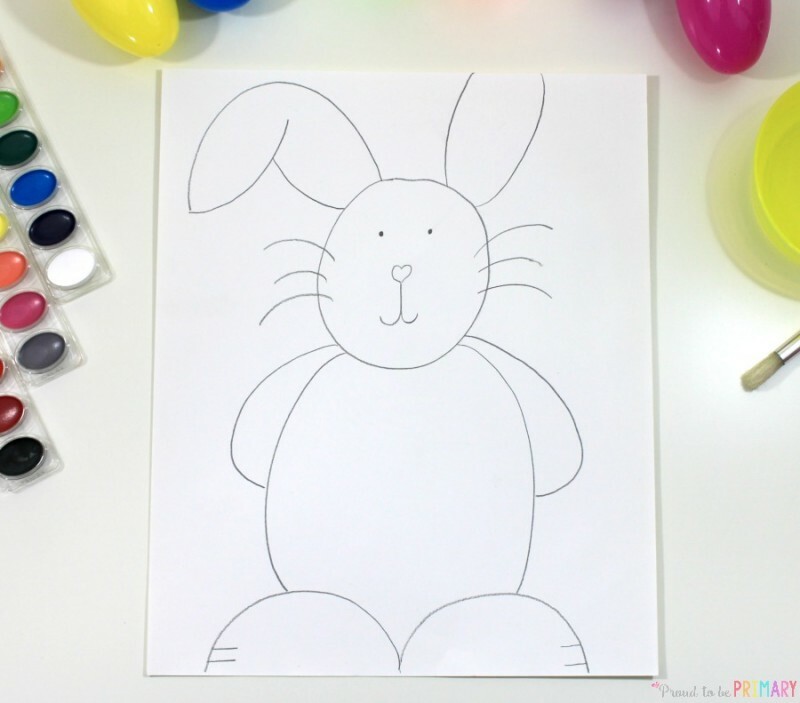 You can download and print the instructions for how to draw an Easter Bunny to use in your classroom during your art lesson HERE. 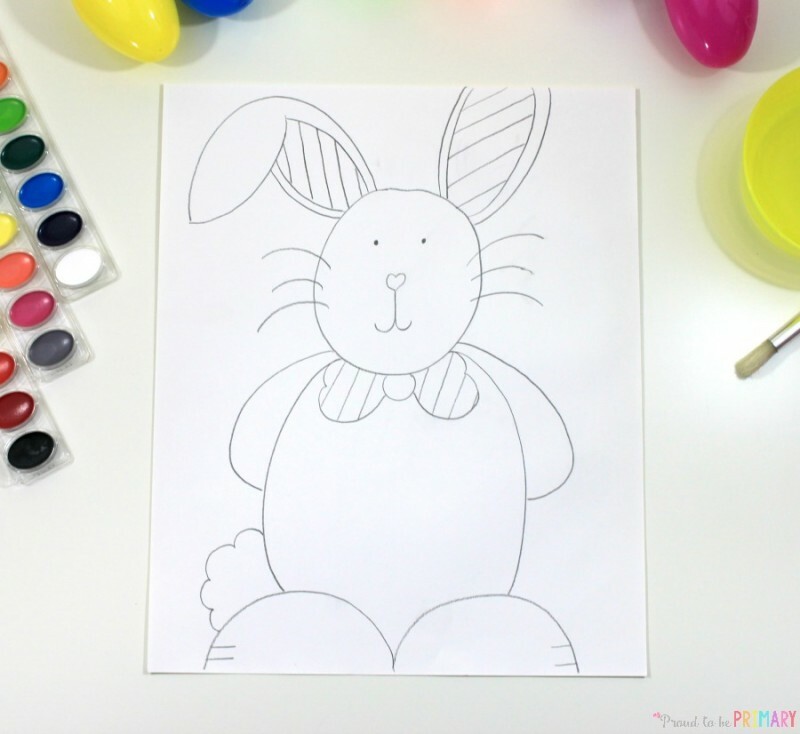 Enjoyed learning how to draw an Easter Bunny? 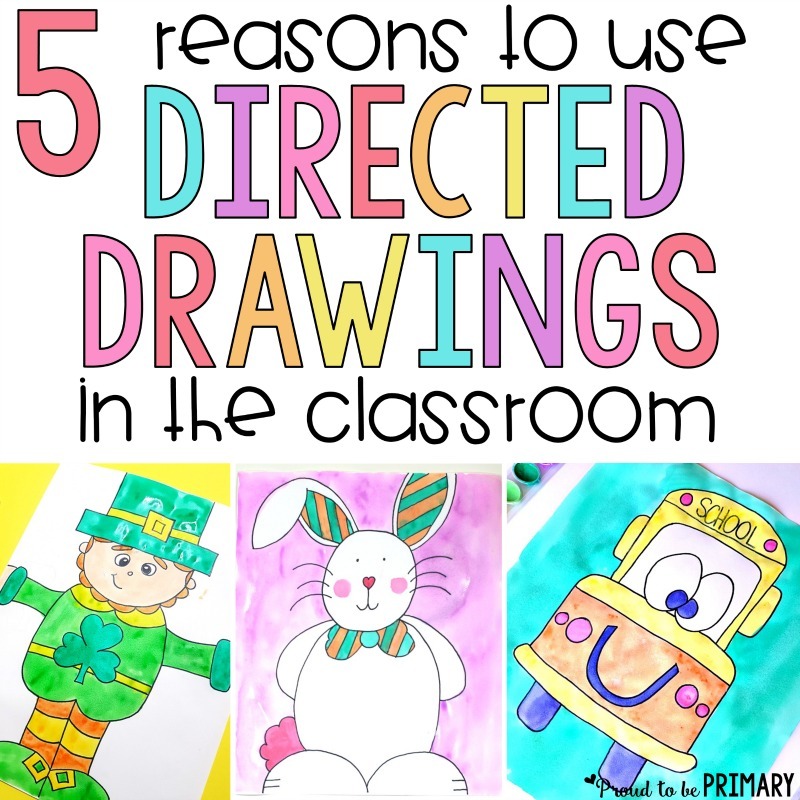 Looking for more directed drawing resources?